Trip around the world on the Queen Victoria from January 15 – April 21, 2017. 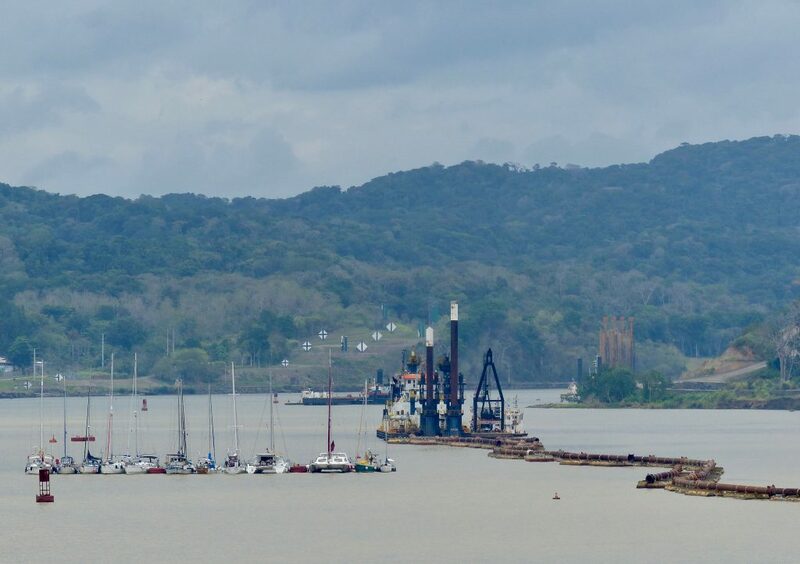 After leaving the Panama Canal we headed southeast towards Aruba and docked in the capital city of Orajestand. 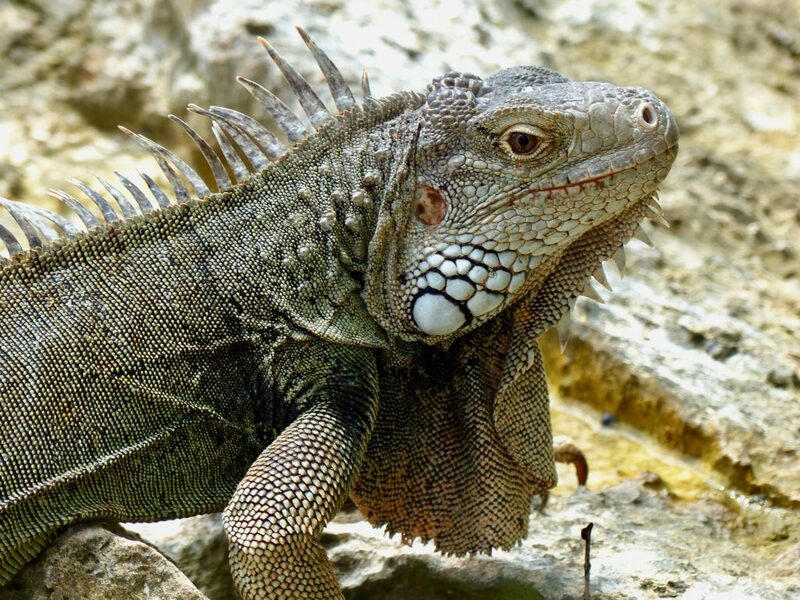 Aruba is only 18 miles north of Venezuela, and geologists believe it was attached to South America before breaking free millions of years ago. It is really dry here, unlike most of the Caribbean. They get less then 20 inches of rain a year and the landscape is strewn with cactus. The first inhabitants were the Caquetio Amerindians. They migrated from Venezuela to escape attacks by the Carib Tribes around 1,000 AD. Sea currents and the ceaseless trade winds coming from the east made canoe travel to other Caribbean Islands nearly impossible, so they stayed put. 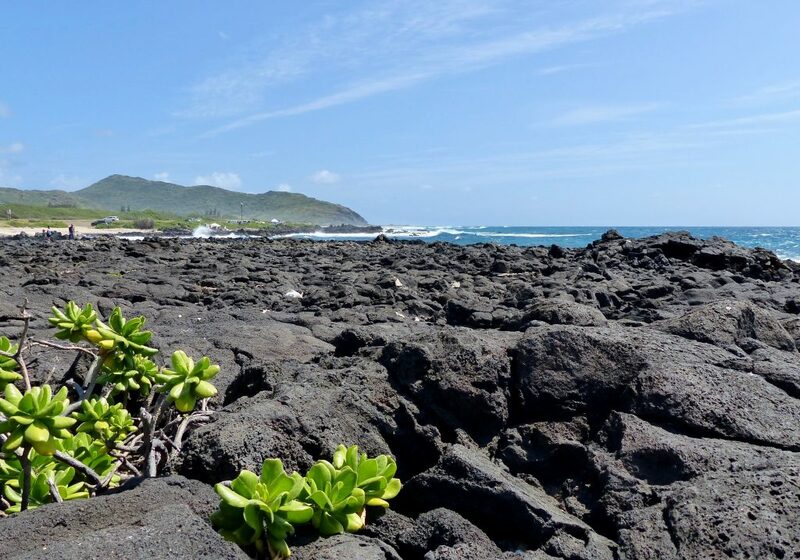 In 1499, Spanish explorers arrived, and started populating the island soon after. They called it an “island of giants”, because the natives were much larger then the Europeans of the day. Because it barely rains, plantations were never developed, and there was no need for slaves. 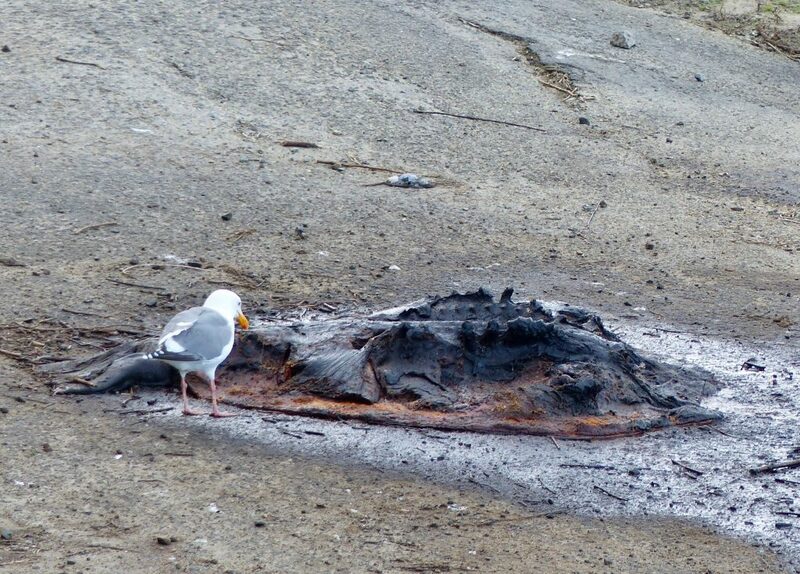 The natives lucked out on that one. In 1626, The Netherlands acquired the island. This climate is good for tourism because visitors can reliably expect hot, sunny weather. The island is 20 miles long and 6 miles wide. There are 102,000 inhabitants and it gained full independence in 1996. Most importantly, the island lies outside of “Hurricane Alley”, which is a huge selling point for the local real estate agents. I was not in the market for diamonds, gold, or botox injections, and sautéing on the beach is not high on my list. There are no archeological sites, cultural experiences, or interesting geological formations either. There used to be a “rock bridge” that would have been worth checking out, but it collapsed in 2005. It was fascinating to watch the local merchants coax customers into their lairs by holding signs that said FREE at the front door. Once inside, they were never seen again. Other then observing this modern anthropological behavior, Aruba did not hold much interest for me. 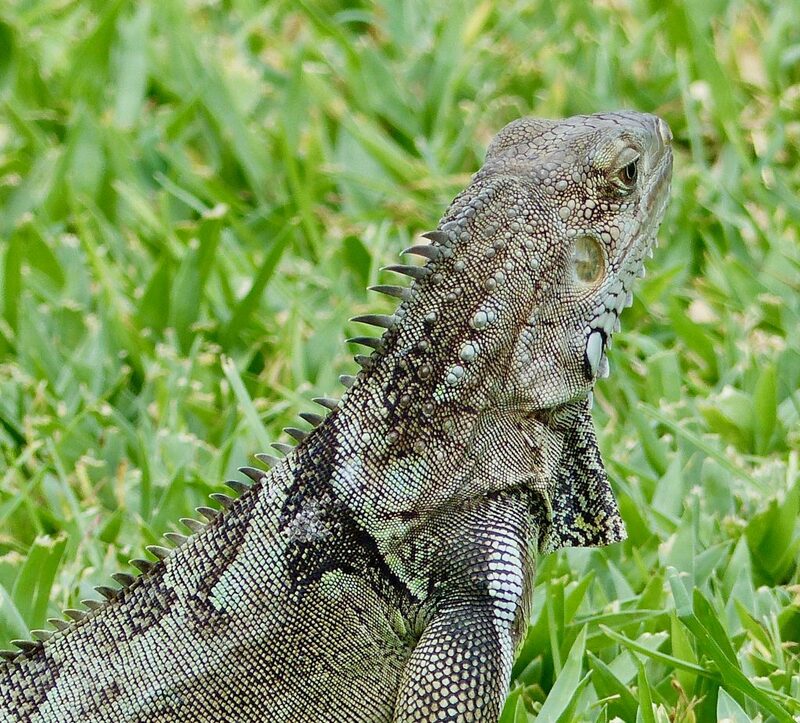 I had trouble finding any photo opportunities until Steve spotted some resplendent iguanas hanging out in a small grove of trees by the water. They were all about 3 feet long. Check out the row of spines on their backs. Each pattern is unique, like fingerprints. 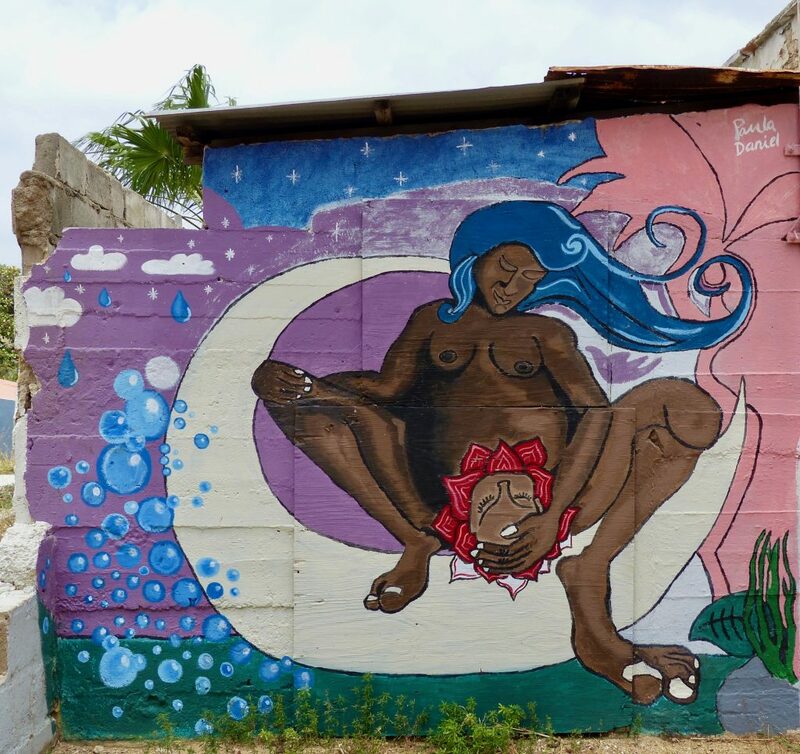 We wandered a few blocks from the dazzling shopping district and into a quiet neighborhood where we spotted this soulful mural on the crumbling wall of a burned out home. Is it “out of place” or in the “perfect place”? I enjoyed chewing on that question as we headed back to the ship. We enjoyed another day at sea before arriving in George Town, the capital of the Cayman Islands on Grand Cayman. This is the final port of our amazing journey. We have been at sea for 93 days. The three Cayman Islands are a British Overseas Territory in the western Caribbean Sea. Grand Cayman is 272 miles south of Cuba. The population is 60,000. There are no archaeological traces of any indigenous people ever living here, which I found very odd. But, the island is completely flat, so it would have been tough to spot from a canoe at any distance. It is 22 miles long and 8 miles wide. It remained largely uninhabited until the 1600’s when a hodgepodge of pirates, shipwrecked sailors, and deserters from Oliver Cromwell’s army in Jamaica made temporary homes here. 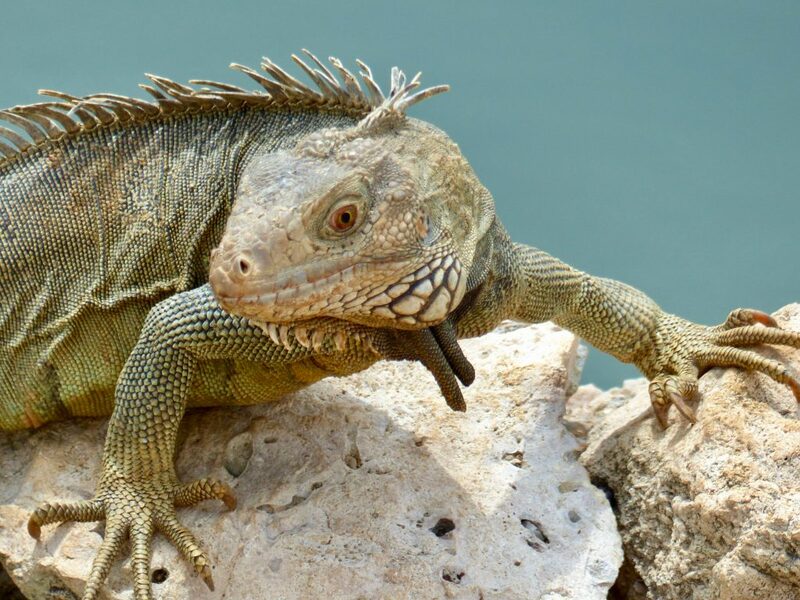 England took formal control of the Cayman Islands, along with Jamaica, as a result of the Treaty of Madrid in 1670. Although the first permanent settlement was not until 1730. With settlement, came the need for slaves, and many were brought from Africa. The first census taken in 1802 showed 933 residents on Grand Cayman; 545 were slaves. When slavery was abolished here in 1833, there were 950 Blacks of African ancestry enslaved by 116 white families of English ancestry. The Caymans have historically been a tax-exempt destination. In 1794, the locals rescued the crews of ten British merchant ships, who struck a reef and ran aground in rough seas. The incident is known as the Wreck of the Ten Sails. One of the ships carried a member of the royal family. Legend says that King George III rewarded the island with a promise never to introduce taxes as compensation for their generosity. While this remains a popular legend, the story is not true. In practice, the government has never levied an income tax, capital gains tax, or wealth tax, making it a popular haven for the filthy rich from around the world. There are hundreds of banks, investment firms, and insurance companies based here that drive the economy. 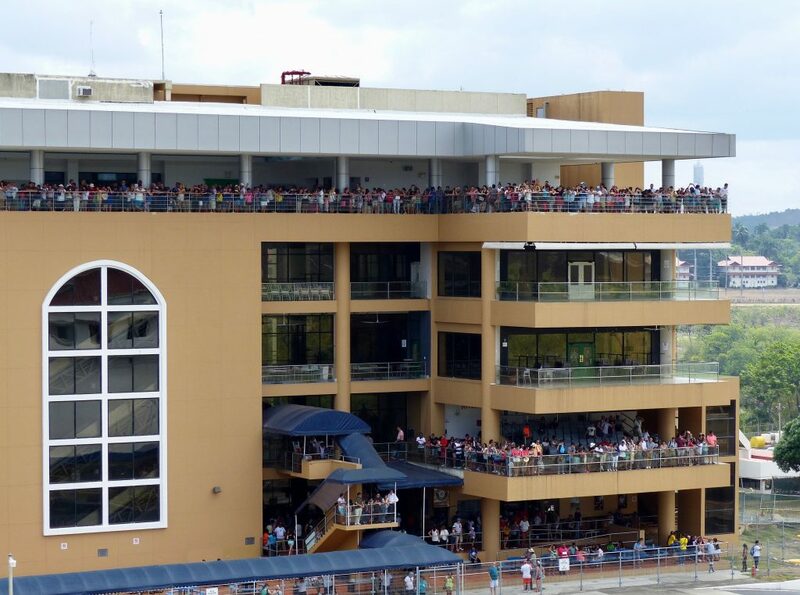 There were two other large cruise ships in port with us, so 12,000 people were jockeying for sidewalk space on the shady side of the street in George Town. It was super hot and humid. And, other then drinking champagne with a banker or shopping for diamonds there was not much to do in town. We considered going for a stroll on a beach, but the skies turned ominous and a biblical rain started and never let up. So much rain, that it flooded the decks of Queen Victoria and the elevators had to be shut down for several hours due to water accumulation in the shafts. I’m glad I didn’t know about the disturbing leakage problems until the end of the trip. Before the skies opened up, “eagle eye” Steve spotting my ONE photo opportunity hidden in the high branches of a Breadfruit tree. 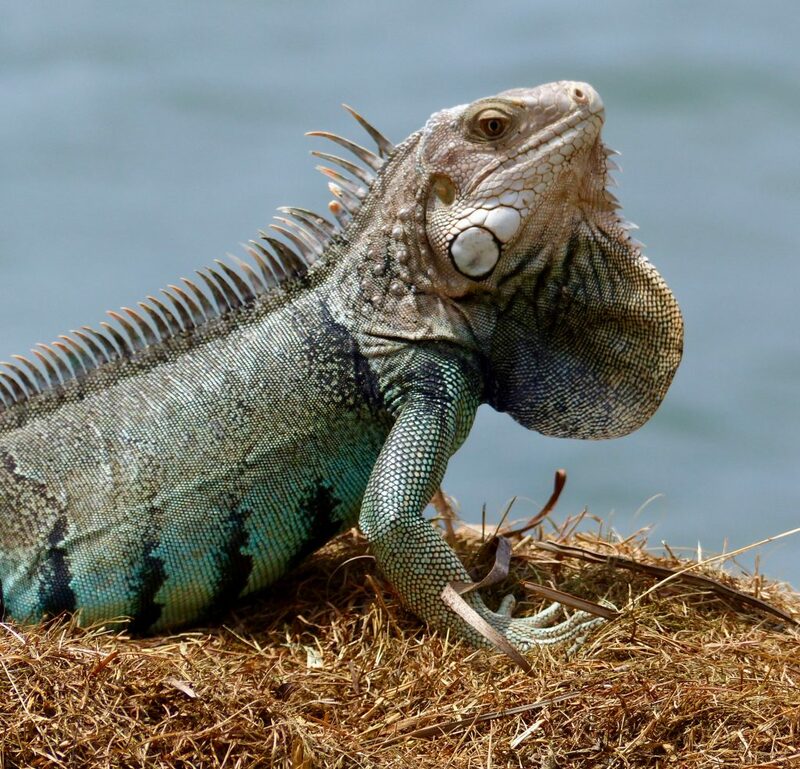 A rare blue iguana, that started to change color right before our eyes! Amazing! I couldn’t wait for the complete transformation, because he was on the move and a nearby lighting strike got us moving too. My last photo ends up being my favorite wildlife shot. That’s kismet. We will be back home in two days. I hope you have enjoyed our incredible journey. I would love to hear your thoughts and impressions. What was your favorite port? Cheers everyone, and thank you for reading! After leaving Antigua, we continued heading south in the Pacific Ocean and reached the entrance of the Panama Canal at dawn on the 15th. We are Canal virgins, and I hardly slept a wink the night before in anticipation of this grand event! Queen Victoria had an appointment which was made 2 years ago. Without one, the wait can be up to 10 days. If a ship misses its appointment, they get thrown to the back of the queue. We smugly passed 41 ships at anchor and headed to the front of the line. 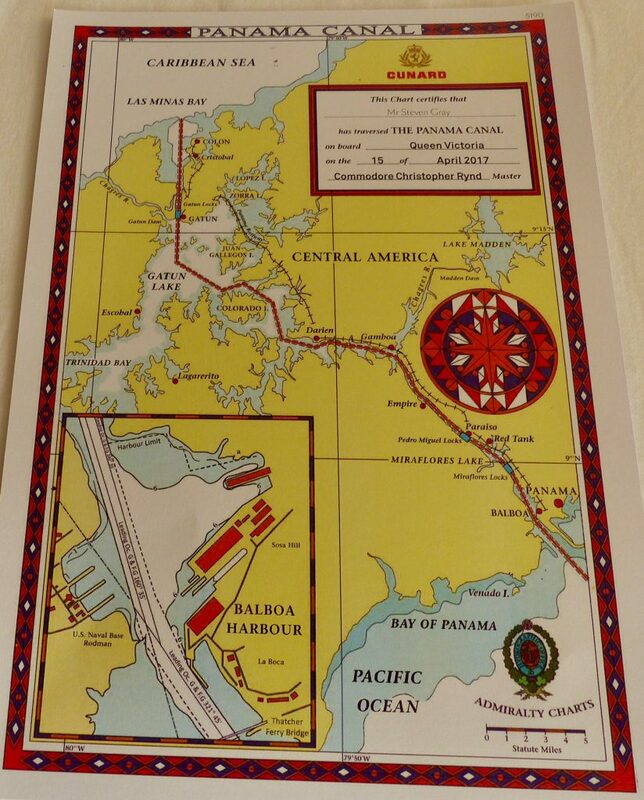 The Panama Canal is an artificial 48-mile waterway that connects the Atlantic and Pacific Oceans. 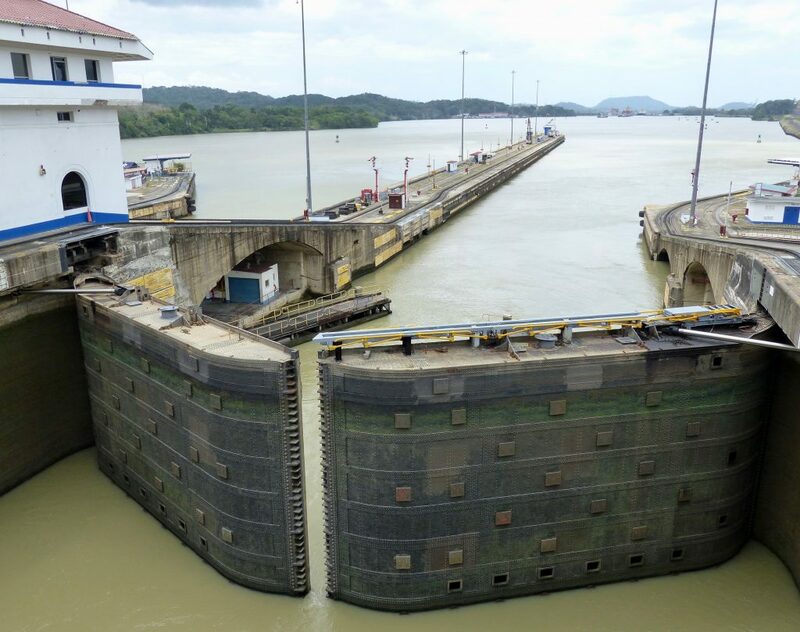 The canal cuts across the narrowest part of Panama and there are a series of locks at each end. 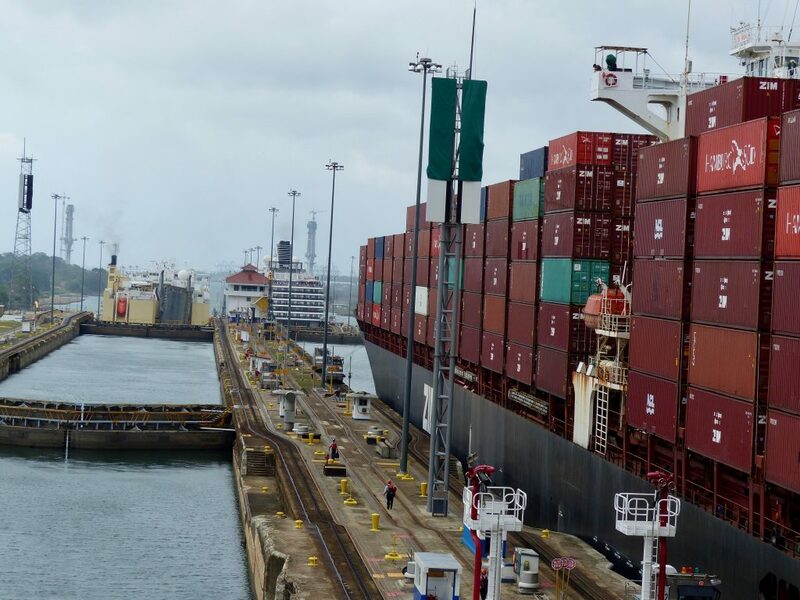 From the Pacific side, 3 separate locks lift ships up to the height of Gatun Lake, a manmade body of water created by damming up the Charges River. The lake is 85 feet above sea level and covers 185 square miles. On the Atlantic side of the lake, 3 more locks drop the ships back down to sea level. The canal was completed in 1914 after 34 grueling years. The French made the first attempt starting in 1881, but went bankrupt in 1889 after spending $287 million US Dollars (multiple billions in today’s money) and only finished 40%. During that 9 year period, 22,000 men lost their lives. That’s 47 men a week! The men were totally unprepared for the rainy season, when the Chagres River, where the canal started, became a raging torrent, rising up to 35 feet. The dense jungle was loaded with venomous snakes, insects and spiders, but the biggest killers were yellow fever and malaria. Public health measures didn’t exist because the role of the mosquito as a disease transmitter was then unknown. The appalling conditions were downplayed in France to avoid recruitment problems, but the high mortality rate made it difficult to maintain an experienced workforce. The bankruptcy wiped out the savings of over 800,000 investors. The United States spent $375 million to complete the job. 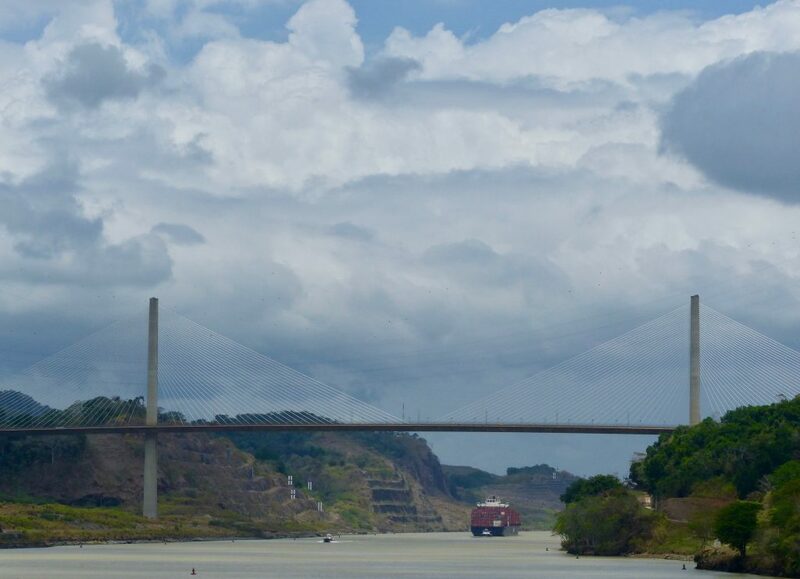 So why was the Panama Canal built in the first place? I’ll use a “no brainer” example. Before the Canal, a ship traveling to the west coast of the United States from Europe had to sail to the bottom of South America, past Argentina, “round the Horn”, come back up the other side, pass Chile, and continue up the coast. Cape Horn, where the Atlantic and Pacific Oceans meet, is well established as a treacherous stretch of water. 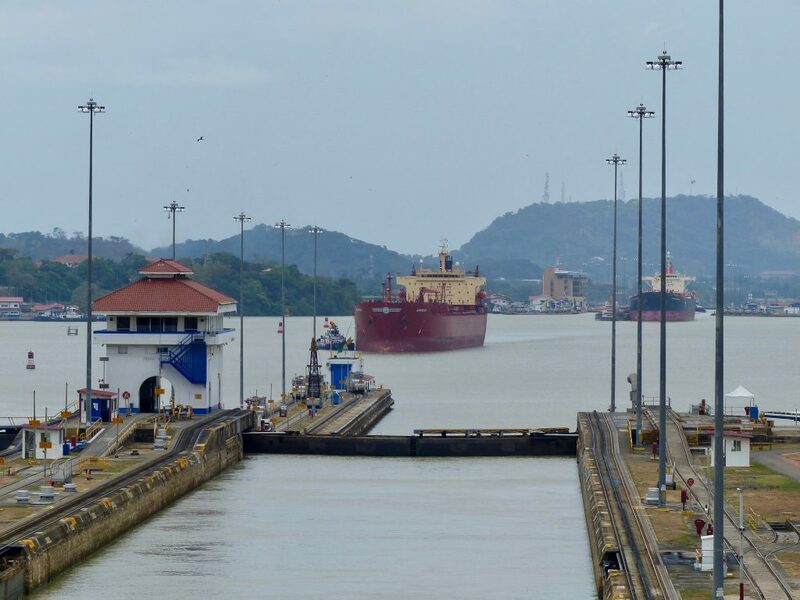 After the Panama Canal opened, it knocked off an average of 8,000 miles and 3 weeks of travel time. That’s huge. And, think of the fuel savings on top of that. To date, over one million ships have made the transit! 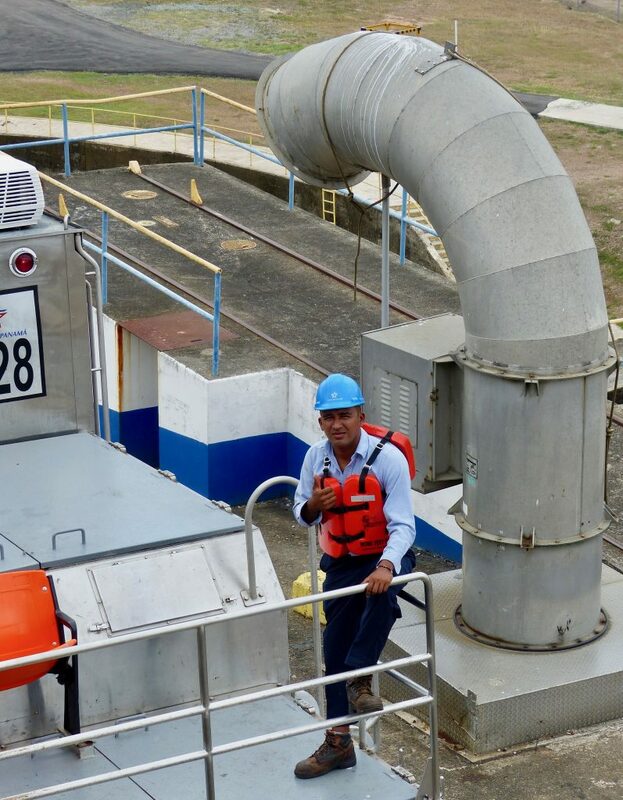 We went through the original locks, which allows ships with a maximum width of 106.9 feet. Queen Victoria is 106.0 feet wide. That’s cutting it a bit close. 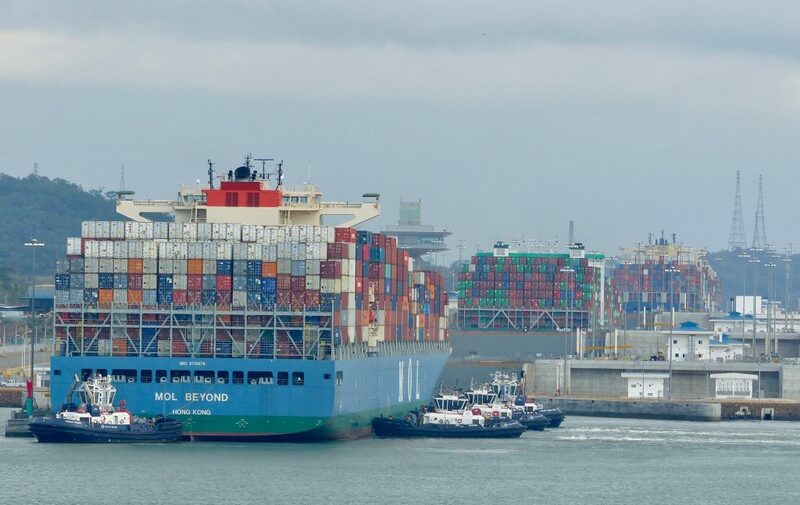 In 2006 it was anticipated that by 2011, 37% of the world’s container ships would be too large for the present Canal, and a failure to expand would result in a significant loss of market share. So, after a 9 year construction job costing over $10 billion US Dollars, the “mega locks” were completed in June 2016. Now, every ship in the world can transit here. Here are the 3 new locks on the Pacific Side, with a mega container ship in each one. It was quite a sight. Ready for this? It cost Queen Victoria $497,000 US Dollars to transit the Canal, in one direction. Payment for all ships is in cash only, at least 48 hours prior to transit, no exceptions. The cost for the “mega ships” to use the new locks can be over $900,000 US Dollars. Mind blowing! But… even more amazing, is that the Canal is still cheaper then the cost and time involved in “rounding the horn”, even at that price. It took us close to 10 hours to make the complete transit. 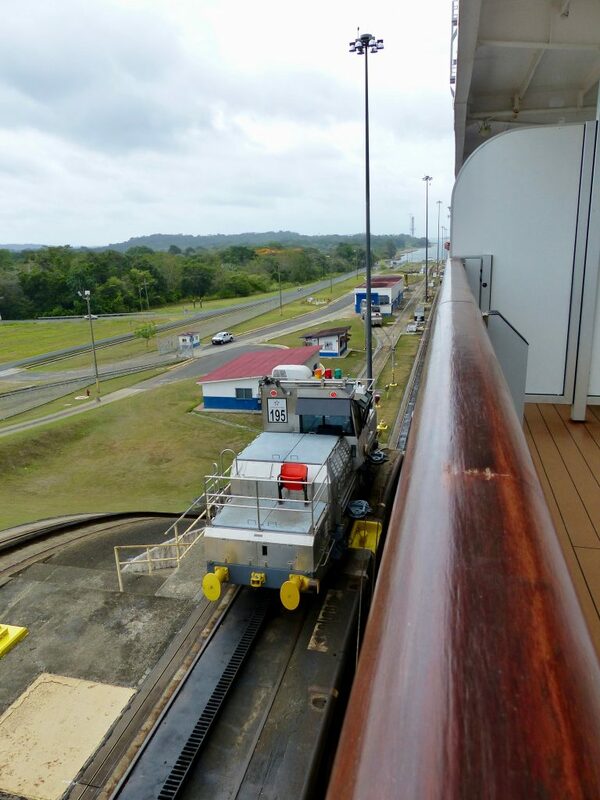 When we arrived at the first set of locks, the ship was guided in by tug boats. Then, we were hooked up to 8 locomotive “guides”, 4 on each side, connected to the ship by steel cables. They pulled us through to make sure we didn’t scrape the walls and ruin our paint job. 8 Locomotive Guides Attach to each Ship. 4 per side. 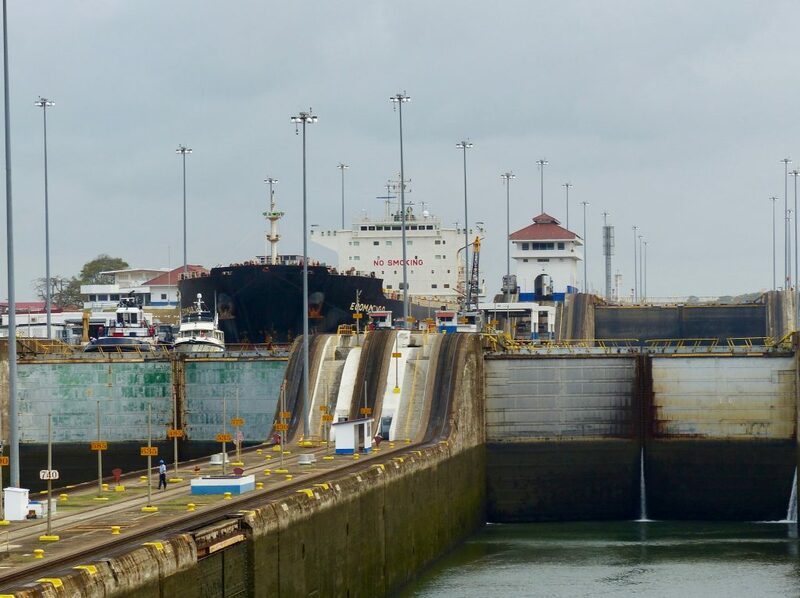 The first two locks on the Atlantic side raised us up by 27 feet each. The third lock was 31 feet. There were hundreds of people watching the ships from Visitor’s Center, which announces all the ships as they move through. 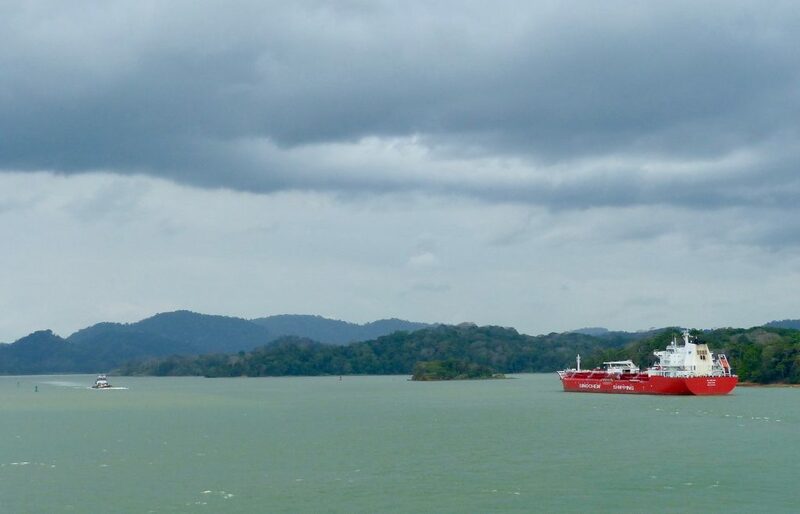 By the end, we were 85 feet above sea level, the same elevation as Gatun Lake. Watching Ships is a Spectator Sport! There were two oil tankers following us, here they are. Next, we cruised under the Centennial Bridge. 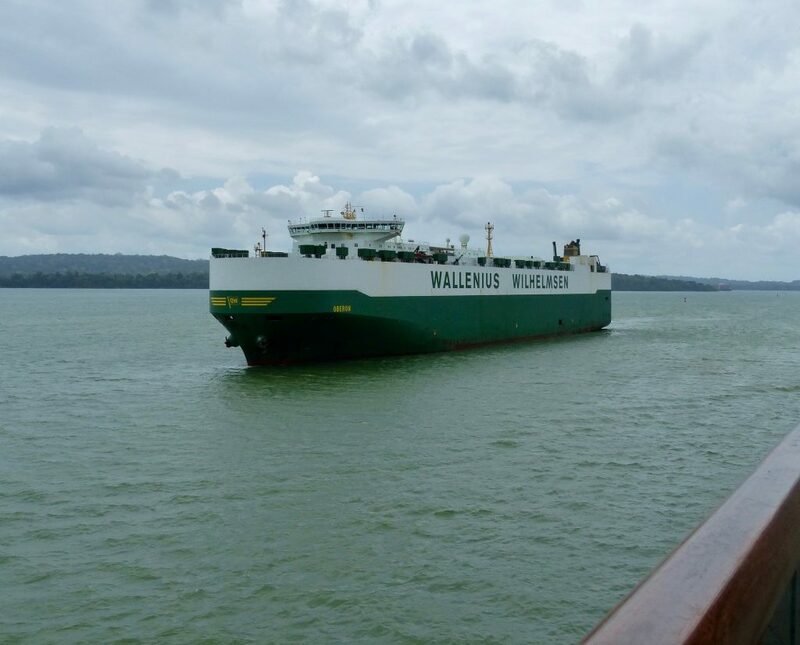 Between the locks on the Atlantic side and Lake Gatun, there is a narrow section called the Galliard Cut. During construction, the men had to chop through a mountain here. It was the toughest part of the construction process, because the steep walls kept caving in, creating deadly landslides. It is quite narrow and only allows for one way traffic. Once we hit the lake, other vessels passed by us, coming from the Atlantic. 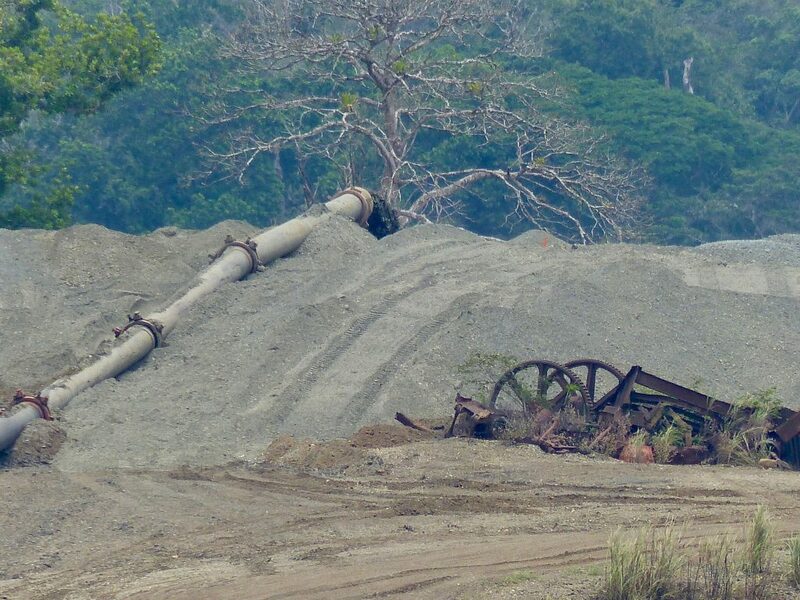 Dredging is constant in the Canal. Over 200 inches of rain falls here each year, so tons of silt pours into the waterways. The side walls collapse frequently due to erosion from flash floods. After passing through the lake, we reached the second set of 3 locks that would lower us back down to the level of the Atlantic Ocean. Here are the ships ahead of us in the locks. A car carrier is in our lane. A container ship and Norwegian cruise ship is in the other one. After we exited, I looked back to see one of the oil tankers who had been following us. Check out the two small boats in front of this massive ship. Pleasure crafts are always squeezed in with the big guys, when there is room. 2 Pleasure Craft Share 2nd Locks with Super Tanker! 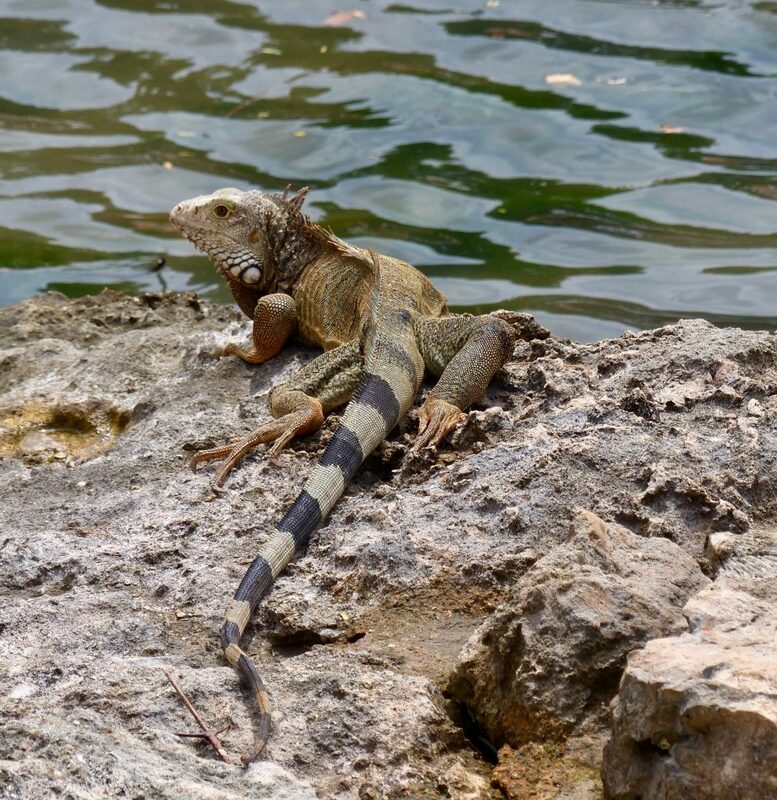 Steve had the binoculars trained on the jungle, and managed to spot this strange looking critter on the water’s edge. 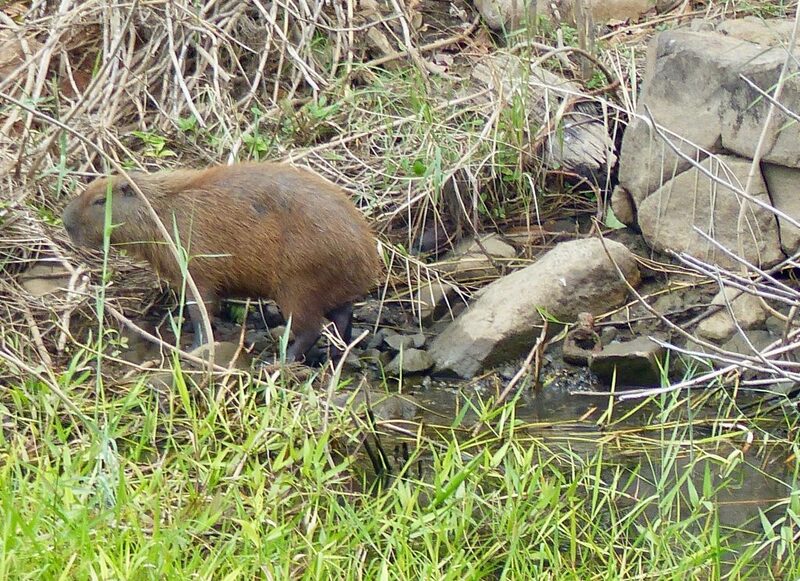 We later discovered that it is the largest rodent in the world, called a Capybara. They are closely related to the guinea pig and are not a threatened species. 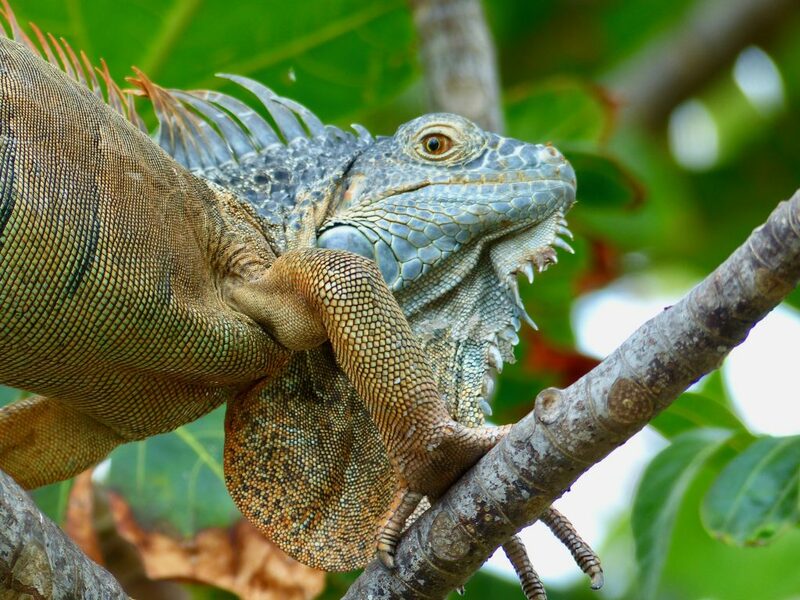 Adults males can reach 4.5 feet in length and weighs close to 200 pounds. It is a favorite food for large jungle cats and the abundant alligators that live here. It is also hunted by humans for its meat and hide. The grease from its thick fatty skin is used in cosmetics. Ladies, you may have some Capybara in your facial cream. Capybara – Largest Rodent on Earth! As we emerged into the Atlantic Ocean, which we hadn’t seen in over two months, the sun was setting over the field of ships waiting to reach the Pacific Ocean. This was a extraordinary day. I hope you enjoyed the transit as much as we did. 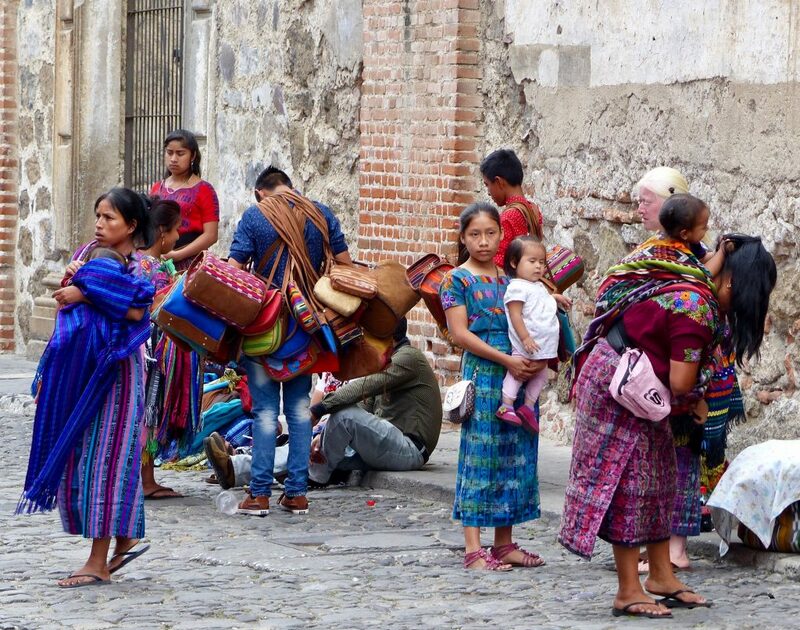 After leaving Cabo San Lucas in Mexico, we continued down the west coast of Central America and arrived at Port Quetzal in Guatemala. 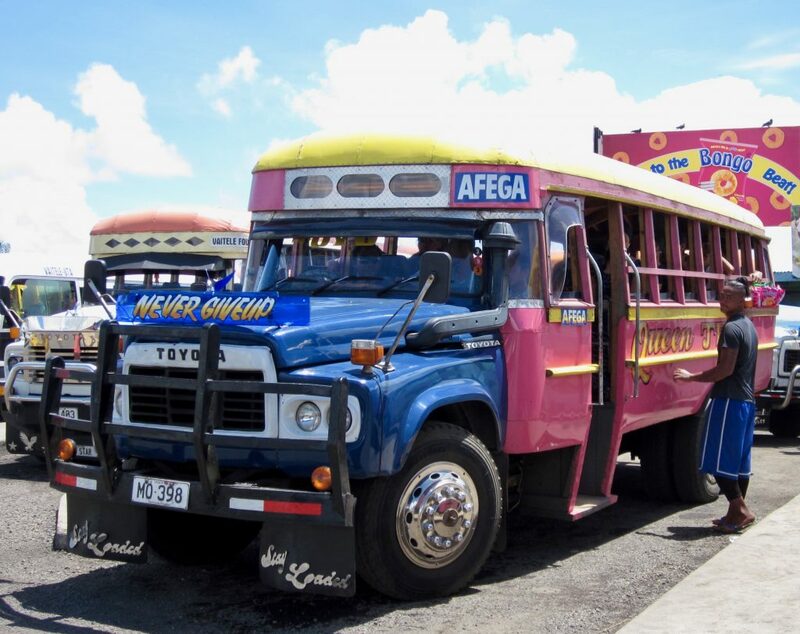 Our plan was to spend the day in Antiqua, a 1.5 hour bus ride, due North. Once again, we booked the transfer through Cunard, not wanting to risk independent transportation, and we are still applauding ourselves for this stellar choice. It is the Wednesday before Easter, all the kids are out of school, and the roadways were packed with holiday makers on the move. Our bus got back well past the “all board” deadline due to snarled traffic, and it was such a relief to see Queen Victoria waiting patiently for us. 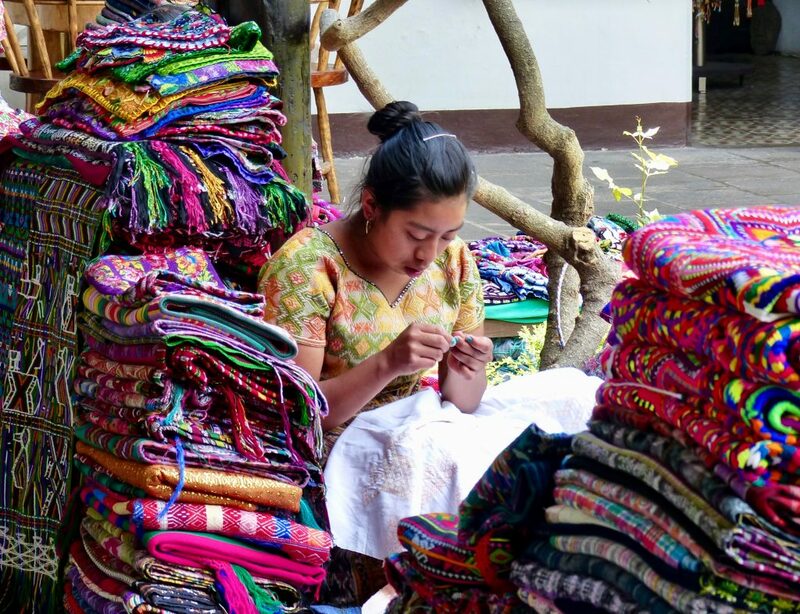 The Mayans have lived in Guatemala continuously for thousands of years. Despite the catastrophe of the Spanish Conquest in 1523, their society, languages, and traditions remain largely intact. And, they continue to form the vast majority here. That is truly remarkable given the odds. Thousands perished under the Spanish sword. But, that was insignificant compared to the murderous waves of smallpox, typhus, plague, and measles that the Spanish were kind enough to bring with them. There are plenty of well preserved ancient archeological sites in this country, but none were close enough for us to visit today. Bummer. 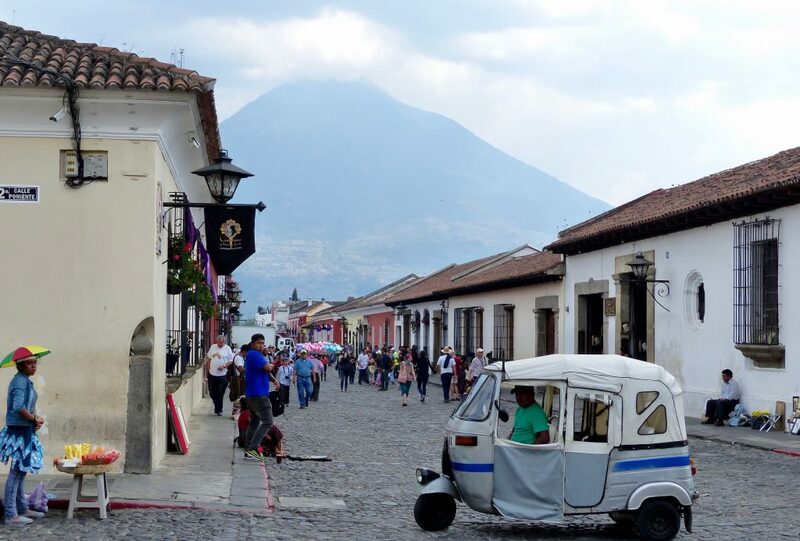 Under Spanish rule, Antigua was the capital of Guatemala from 1543 until a cataclysmic earthquake destroyed the city in 1773. Earthquakes have always been a part of life here, but this one was just too devastating to recover from and the residents were forced to abandon the city. Prior to that, there were numerous churches, a university (built in 1676), a printing press (founded in 1660) and a population of over 50,000. 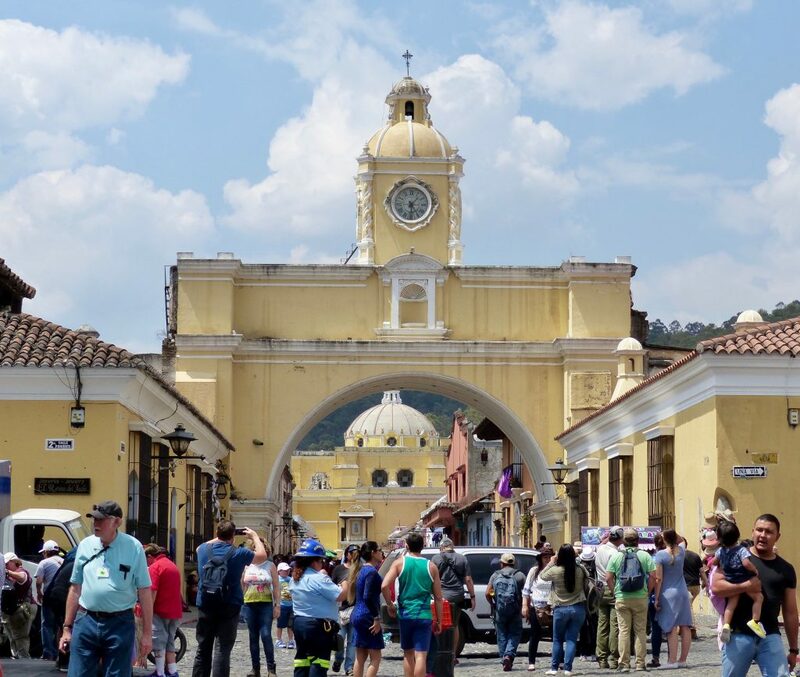 The capital was moved to Guatemala City, 40 miles away. When we arrived in Port Quetzal, it was already a stifling 93 degrees. Most countries we’ve visited have strong populations centered on the coastline. Not here. The highlands are the preferred place to live, because it is much cooler. Antigua has an evaluation of 4,500 feet. It was 80 degrees with low humidity when we arrived. Perfect. We started our exploration at the Jade Museum. Jade was not discovered in modern Guatemala until 1998, when a fierce storm hit Central America and scores of floods and landslides exposed old veins and washed jade into river beds. 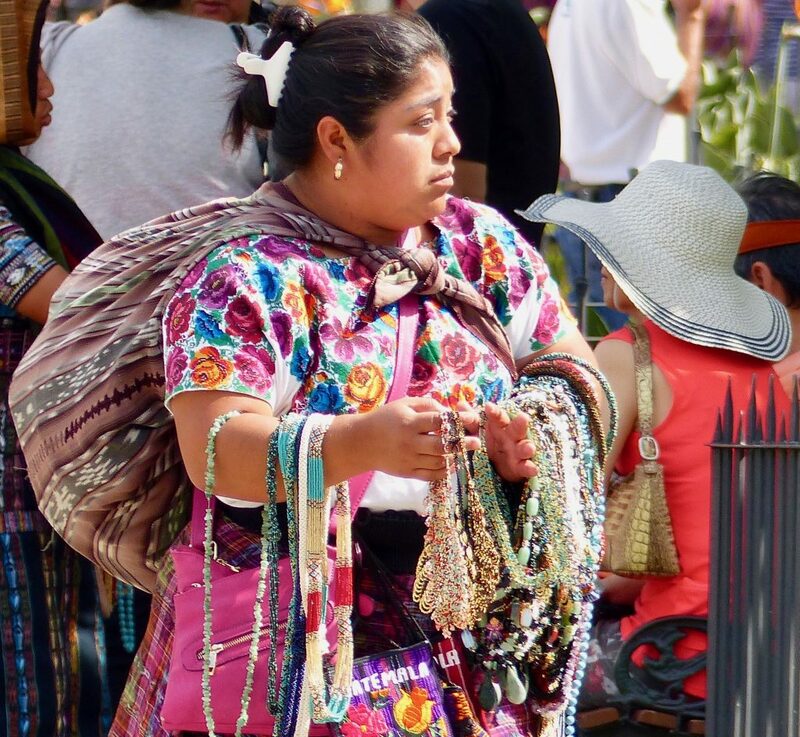 Local prospectors picked up the precious scraps, which found their way into Guatemalan jewelry shops and, eventually, into the hands of flabbergasted geologists. They were shocked by the range of colors, which is addition to the common black and green, came in white, red, blue, and purple. The glassy, hard, often translucent rocks occur at only a few known sites around the world. The ancient Mayans considered jade to be more valuable than gold and silver, and their kings often went to their graves with jade suits, rings, and necklaces. The living had their teeth inlaid with the colored gems. 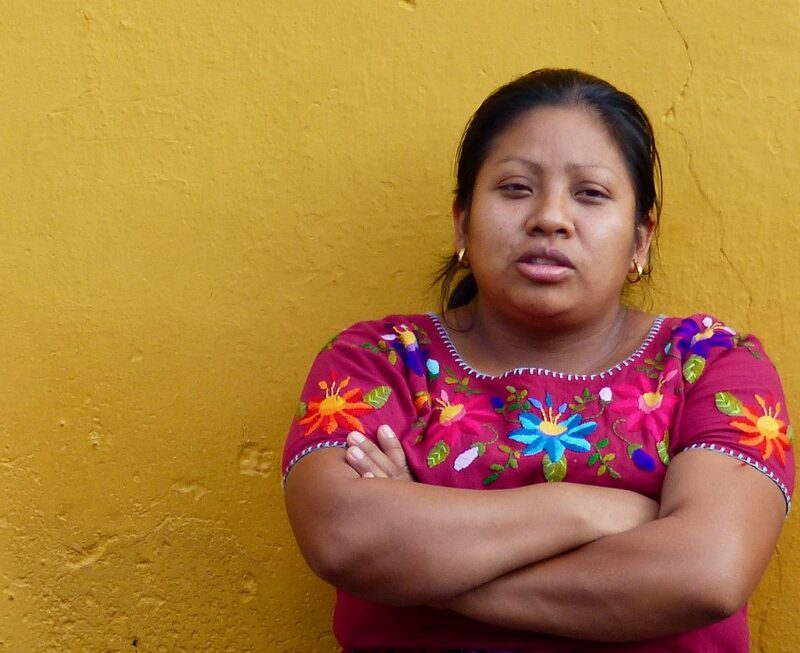 This discovery has given a much needed boost to the Guatemalan economy. I contributed today, twice, within a half hour of getting off the bus. 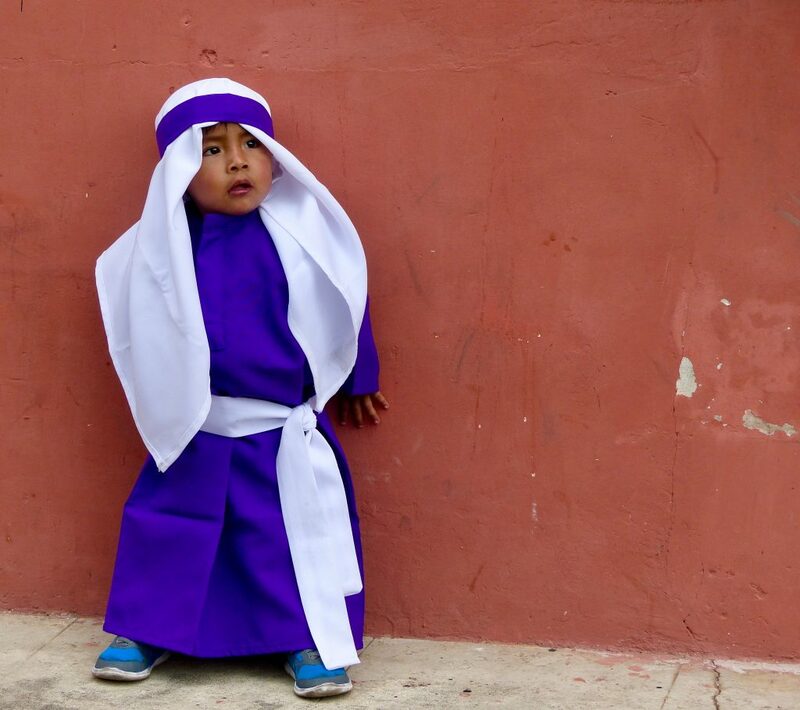 Next, we wandered into the main square where kids of all ages were getting ready for the Easter pageant at La Merced Church. What a wonderful time to be here! The air was sparkly with good cheer. 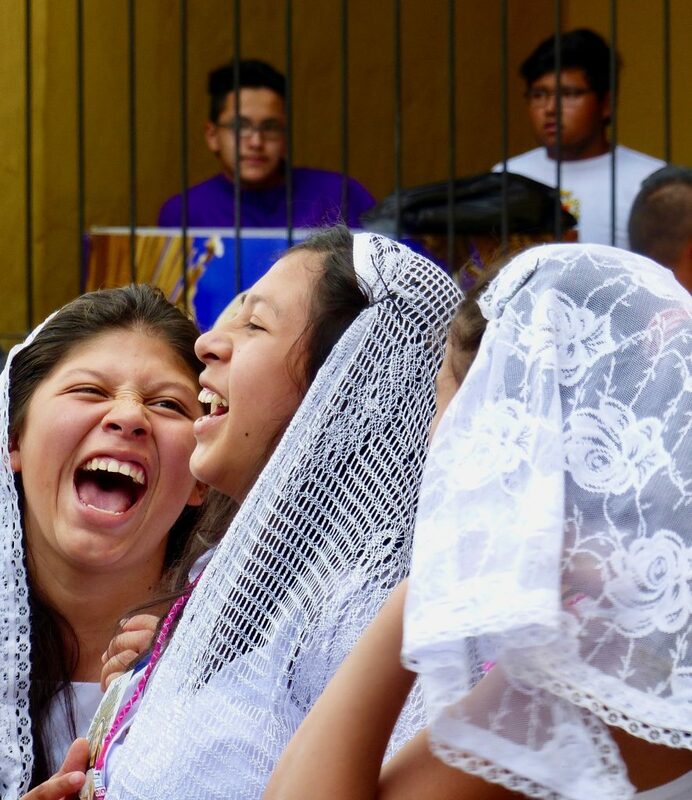 Girls dressed in white to represent Mary where soaking in the adoration of their extended families. Boys had their shoes shined to a glossy sparkle before the big event, and one precious little boy, cocooned in deep purple stole the show. How Adorable is this Kid? We were completely absorbed in the festive atmosphere while picking our way cautiously over the potholed cobblestone streets. 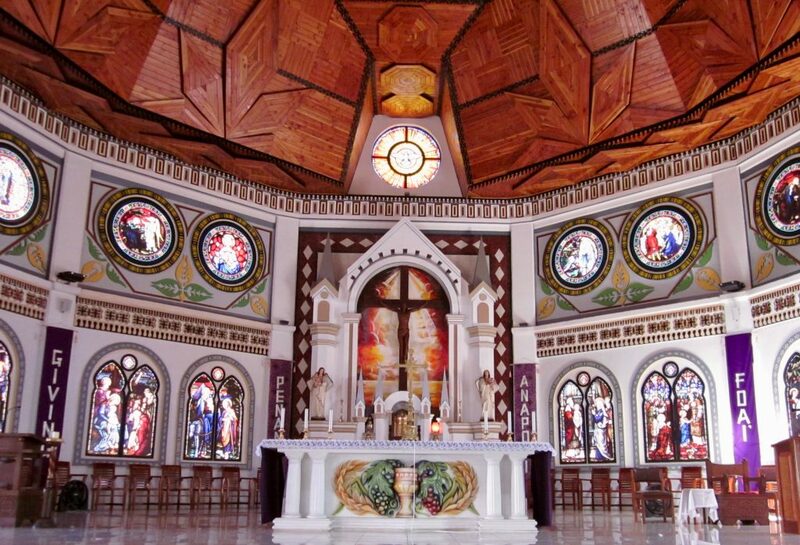 The mixed bag of restored and crumbling Spanish structures was a feast for the eyes. 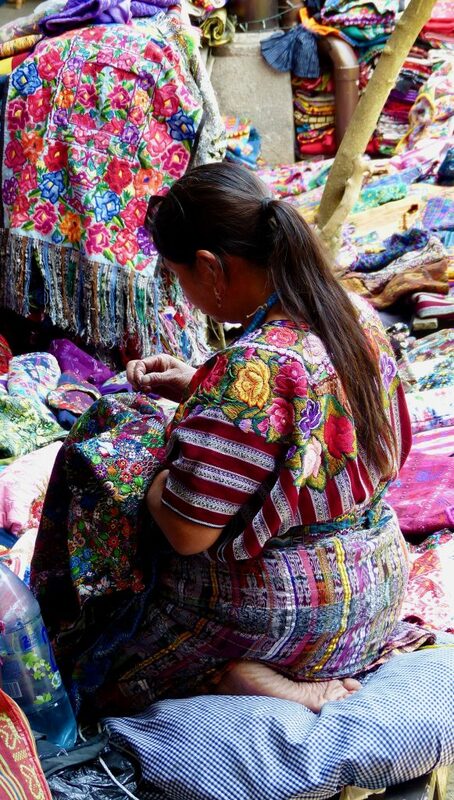 But, as gorgeous as the architecture was, it could not compare to the hundreds of vividly dressed Mayan women laden with handicrafts as they drifted through the streets or sat in the plazas. The ones on foot, methodically zeroed in on every sightseer with brazen determination. They were respectful, soft spoken, and relentless in their pursuit of a sale. I really admire their staying power, but after being intercepted and pursued by 22 different sellers in 15 minutes, politeness became a challenge. Look at all that Vibrant Color! Awesome! The police presence was ubiquitous. The “tourist police” looked like regular cops with hand guns, spoke english fluently and interacted proactively with visitors. 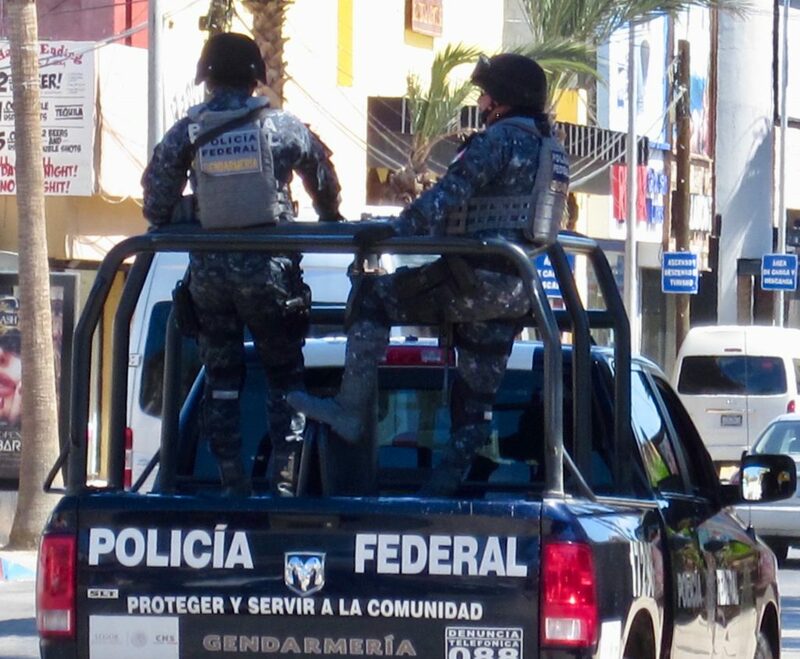 The “military police” did not engage, were dressed to intimate in camouflage, and carried machine guns. I asked permission before snapping a photo. 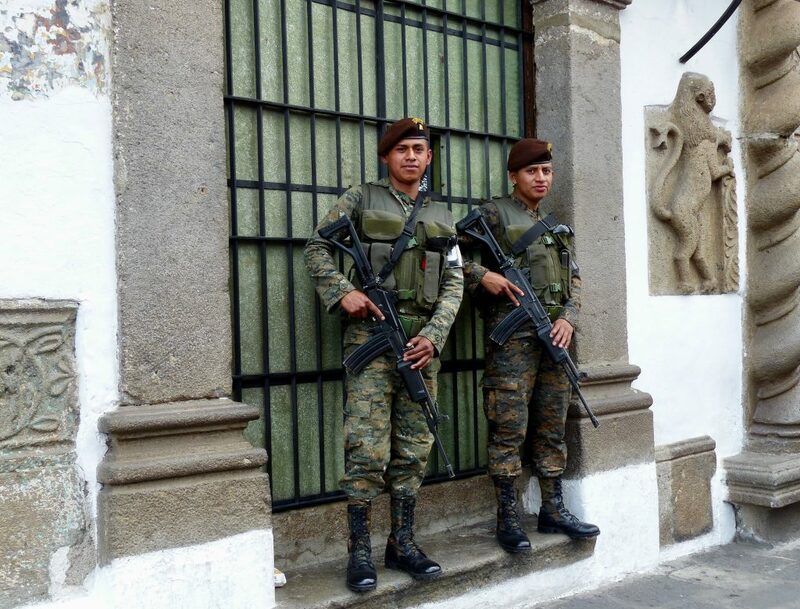 Apparently, gang violence in Guatemala City is widespread and the government wants to make sure it doesn’t fan out to Antigua. Their presence helps keep the muggings in check too. The all-mighty tourist dollar is paramount here and the city is a gem. I’m glad they are being proactive in keeping it that way. 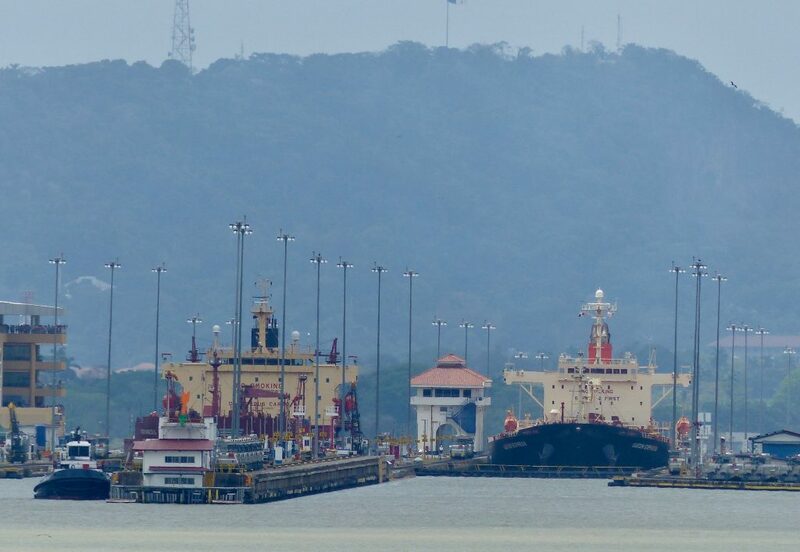 Next Event, Transiting the Panama Canal! After leaving Los Angeles, we continued south, crossed into Mexico, and landed in the desert environment of Cabo San Lucas at the tip of the Baja Peninsula. 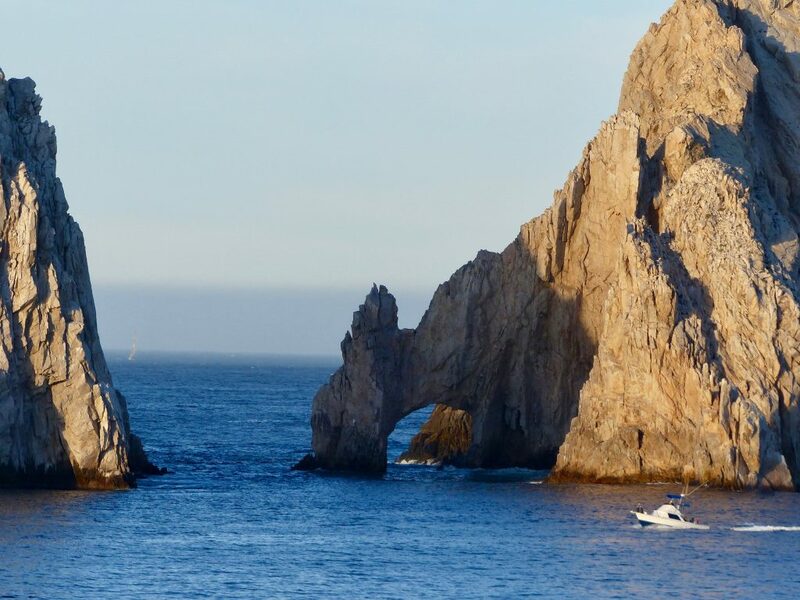 Known simply as Cabo, it has become one of Mexico’s top tourist destination in recent years and has a population of 68,000. 25 years ago, we came here on a small expedition ship, as part of a wildlife voyage. I remembered the interesting geological features, awesome snorkeling, abundant sea life, and small village. Deep sea fishing was big back then. Drugs labeled as “controlled substances” in most countries are sold freely through pharmacies on every street corner. Each one featured a blinking neon sign advertising an extensive list of available medications. Daytime muggings have become commonplace due to the sharp increase in tourism. Police wrapped in bullet proof vests had a strong presence. Until recently, this unique and fragile environment was largely unprotected by law, and was cannibalized by reckless developers interested in capitalizing on the low-end tourist bonanza. Thankfully, there is a growing collection of activists and attorneys who are challenging the rampant destruction of wetlands, coastline, and other fragile ecosystems. 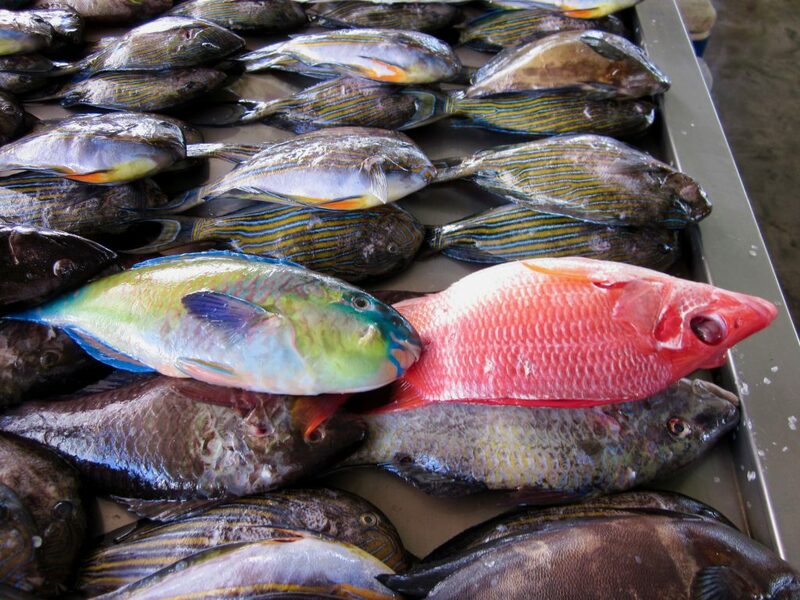 We strolled around town for a few hours, before the intense heat (dry but scorching), constant assaults by “fishing charter” hawkers, and general disillusionment sent us back to the ship by lunch time. 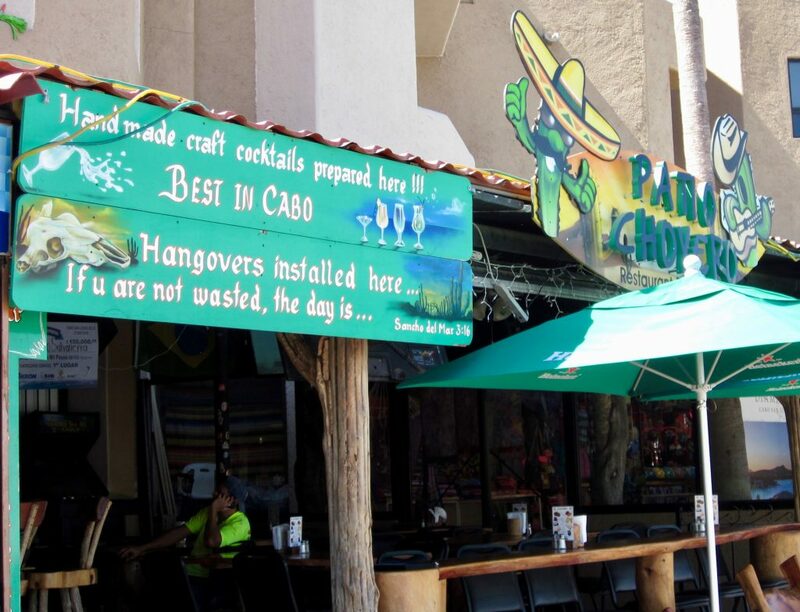 We miss the “old” Cabo. Just before climbing aboard, we enjoyed our highlight. 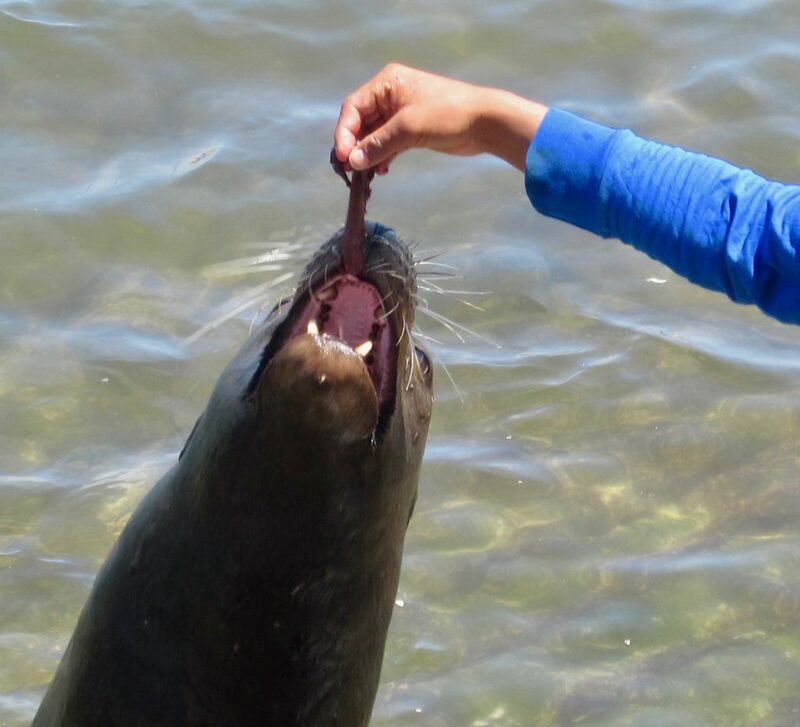 A young fisherman was feeding scraps to the local sea lions in hope of getting tips. 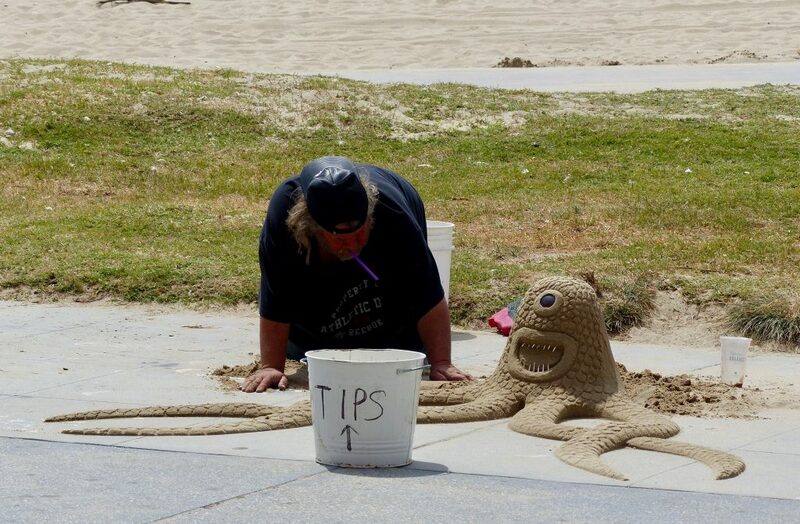 His tomfoolery earned him 5 bucks from us. I’m surprised he still has his lips. After leaving San Francisco, we continued down the coast of California, and docked at the Port of Los Angeles. A gargantuan complex that occupies 7,500 acres of land and 43 miles of waterfront. 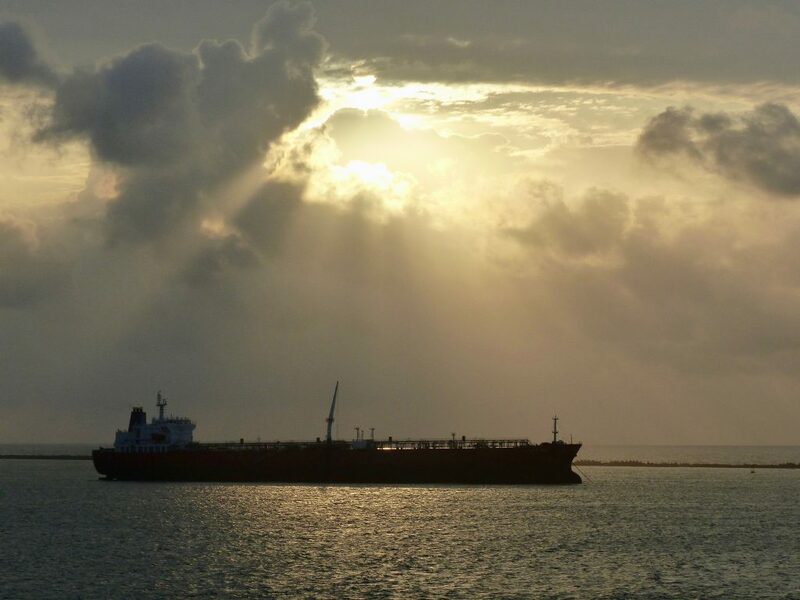 Queen Victoria was wedged between an oafish container ship and an crude oil tanker. I think she was insulted. You were not permitted to get off the ship to stretch your legs due to the industrial location, and all the attractions were at least an hour away. 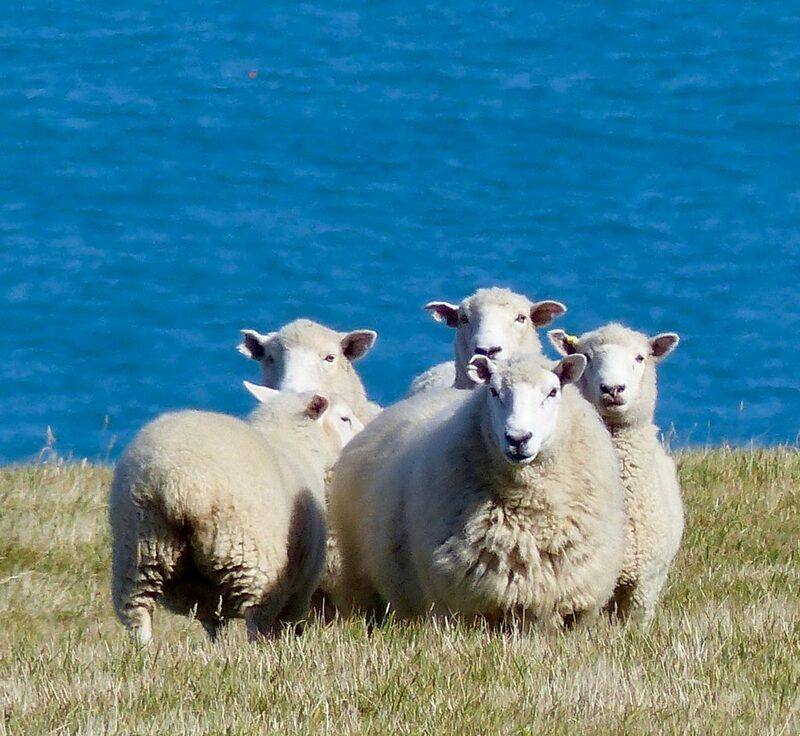 It must have been a record sales day for the Cunard shore excursions team with a captive audience. Los Angeles is comprised of 80 separate districts and neighborhoods; a sprawling metropolis that covers 469 square miles. There are over 18 million people living here, making it one of the most densely populated regions in the world. It is also one of the most polluted. The city is home to people from 140 countries and 224 different languages are spoken. We decided to hop on a bus going to Venice Beach for the day. We booked transportation through the ship and swallowed the inflated price without complaint. Why? The traffic here is an abomination, all day, every day. When traveling on a sanctioned shore excursion, the ship will not sail until all the buses are back. Passengers on their own who don’t show up by the “all board time” are left behind. Period. 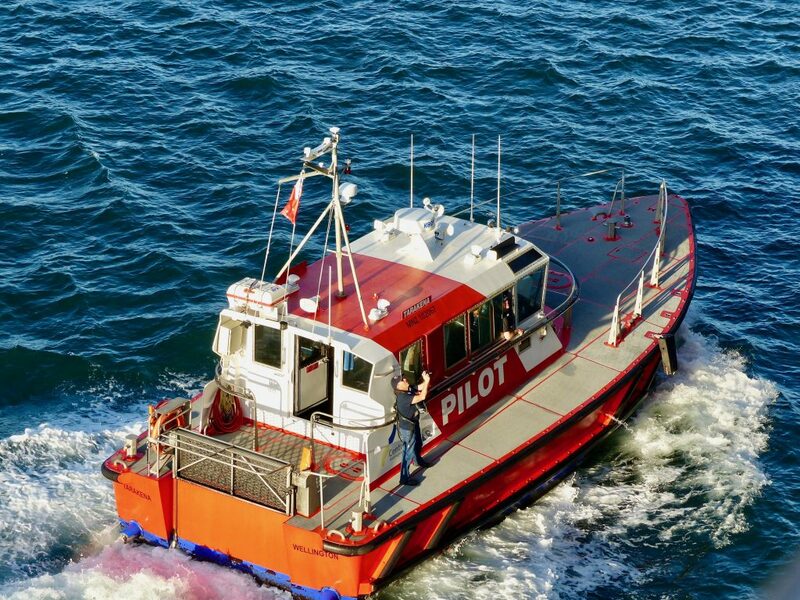 The captain will not turn around, even if he sees you frantically waving from the pier. You are left to admire The Queen’s shapely derrière as she disappears from view. Then, you have to figure out how to get to the next port when your passport, wads of cash, and credit cards are safely tucked away in your stateroom safe. Traffic was thick, but moving, so it took us about an hour to travel 23 miles north of the port. We were dropped near the beach. 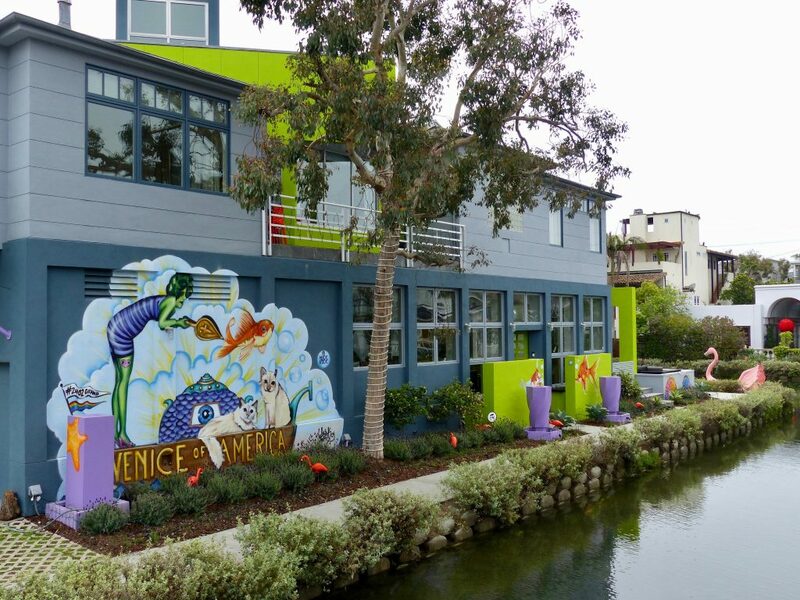 Venice was laid out in marshland by tobacco millionaire, Abbott Kinney in 1905 as a beach resort town. He loved the city by the same name in Italy, and wanted to create a fantasy replica here. Kinney dug several miles of canals to drain the marshes for his residential area. Amusement piers were built that had carnival rides, a dance hall, auditorium, and restaurants. The commercial buildings were designed in a Venetian architectural style. Tourists arrived on the Pacific Electric Railway from Los Angeles and Santa Monica. The Venice Miniature Railway was used to tour the town. The major attraction was Venice’s one mile long sloping beach. Cottages and housekeeping tents were available for rent and the town drew up to 150,000 visitors on the weekends by 1910. Kinney ruled the town with an iron first until he died in 1920. After that, the infrastructure deteriorated quickly. Building the canals, which were not properly engineered, ended up being a really bad idea. With so many people using the toilet, raw sewage regularly filled up and overflowed from these manmade waterways, especially at high tide. I wonder how that impacted real estate values? Yuck. By 1925, Venice was a disaster, and annexation to Los Angeles (LA) was proposed and approved by the local board of trustees. LA immediately forged ahead to remake Venice in it’s own image. It was felt that the town needed more solid streets. After a three year court battle led and lost by canal residents, most of the waterways were paved over in 1929. LA wanted to immediately close Venice’s three amusement piers but had to wait until the first of the leases expired in 1946. LA had neglected Venice for so long that by the 1950’s it had become known as the Slum by the Sea. A new police and fire station were built in 1930, but beyond that, no improvements were made. The main street (Pacific Avenue) was not paved until 1954. 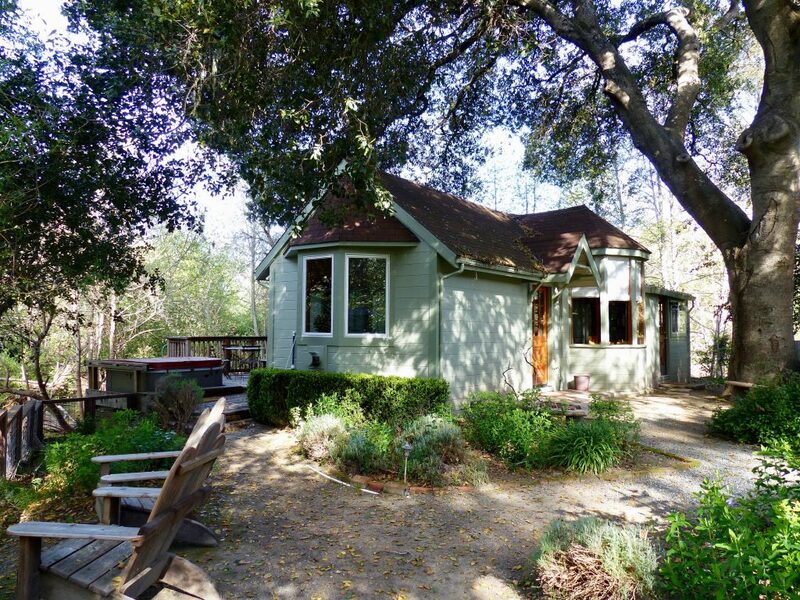 Low rents for derelict bungalows attracted European immigrants, along with young counterculture artists, poets, and writers (known as the Beatnik Generation). Gangs moved in, and violence escalated dramatically. Police raids were a daily occurrence. By the year 2000, gang members in Venice was reduced due to gentrification and a hugely increased police presence. 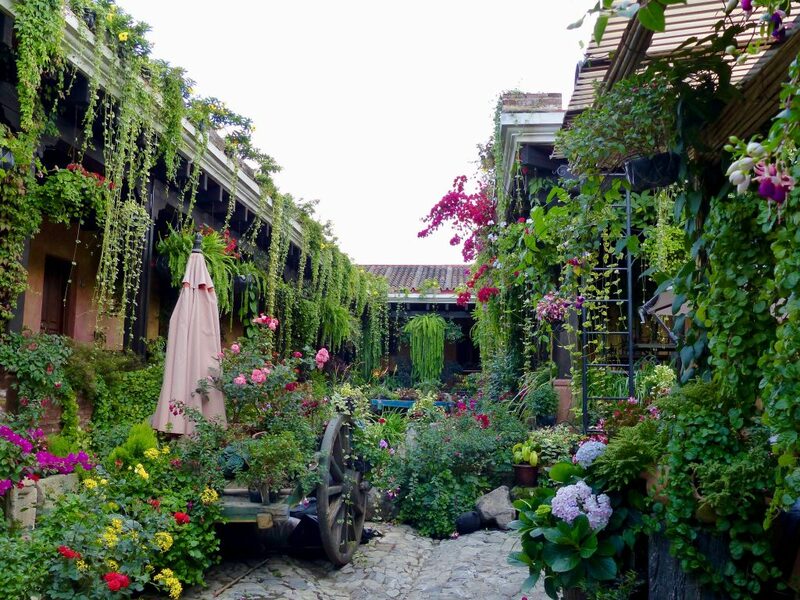 The grubby bohemian charm is still quite prevalent, which is why we wanted to come and check it out. 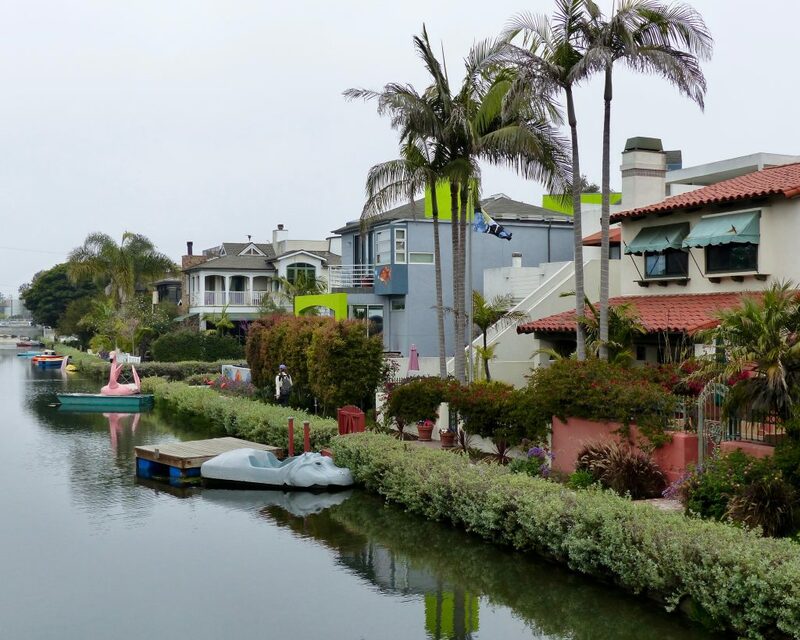 It’s a strange mix of insanely high prices homes on the ocean and canals, with scary ghettos a few block away. You do not want to wander off the main drag at night. Even during the day, some of the side streets had bad mojo. We had 3 hours of free time here, and two areas we planned to explore. First, we meandered along the handful of remaining canals, and yes, the sewage problem has been fixed by modern engineering. Although, I would not suggest taking a swig of the stagnant, murky water. Most of the homes were contemporary, some had splendid gardens and all were meticulously maintained. There was one tiny lot earmarked for “duck use” only. It was full of feathered inhabitants chilling out in their own private oasis. I loved that. 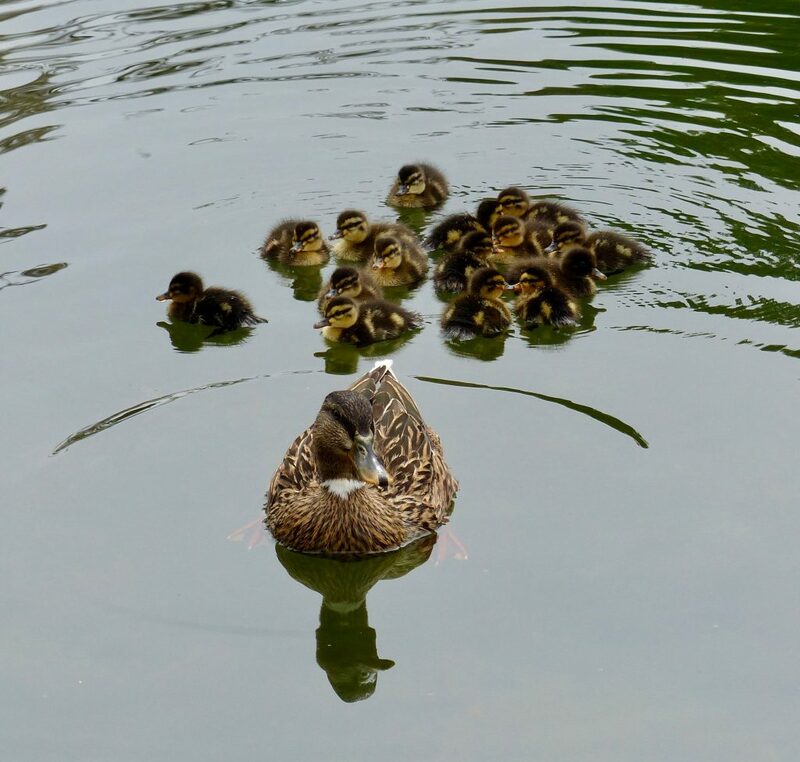 Mama Duck and Chicks on a Venice Canal – Check Out Her Reflection! 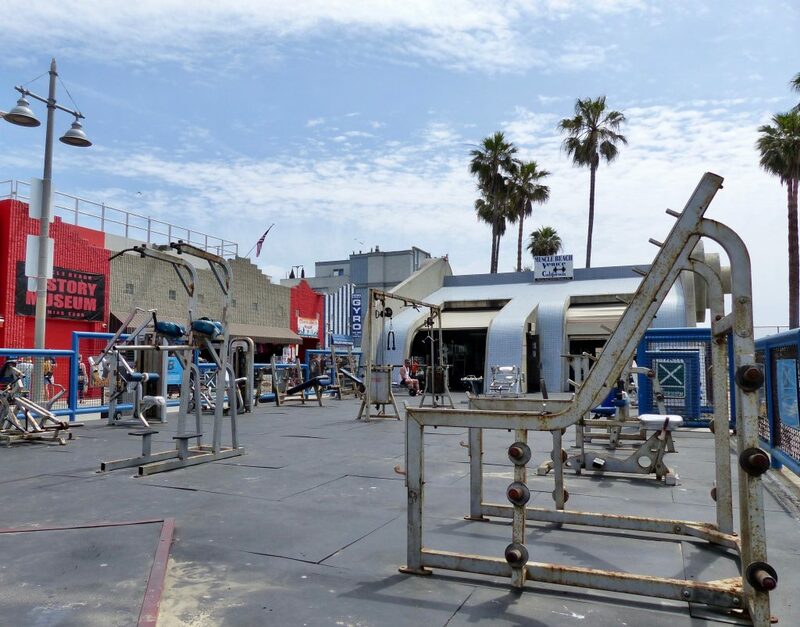 The outdoor recreation area spread along the beach for several blocks and was packed with basketball courts, playgrounds, gymnastics apparatus, handball courts, paddle tennis courts, volleyball courts, and a sophisticated skate park, loaded with dreamy future olympians. It was all quite impressive, and well used. 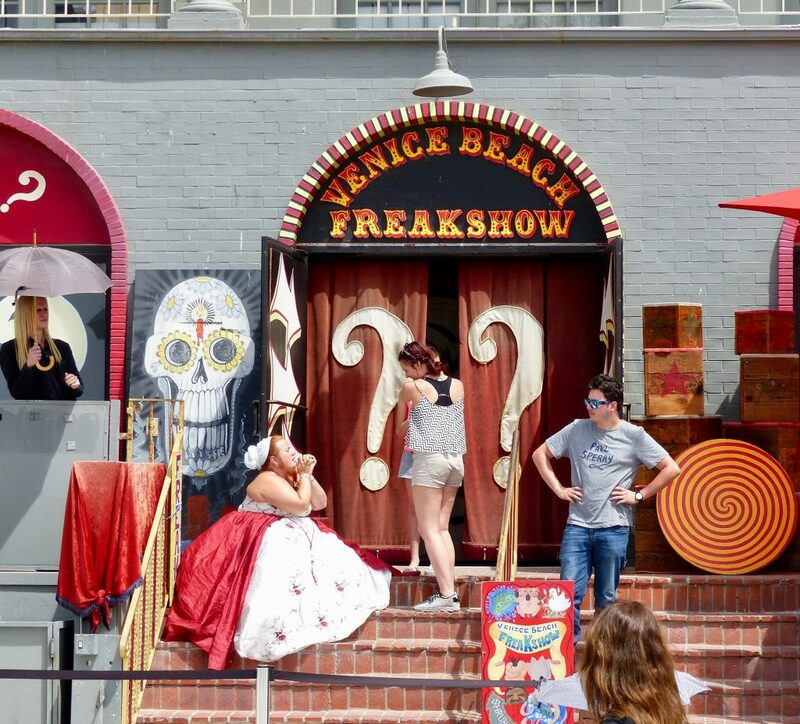 A highlight was sitting on a bench across from the Venice Beach Freak Show and listening to the barker’s attempts at soliciting customers. It was an awesome throw back in time. He guaranteed (or your money back) that there was a two headed LIVE pig inside, the smallest man in the world, a man with a forked tongue, a woman with 3 eyes, a two headed turtle, a half dog/half deer combo, and, this is really pushing it… the oldest, senior citizen in the WORLD with head to toe tattoos. I really don’t need to see that. 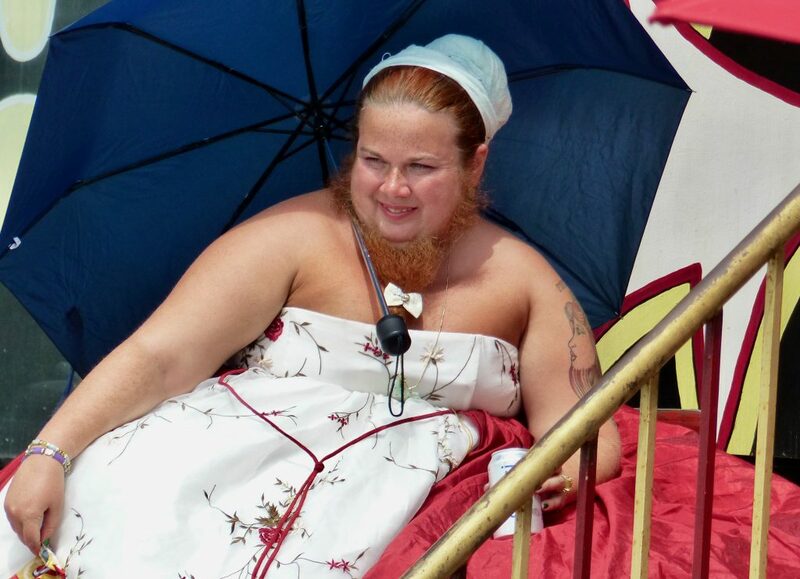 Oh, and the Bearded Lady, who was sitting outside, looked suspiciously male, even though the dress was very flattering. It was a quick visit, but we got a really good taste of Venice. I still like the “original” in Italy better. Mother Nature kicked up her heels, big time. Yee Haa! 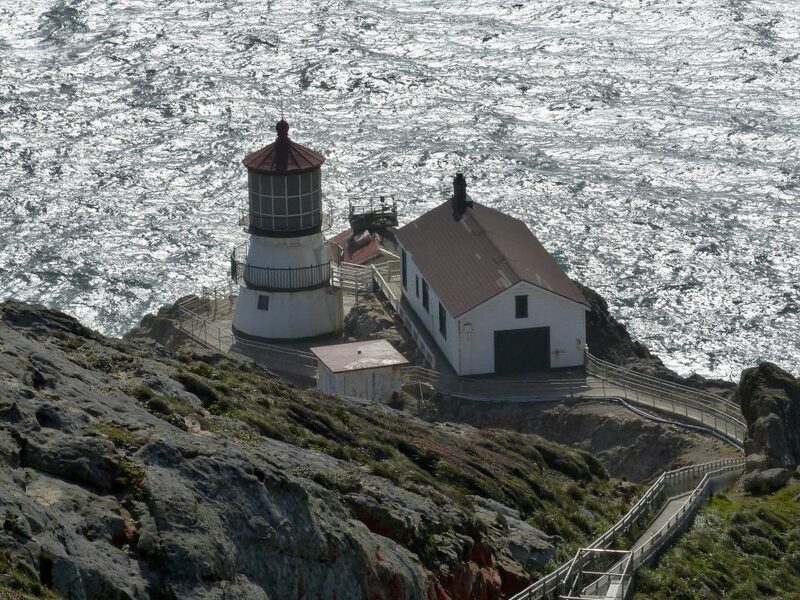 We had mountainous seas and gale force winds the night before arriving in San Francisco. I really think the “Pacific” needs a name change after this last episode. The ocean must still be miffed that Ferdinand Magellan gave it such a sissy name back in 1520. It’s fitful temper tantrums are clearly in protest! After an interminable 12 hours, we were thrilled to get off the ship for our second “overnight” opportunity during this voyage. We have both been to San Francisco many times and have experienced most of the major sites. This time, we decided to rent a car, and head North. 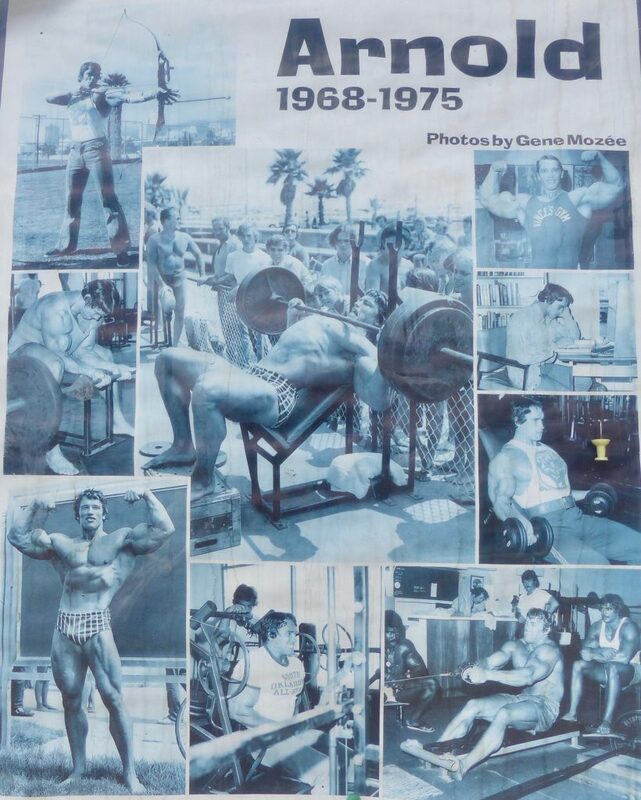 But, before I launch into our adventure, here’s a bit of history…. It’s mind boggling to think about how young California is, compared to the East Coast of the US. It was not settled by Spanish missionaries until June 29, 1776… 5 days before the American Revolution ended and independence from England was declared on the other side of the continent. 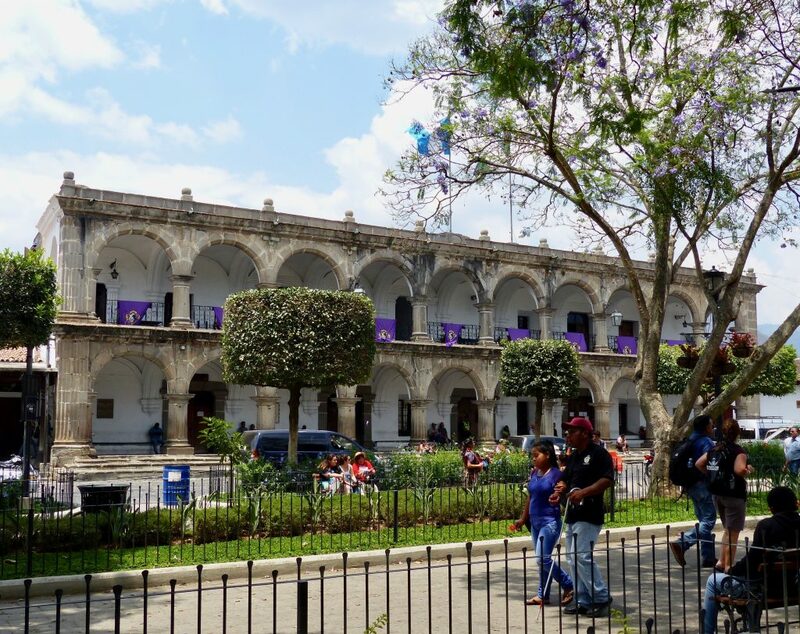 In 1821, this region was granted independence from Spain, and then became part of Mexico. Under Mexican rule, the “mission system” gradually ended. The first private homestead was not established until 1835. California was then claimed by the United States in 1847, at the end of the Mexican-American War. Gold was discovered in 1848, less then one year after Mexico relinquished this region. Ouch. I’m sure they still haven’t gotten over it. A flood of treasure hunters, known as the 49’ers (as in 1849) arrived and the population grew from 1,000 to 25,000 in one year. The lure of unthinkable riches was so compelling that crews on arriving vessels went awol and rushed off to the gold fields; leaving behind a forest of over 500 abandoned ships. Some were used as storehouses, saloons, whorehouses, and hotels. Most were left to rot or were sunken. By 1851, wharves were built to extend the harbor and buildings were erected on pilings among the ships. Buried ships are still occasionally exposed when foundations are dug for new buildings. 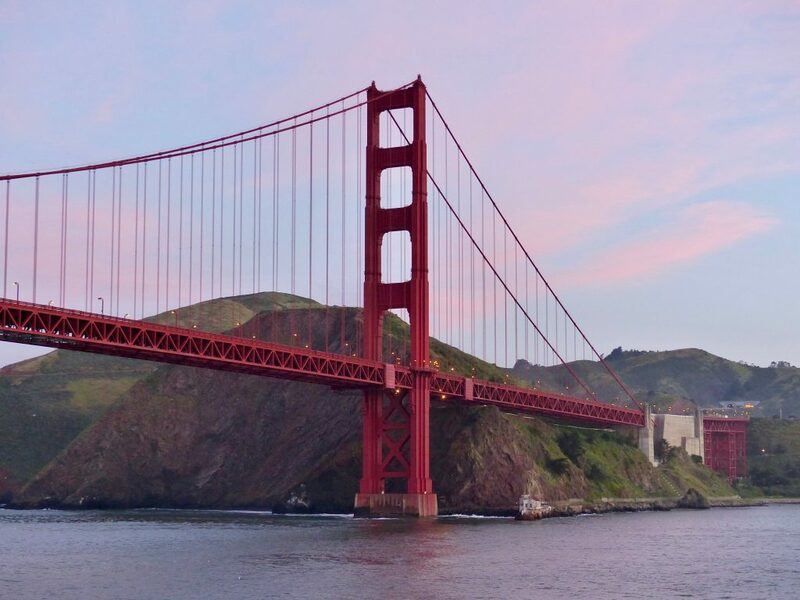 California was quickly granted statehood in 1850 and military forts near the future site of the Golden Gate Bridge and on Alcatraz Island were built to secure the bay. In 1859, silver was discovered in nearby Nevada, and the population exploded again. With the swarm of fortune seekers streaming through the city, lawlessness was rampant, and the city gained notoriety as a haven for criminals, prostitution, and gambling. The epitome of the “wild west”. Entrepreneurs sought to capitalize on the wealth generated by the Gold Rush. Levi Strauss opened a dry goods business, that is now a worldwide enterprise and still going strong. How many pairs of Levi jeans do you own? Domingo Ghirardelli began making very expensive artisan chocolates, and the company is still based here. Wells Fargo bank was born. By 1869, the Pacific Railroad linked with the eastern US rail system to make comfortable travel from coast to coast possible. The first North American Plague Epidemic hit here from 1900-1904. In 1906 a massive earthquake and fire destroyed most of the city. Thousands of people were killed, and half of the city’s 400,000 residents were left homeless. In 1937, the Golden Gate Bridge was built. The color, called “International Orange” was chosen because it enhances the bridge’s visibility in the habitual fog. 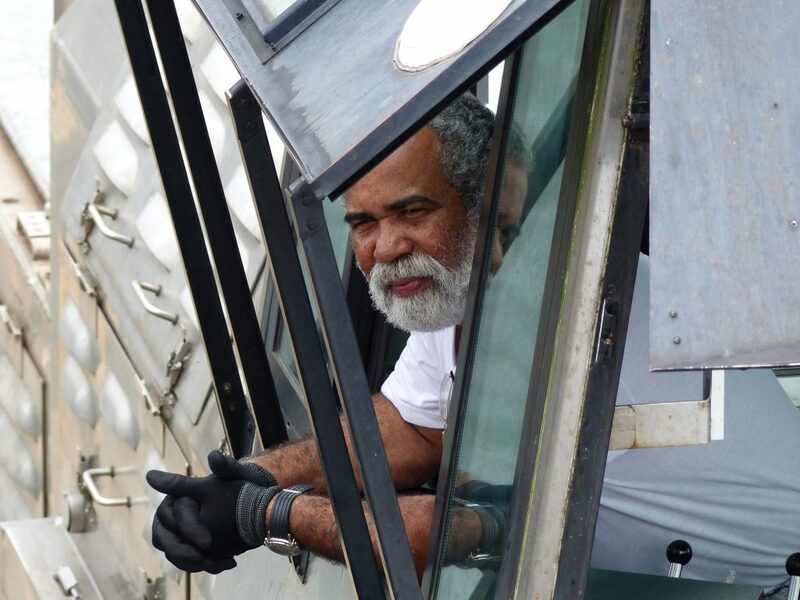 The project cost $35 million, and the bridge is held together with 1.2 million steel rivets. The structure trembled violently during the last moderate earthquake in 1998, and shook off some bolts, which is not a good sign. A $392 million retrofit was recently completed that “should” improve it’s chances of staying in the air. Let’s hope so. Earthquake experts say that the “big one” could hit any day, due to the closeness of the cranky San Andreas Fault. The next one might make California an island. We passed under this majestic icon just before dawn. Alcatraz Island came into view as the sun breached the horizon. After it’s life as a fort, it became a military prison in 1910. In 1934, it was upgraded to a maximum high security federal prison. 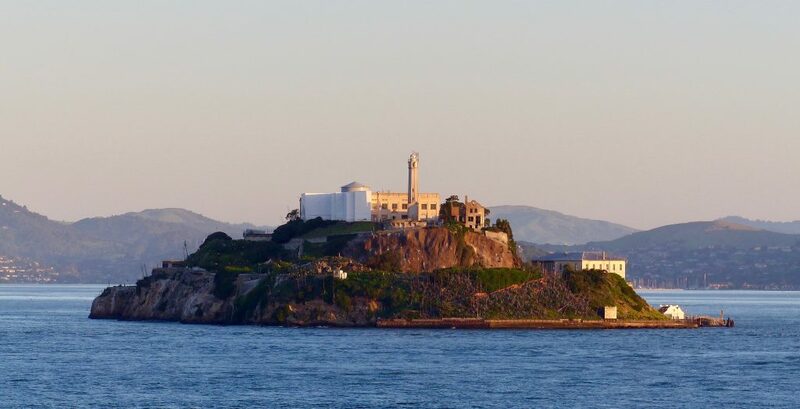 Due to it’s location in the cold waters and strong currents of San Francisco Bay, the prison operators believed Alcatraz to be escape-proof and America’s strongest prison. It was designed to hold prisoners who continuously caused trouble at other federal prisons. Al Capone was one of them. The prison closed in 1963. During its 29 years of operation, the claim is that no inmates successfully escaped. A total of 36 men made 14 escape attempts. Two men tried twice. 23 were caught, six were shot and killed during the escape, two drowned, and five are listed as “missing and presumed drowned”. Or, maybe they are drinking tequila on a Mexican beach. The ship docked at Pier 35, near Fisherman’s Wharf, and the rental car place was a wobbly 15 minute walk. We got some strange looks as we careened across the pavement. Our brains were advising our legs to compensate for phantom movement. I have never appreciated being on a hard, inert surface as much as this morning. We zipped over the Golden Gate Bridge, and marveled at the hundreds of people who were already trekking across the span. The bridge was designed with a pedestrian walkway on both sides. It’s one mile across and the views are captivating in all directions. Our first stop was only a half hour north of the city. The target was Muir Woods National Monument to stroll amongst the ancient redwood trees. This would be the first time for Steve, and one of my all-time favorite nature spots. I was excited to share it with him, but when we got there, the place was jammed. I mean, every single parking lot was bulging with haphazardly ditched cars. More people abandoned their vehicles in gullies on both sides of the road over 3 miles away. The best part about this place is communing with the giant trees in peace, and that would be impossible today. We allotted 5 minutes for sulking before moving on. We learned later that it’s spring break time for local schools. That explains it, although the sheer number of people flocking here was still shocking. We continued further north, winding along the high seaside cliffs, and making periodic stops at picturesque hamlets along the way. Lunch was country store ham and cheese sandwiches on slightly stale bread accompanied by tangy sea-salt and vinegar chips. We will keep this meal a secret from the head waiter back on The Queen. He would shutter at the thought of such an uncouth meal. 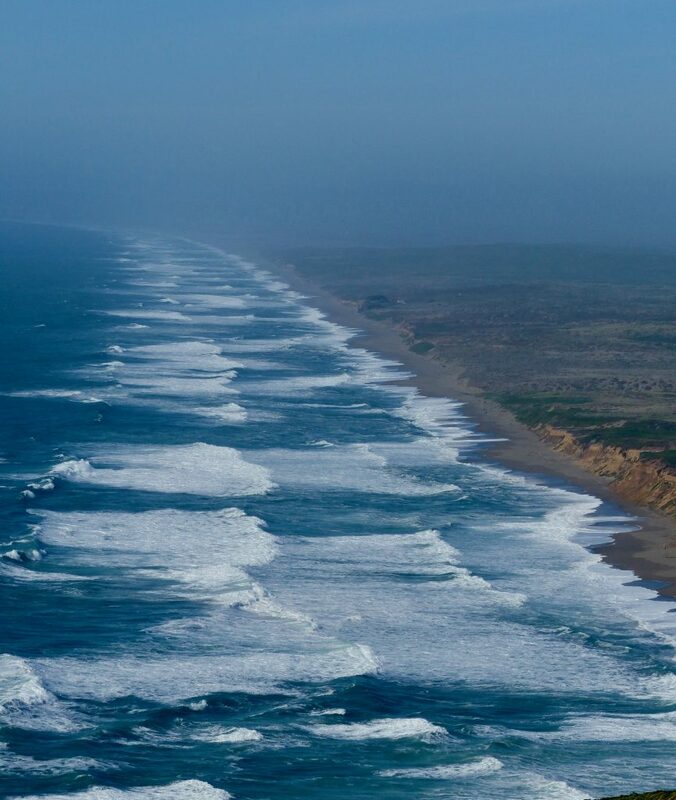 Our next stop was Point Reyes National Seashore. 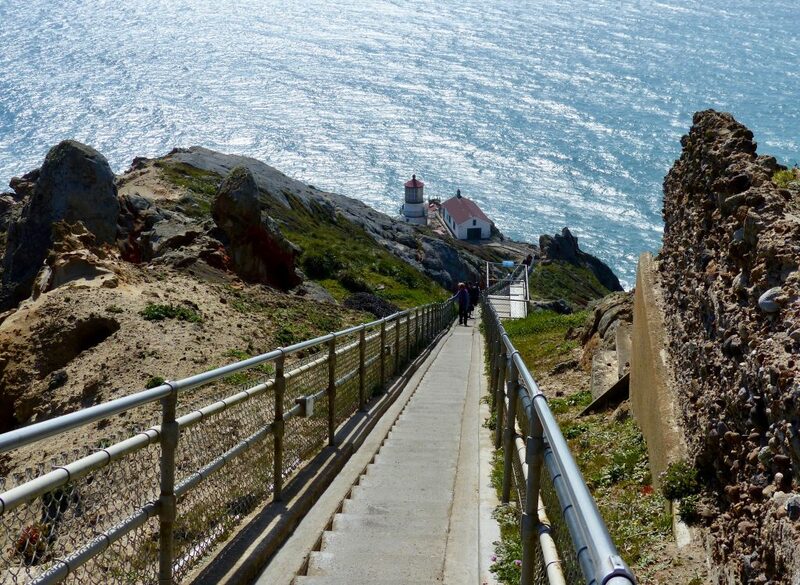 We were here about 20 years ago, and remembered the dramatic Lighthouse built in 1870 and reached by descending 326 steep steps. 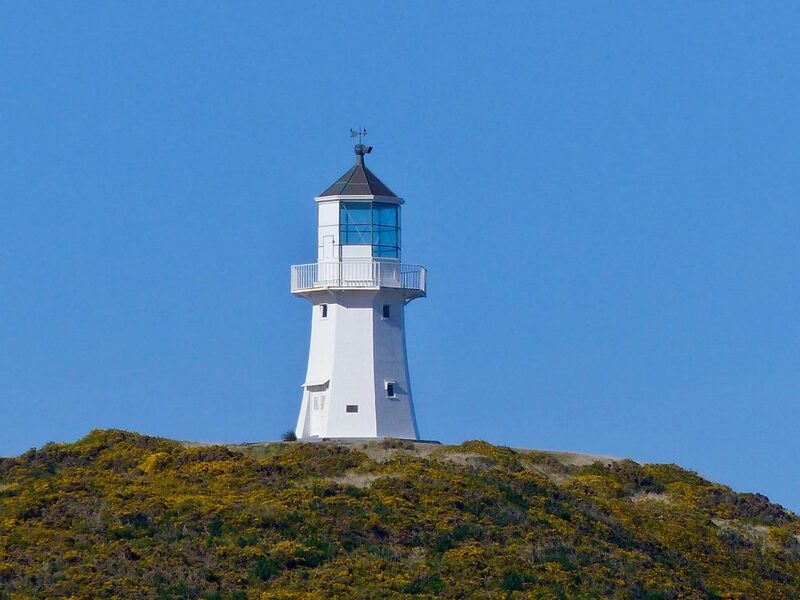 Unlike many lighthouses, that are built high up for maximum visibility, this one was built low, so it could be seen beneath the prevalent fog. On our last visit, visibility was zero. Today, it was crystal clear, but the 50 mph winds made us appreciate the sturdy metal railings that corralled our whiplashing bodies. Not much has changed, although the hike back up from the tower was slower this time, and my middle aged calves were screaming for a few days. We spent the rest of the day hiking in the park. 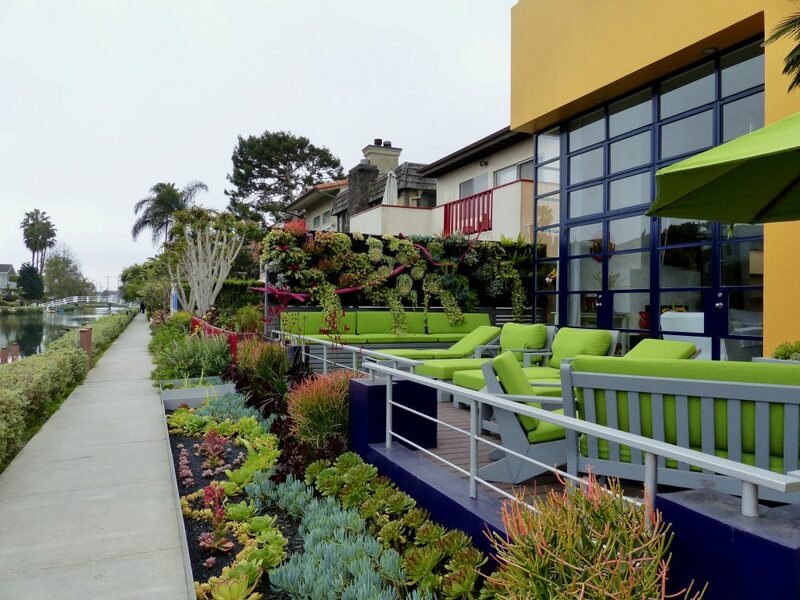 We spent the night at the Lodge at Point Reyes in Olema. We were upgraded to a private cottage on the creek from the basic room I had booked. Why us? The office manager said she picked us, because she assumed we would appreciate the extra space after living on a ship. She was right. It was pure bliss. The best part was the inanimate bed and waking up to a symphony of song birds, instead of the hiss of air-conditioning. 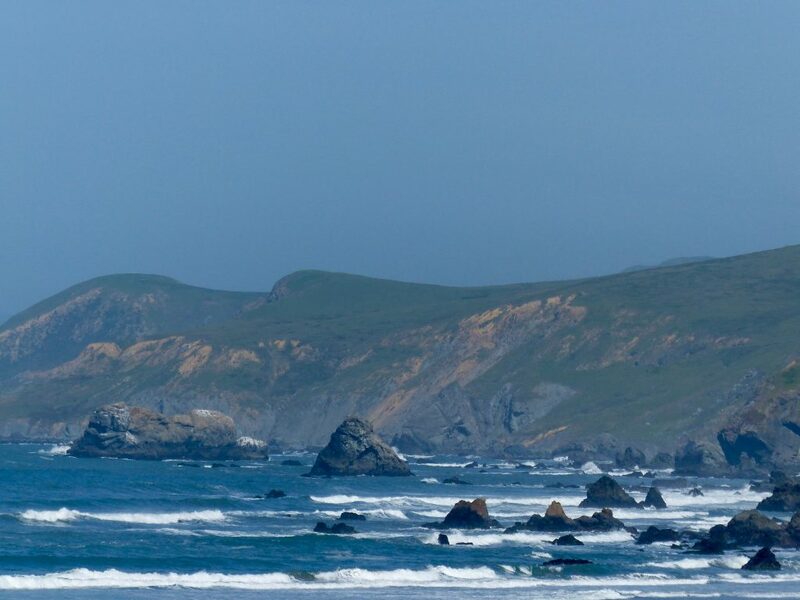 Point Reyes Seashore Lodge – Cottage on the Creek – Awesome! After a quick breakfast we continued north a bit further and made a quick stop in Dillon Beach. 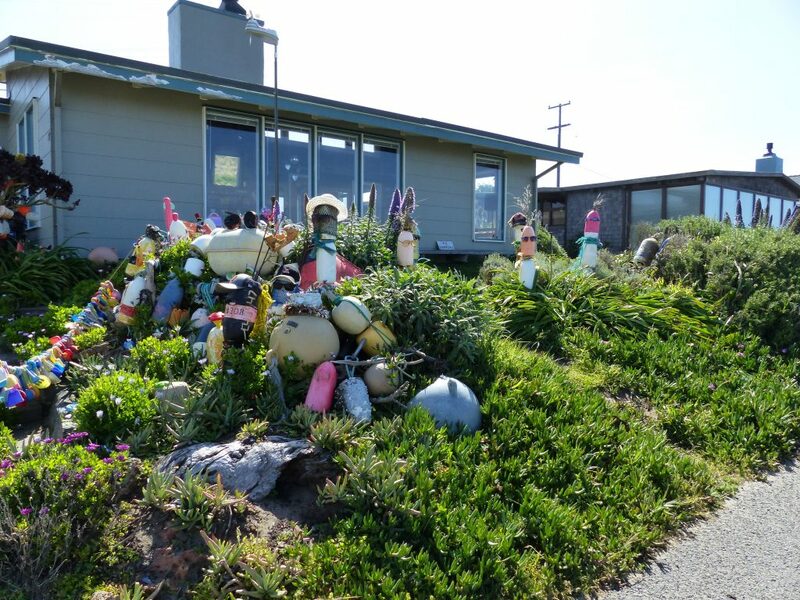 The “yard art” below is thoughtfully composed of found objects on the shoreline. Check out the colorful string of beach shovels. After leaving the coast, we headed east towards the Somona Valley. 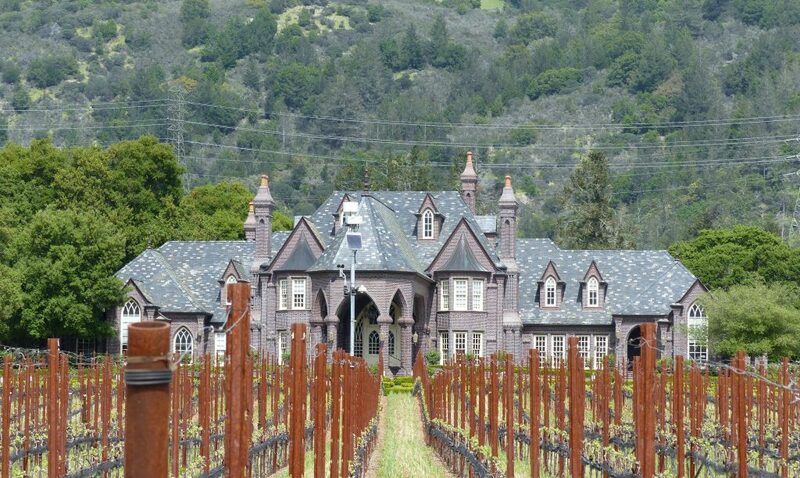 There are over a hundred wineries here, and we made a quick stop at Ledson because it is such a majestic structure. We didn’t hang out long, because we still wanted to enjoy the city a bit before the ship left. After dumping our rental car, we hustled back to the waterfront. My most favorite San Francisco phenomenon was waiting for us. 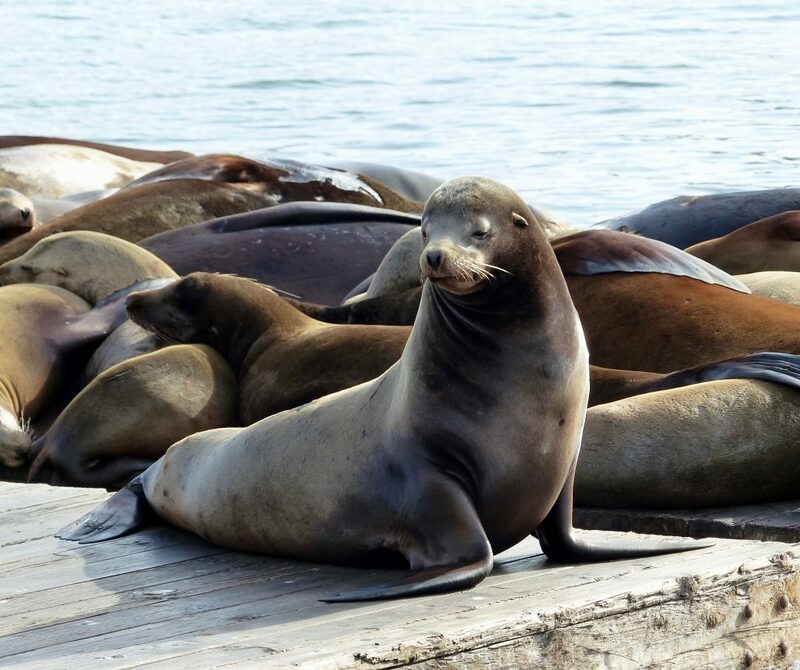 Shortly after the 1989 earthquake, a few California sea lions began “hauling out’ on on Pier 39’s K-Dock. Within 4 months, the boisterous barking gang grew to 300 members and completely took over, totally exasperating the marina tenants. 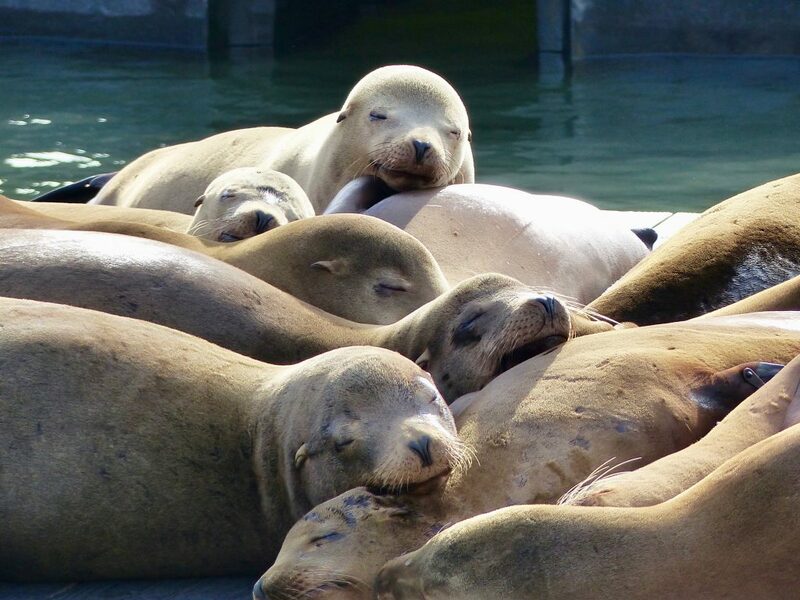 The staff asked the Marine Mammal Center for advice about the freeloading newcomers. 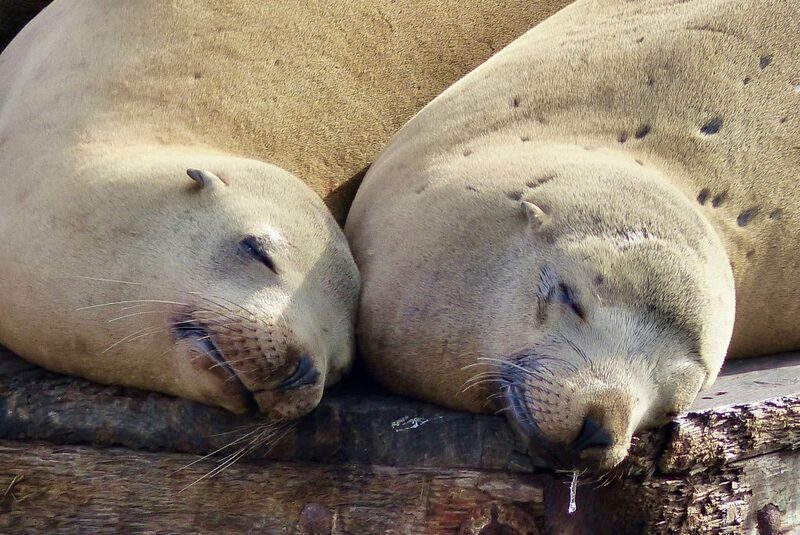 After much debate and research, the experts recommended that the sea lions stay in their newfound home. They have been there ever since. Their life span is the wild is about 25 years. 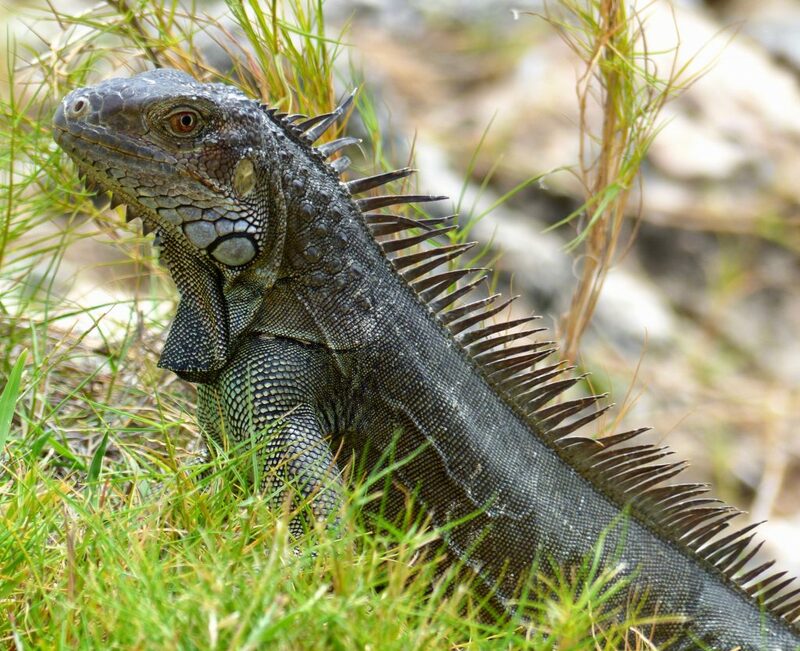 Males can reach 7 feet long and weigh up to 850 pounds. Females, 6 feet long and 220 pounds. There are 20 floating platforms for them to choose from, but they like to pile on top of each other. It was fascinating to watch the jockeying for position. 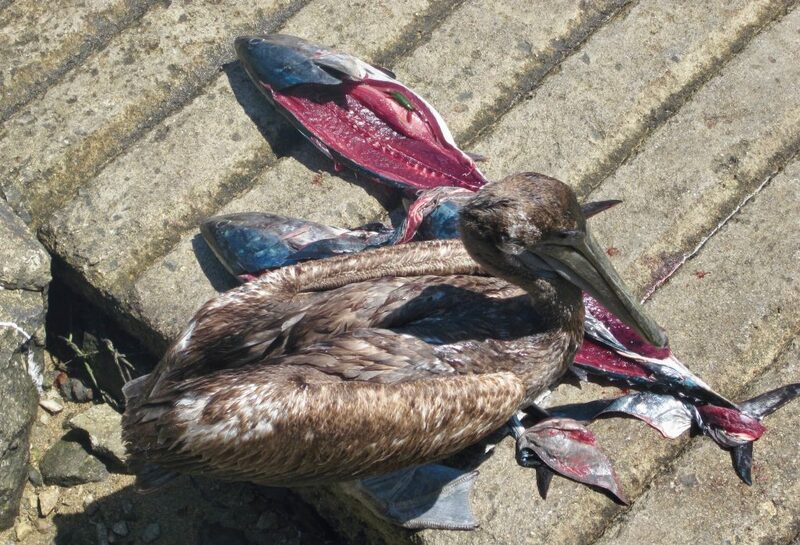 There is a plentiful supply of food in the bay, and complete protection from predators. The living situation is considered ideal, and they bring so much joy to spectators. It’s a win win. We picked the scruffiest eatery we could find for dinner on Fisherman’s Wharf, to counterbalance 75 nights of fine dining. It felt like an outrageous act of rebellion against Queen Victoria. We didn’t even fold our napkins properly, as a further act of defiance. We ate huge Dungeness Crabs (another “must” in this city), that splattered our clothes as we ripped off the claws like medieval barbarians. Coupled with an ice cold microbrew and a local band playing 70’s rock and roll, we were in heaven. Ice cream cones from Ben and Jerry’s topped off the perfect meal. We waddled up the gangway, brushing bits of crab from our tee shirts with 5 minutes to spare before the final “all aboard”. Next stop, Los Angles, CA (aka City of Angels) Angels? Really? The island of Hawaii, also known as “The Big Island”, is the youngest and largest of the island group with a total population of 185,000. We docked in Hilo, the largest town with a population of 43,000. There is no glitz and glamour here, making it very unlike Honolulu, and much better suited to our tastes. The island was formed by five volcanos, two of which are still active. Mauna Loa is the world’s largest volcano at 13,677 feet. 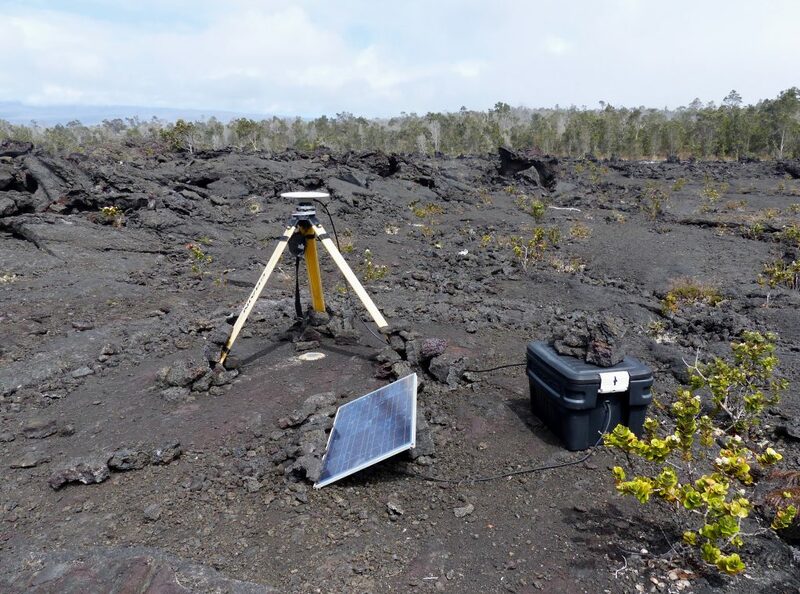 Kilauea is the world’s most active, and it’s lava flows have buried 3 towns and added 543 acres to the island since 1983. The island has also suffered from massive tsunami damage. One in 1946 from an Alaskan earthquake and one in 1960 from a Chilean earthquake. Both sent waves over 60 feet tall barreling towards Hilo. Each time, the town was obliterated, and the waves sweep inland for several miles. More recently, a Japanese earthquake in 2011 sent a smaller tsunami to the island. I don’t think investing in oceanfront property is a wise idea. First up on our itinerary today was a trip to the Hawaii Volcanos National Park, about 45 minutes southeast of Hilo, and home of Kilauea. 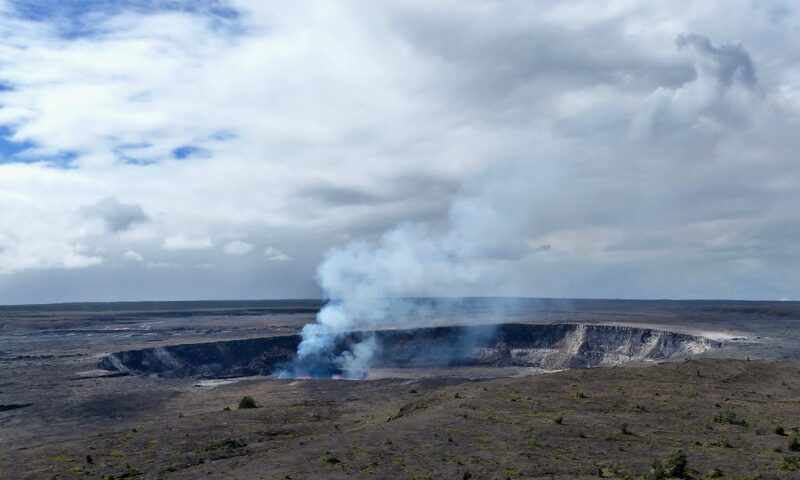 On the way, we learned that in 2008, there was an unpredicted explosion in the main crater (Halemaumau), which led to the first eruption since 1982. The debris covered and permanently closed part of the Crater Rim Drive and severely damaged the overlook and museum. 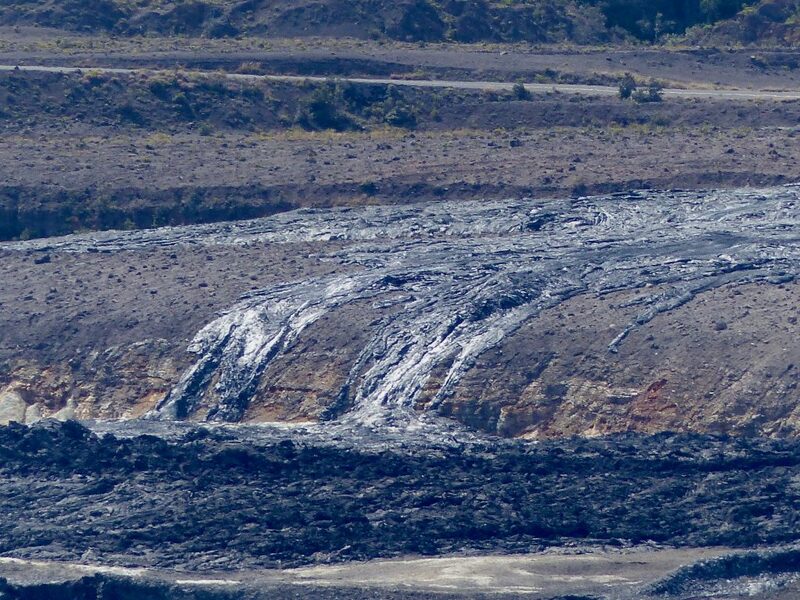 The explosion did not discharge any lava, which suggests it was driven by hydrothermal or gas sources. 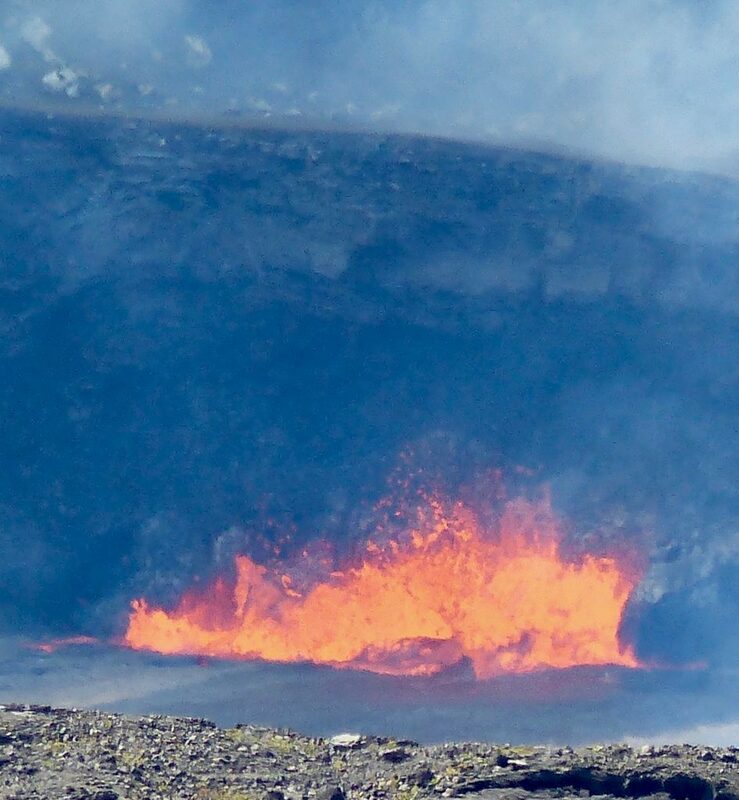 It did open a major sulphur dioxide gas vent, and dangerous fumes are now emitted at the crater. A new overlook was built much further away. You don’t want to breathe the stuff in. High levels can kill you. We also learned that there is a “lava lake” underground that is constantly on the move. It rises and falls by over 1,000 feet depending on the amount of pressure deep inside the earth. Sometimes it reaches the surface which results in a dazzling display of bubbling lava. But, most of the time, this lake is simmering well out of sight. Our guide had not seen lava in weeks, and warned us not to get our hopes up. We were subdued and dispirited for the rest of the ride… until we arrived, hopped out of the van and saw bright orange molten lava! Yippee! This is the first time for us, and it was absolutely thrilling! There were two jagged fissures about 50 feet wide on the surface of the crater. The roiling lava was belched 30 feet in the air, which means that the pressure was really high today. Our guide was shocked. I told him I did my “molten lava dance” in honor of Pele before leaving the ship, and obviously, it worked. He begged me to teach him the routine. We were pretty far away, but had a splendid view through the binoculars. The constant plumes of gas made the entire scene hazy, so photography was a challenge. My best shot is below, although it pales in comparison to seeing the live performance. We met two ladies who had been coming here every day for the past two weeks, waiting to see this spectacle. They were in tears. I was totally mesmerized and could have stayed all day. Steve had to drag me away. Thank you Pele! You rock! We briefly explored the Chain of Craters Road to gawk at the older lava flows that had devoured everything in their path. It takes a very long time for “life” to grab hold again after a flow blankets an area, but it does. The rest of the day was interesting, but anticlimactic, as you can imagine. 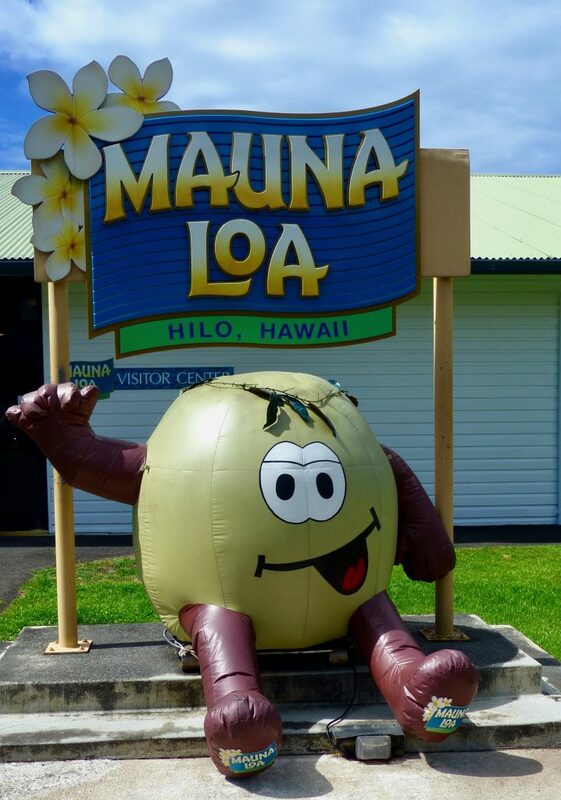 We stopped at the Mauna Loa Macadamia Nut Factory and sampled 18 different flavors. The tour was interesting, and the processes are only partially automated, which means that many happy humans had jobs here The nut prices were no better then at home, so it was easy to resist the urge to load up. The Salted Caramel Macadamia Nut Ice Cream made on site was the creamiest concoction imaginable. No guilt either, since it doubled as lunch. 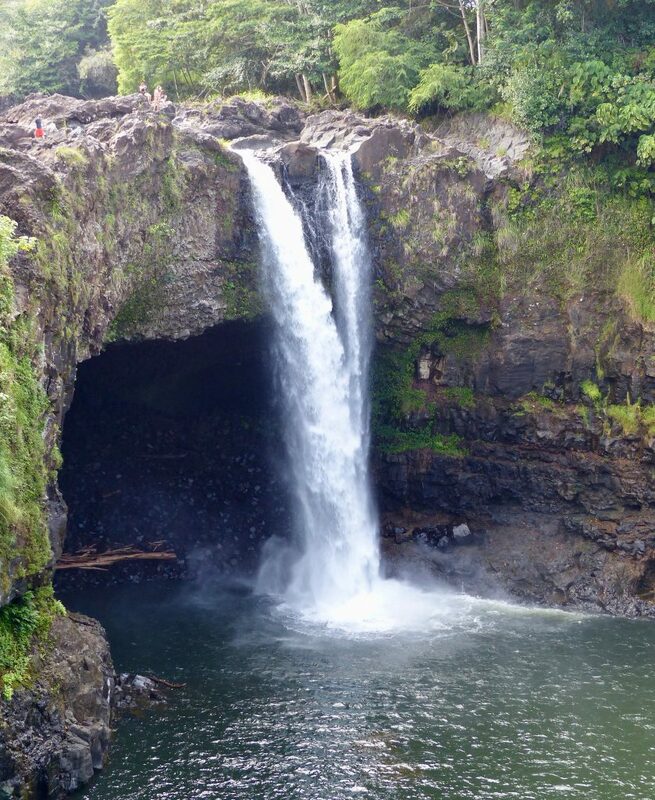 Our last stop was Rainbow Falls. 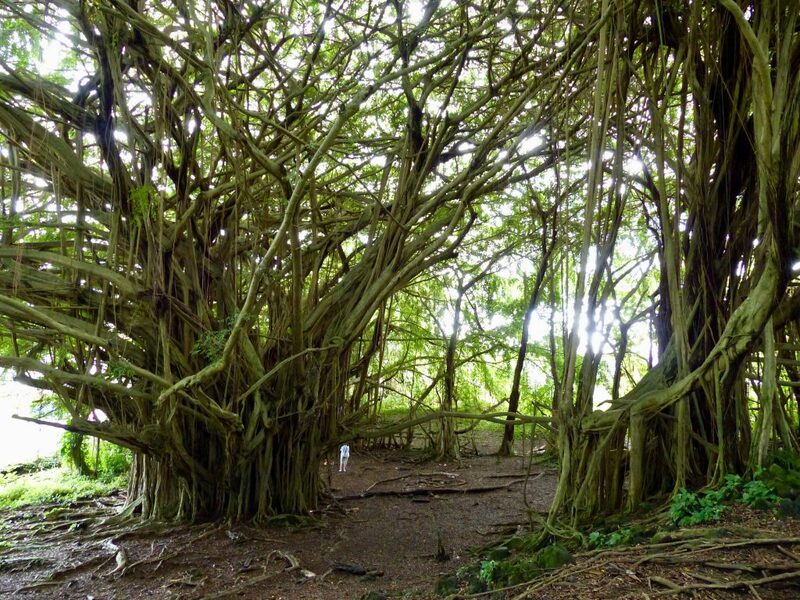 It was impressive… but the real stunner was the colossal banyan tree close by. Check it out below, and notice how tiny the person looks on the right side. 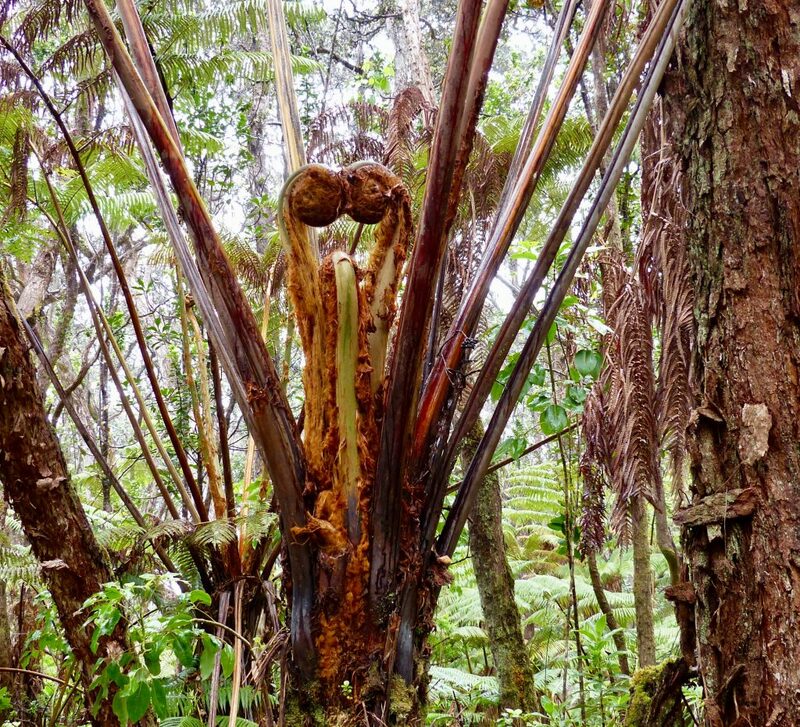 The massive root system to the right, is also part of the tree. 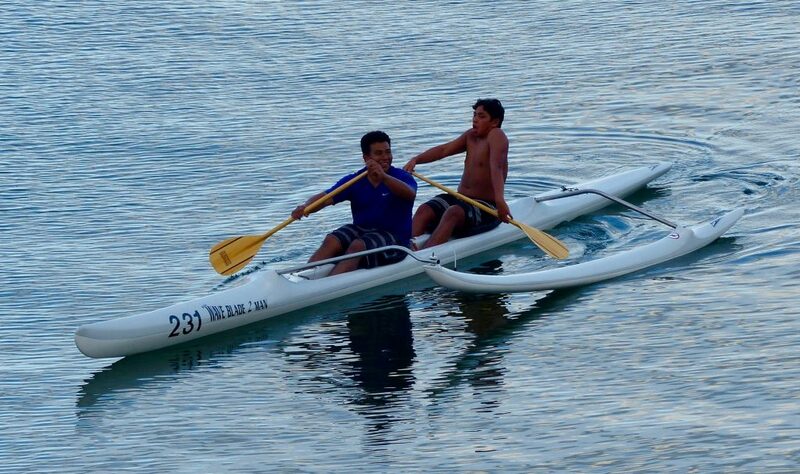 Back at the pier, we saw a modern version of the ancient Polynesian double hulled canoe which the local kids like to race. It seemed fittingly poetic, since most of the places we have been over the past 6 weeks were first populated by these amazing navigators, who had no instruments and simply used natural signs to find their way. Our Polynesian education started with Easter Island on February 20th, and ended here in Hawaii. 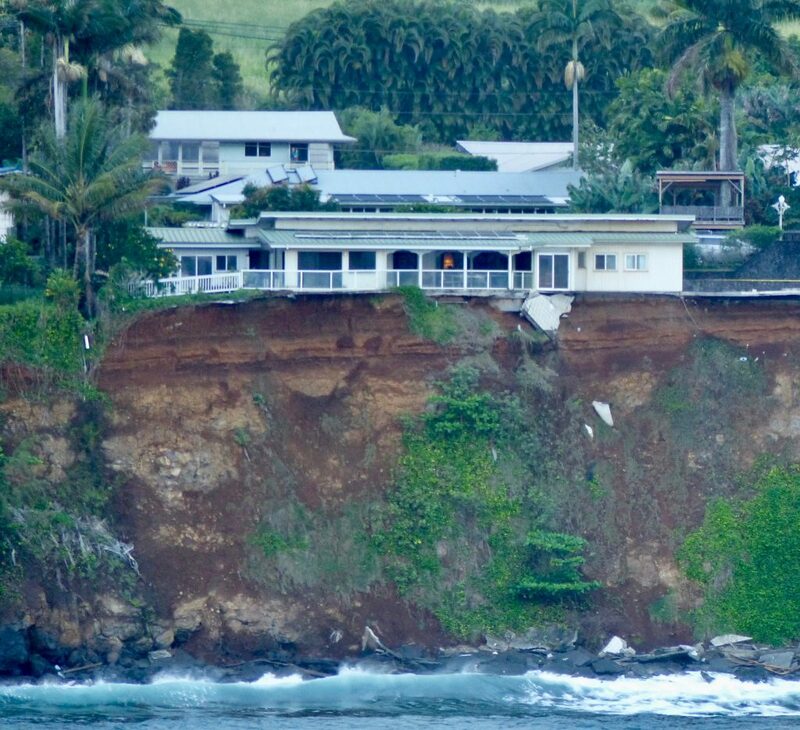 As we were leaving Hilo, the home below made us shutter. 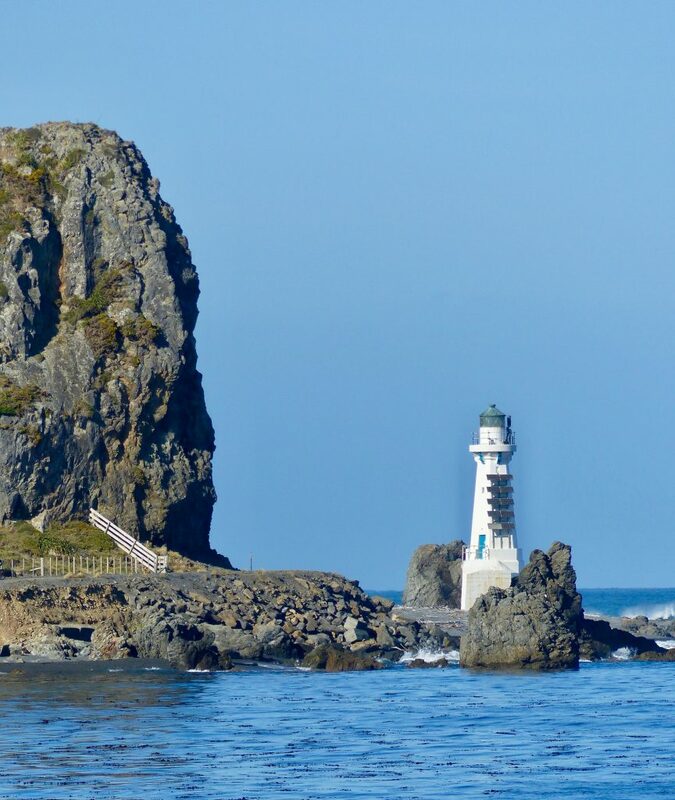 The cliff supporting it was carved away during the 2011 tsunami, but people are still living there. They must be chronically neurotic by now, wondering if they will wake up in the sea when they go to bed each night. That’s a bit to thrilling for me. 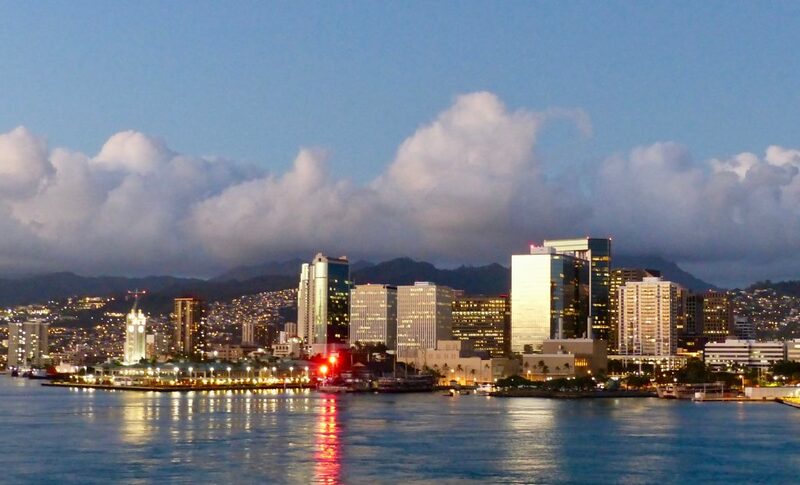 After leaving Samoa, we spent 4 days at sea before reaching Honolulu, the capital of Hawaii, on the island of Oahu. We crossed back over the International Date Line, so we had TWO March 25th’s. We got the day back that we lost in the beginning of March! 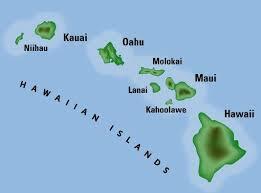 Hawaii did not become a state until 1959. It is comprised of 8 major islands. 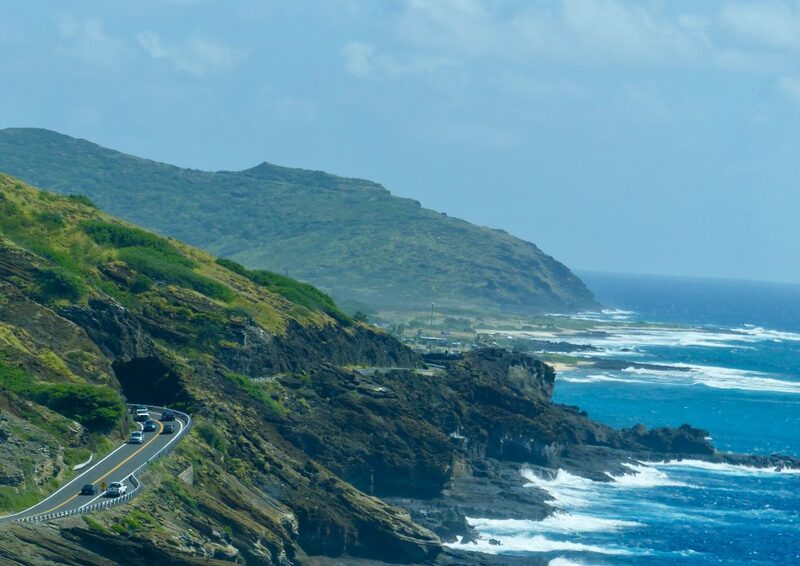 Most people live on Oahu, where the population is about 950,000. The islands were born between 25-40 million years ago by a series of titanic eruptions on the Pacific sea floor. This is still a very active volcanic zone, and many new islands are being birthed underwater. One in particular, called Loihi, should pop up above sea level within the next 200 years or so. Real Estate agents are already pre-booking lots for your future generations. Interested? I can get you a name. This was the end of the line for the Polynesians, who settled here 2,600 years ago. Did they continue east, seeking the next land mass? I think they tried. They were fearless voyagers who had an “exploration gene” in their DNA. Perhaps they died along the way from starvation, were lost in a storm, or maybe they turned back, before it was too late. 2,500 miles to present day California, with no islands to take refuge on along the way, would have been a daunting feat. Even for them. Modern history began in 1778 when Captain James Cook landed on a neighboring island during his search for the fabled Northwest Passage. On this occasion he was received as a “god”, but when he returned 8 months later, the attitude of the islanders had changed. He was killed during a skirmish, thus ending the life of a man considered to be the greatest cartographer of all time. For 10 years, during 3 voyages, he defied death on numerous occasions, mapped most of the world, and claimed countless lands for the British Empire. Once again, the Christian missionaries followed soon after, to reform the “heathens”. They started with the Queen. After her successful conversion, she decreed that the multitude of Hawaiian Gods were dead. The natives didn’t believe her. To convince them, she threw rocks into a volcano, known to be inhabited by Pele, the God of Fire. When Pele stayed silent, instead of spewing out the insulting rocks, the heartbroken natives assumed she was dead. But that’s not all. The Queen ordered the immediate destruction of all ancient religious icons, ceremonial grounds, and statues. Now, sadly, very few archeological remnants remain. The missionaries managed to systemically destroy all the ancient cultural beliefs of the Polynesians they converted throughout the 1800’s. It’s amazing really, when you think of the enormous influence they wielded. Not one of the islands we visited escaped their chokehold. How did the missionaries do it? Brainwashing? Torture? A promise of salvation or afterlife? Why was there no middle ground? Thankfully, many of the islanders we encountered have resuscitated their ancient traditions and are honoring their ancestors through storytelling, dance, music, and rituals. They are also actively teaching the younger generations about their traditional beliefs. They have to compete with the adornments of the modern world, but some of the kids we met are genuinely interested in learning about the “old ways”, which is heartening. 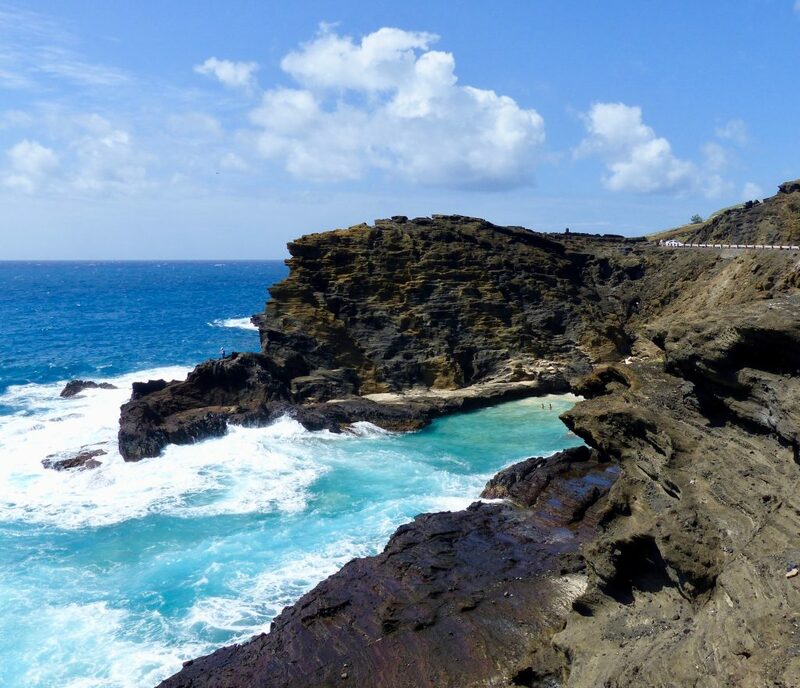 So, today we went on a 4 hour excursion called “Natural Highlights of Oahu”. 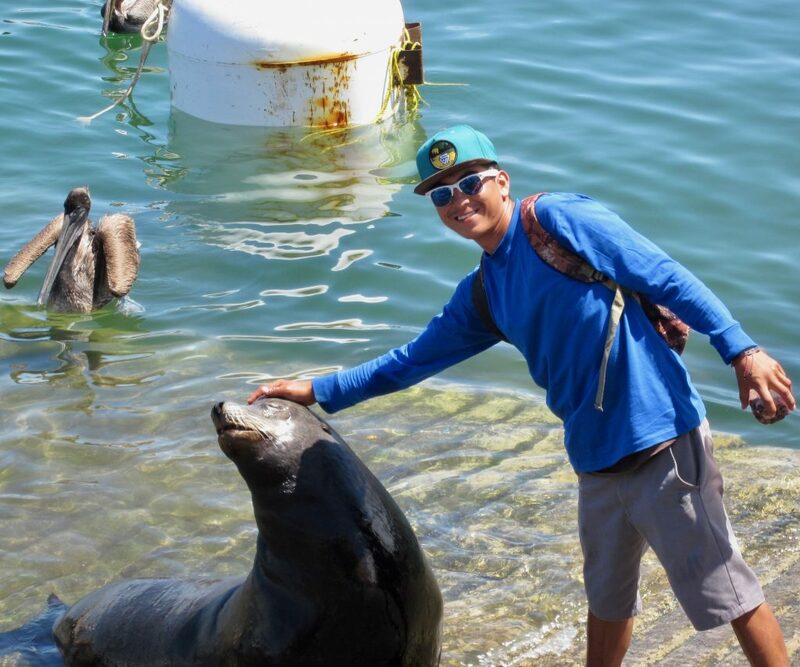 Our guide (Luke) is a graduate student from Chicago studying Ornithology (Birds) at the University of Hawaii. Now, remember, we are back in the good ‘ol, litigation happy USA… so before the van moved, we had to sign a waiver promising not to sue the tour company if we got hurt. This was not a big adventure tour, but we would encounter uneven ground. How pathetic is that? Other countries don’t care if you fall off a cliff because you are deemed responsible for your own actions. An attempted lawsuit would be considered frivolous, and scoffed at. Not here though. Where it’s always “someone else’s fault”. And, there are thousands of lawyers who will help you prove that. We were the only Americans in the group, and everyone else was perplexed by the form they had to sign. I kept my mouth shut, it was embarrassing. 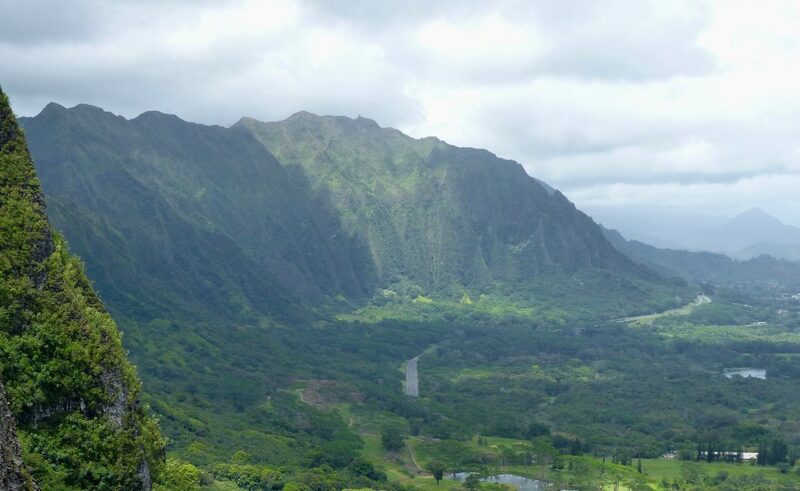 Luke told us that Oahu used to be a paradise for birds. There were no four legged animals here at all, before the Polynesians arrived with rats and dogs, which they ate for food. Later, the Europeans brought pigs and cats. Prior to these introductions, the only predators were eagles and hawks. 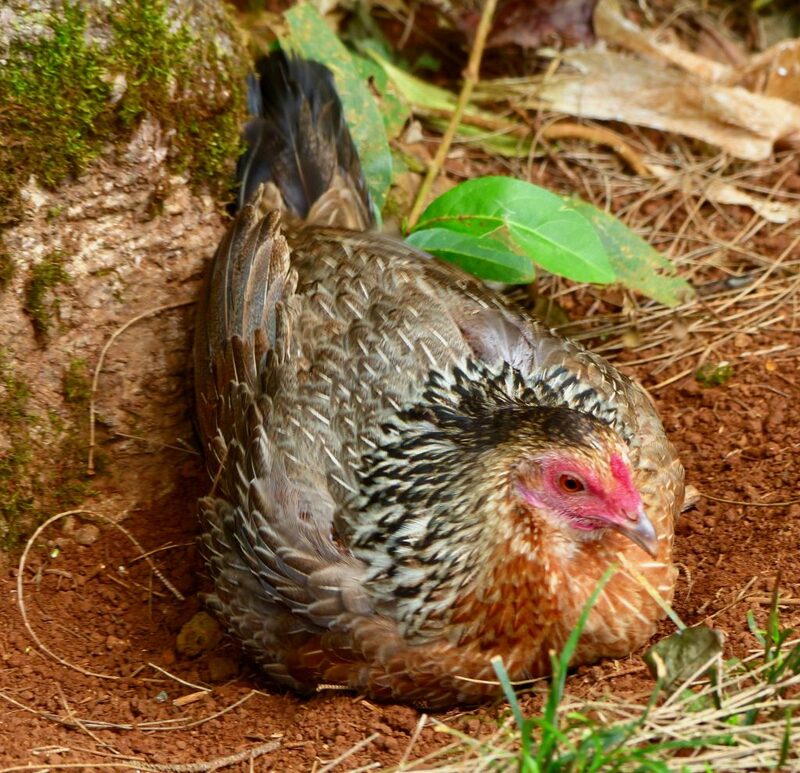 Many of the birds became “flightless” through evolution because they never had to worry about ground predators. Now, 75 bird species are extinct and over 100 more are on the endangered list due to predation by land animals who eat eggs and kill chicks. One of the biggest culprits is the mongoose. It was introduced to control the burgeoning rat population, and the experiment was an unmitigated flop. The mongoose is active during the day, when the rats are sleeping, so they never cross paths! What nincompoop came up with that brainless idea? 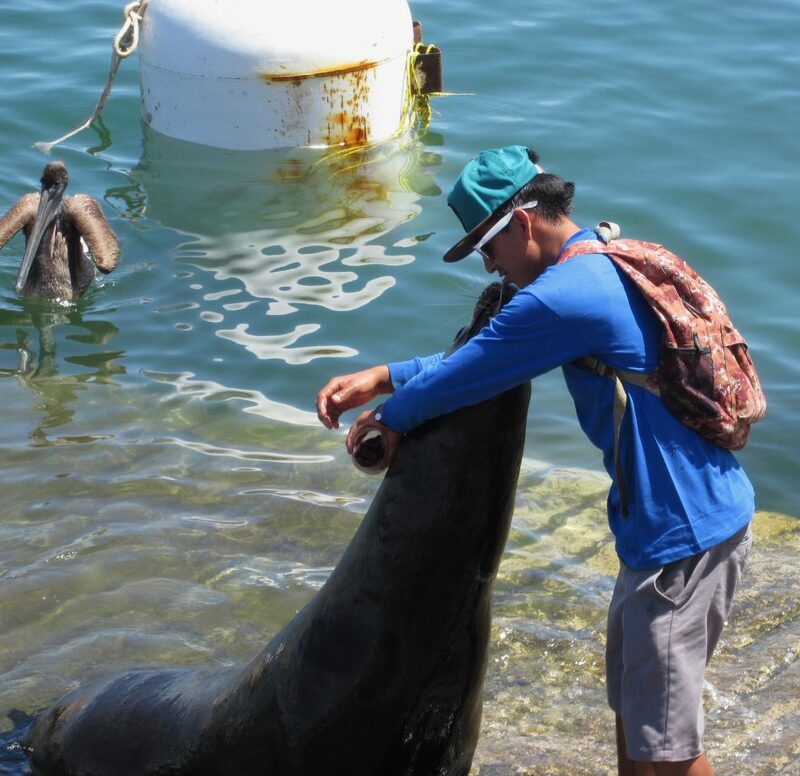 The only native mammals in Hawaii are Hoary Bats and the Monk Seal. There are no snakes, which is good news for the birds, and the Ophidiophobiacs. We drove through downtown Honolulu first. Luke said that thousands of acres of pristine marshland was filled in to create the concrete jungle of glitzy skyscrapers and endless parade of posh stores lining the main drag. It was not very appealing to us, but the “rich and famous” love it here. I was happy to get out of town. Our first stop was the mammoth Diamond Head Crater that we accessed through a tunneled entrance. The name came from the first sighting by the British in the late 1700’s. They mistook calcite crystals sparkling in the sun for diamonds. I am sure they were sorely disappointed when they figured it out. The Hawaiian name is Le’ahi, which translates as “brow of the ahi fish”. It describes the profile of the crater as seen from Waikiki Beach. 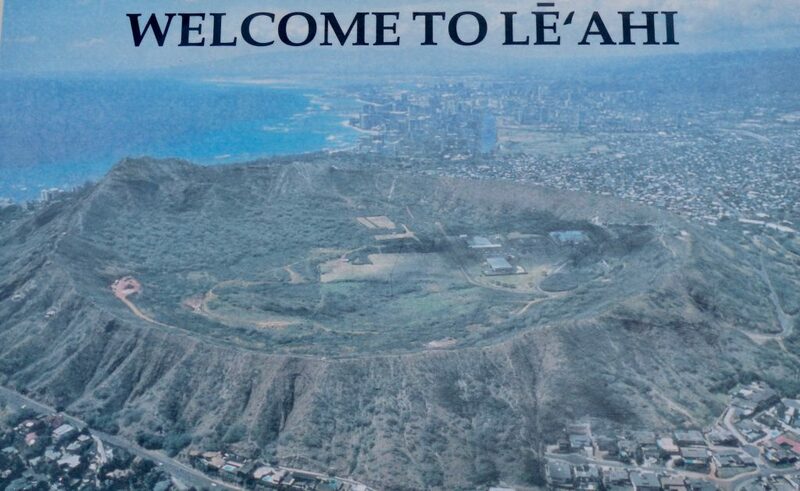 Diamond Head was selected as a fortification because the crater walls offered a natural defense. From the summit, ships could be seen from Koko Head to Pearl Harbor. Fort Ruger began in 1908 with the construction of Battery Harlow on the outer slopes. The crater was a restricted military reservation from 1908 until 1976, when a portion was opened up for recreation use. It is still used by Civil Defense, the FAA, and the Hawaiian National Guard. The artillery was dismantled in 1950. None of the guns were ever fired during a war. The crater was declared a National Natural Landmark in 1968. You can hike up the side, but we did not have time today. Here is a photo I took from an information board. You can see just how huge it is. Now, imagine it full of boiling lava. Pretty cool, huh? The rest of our time was spent on short nature walks along the coastline and in the mountains. 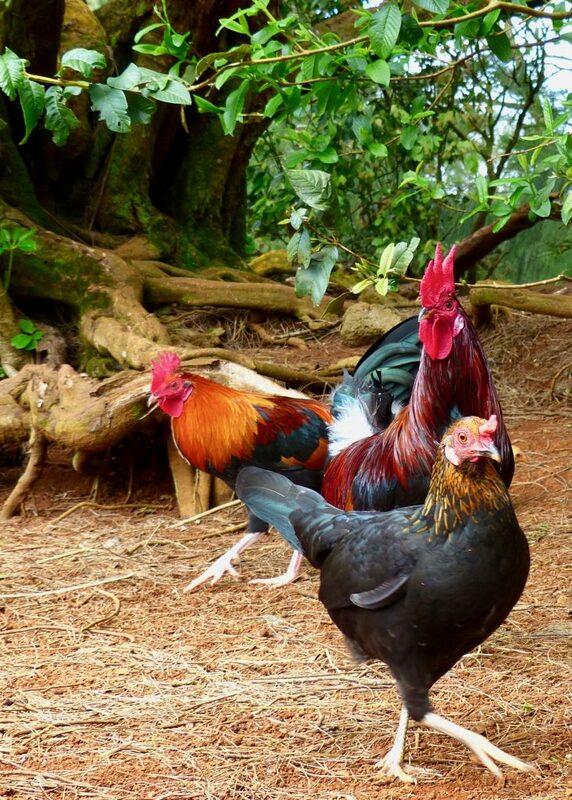 A highlight for me were the magnificent wild chickens and roosters we came across. They are “protected” as part of the culture, which is just kooky. Chickens? Protected? It is illegal to “corral” them, but people do it. The local kids were giggling at me for taking so many photos. They just wouldn’t hold still (the chickens, not the kids). 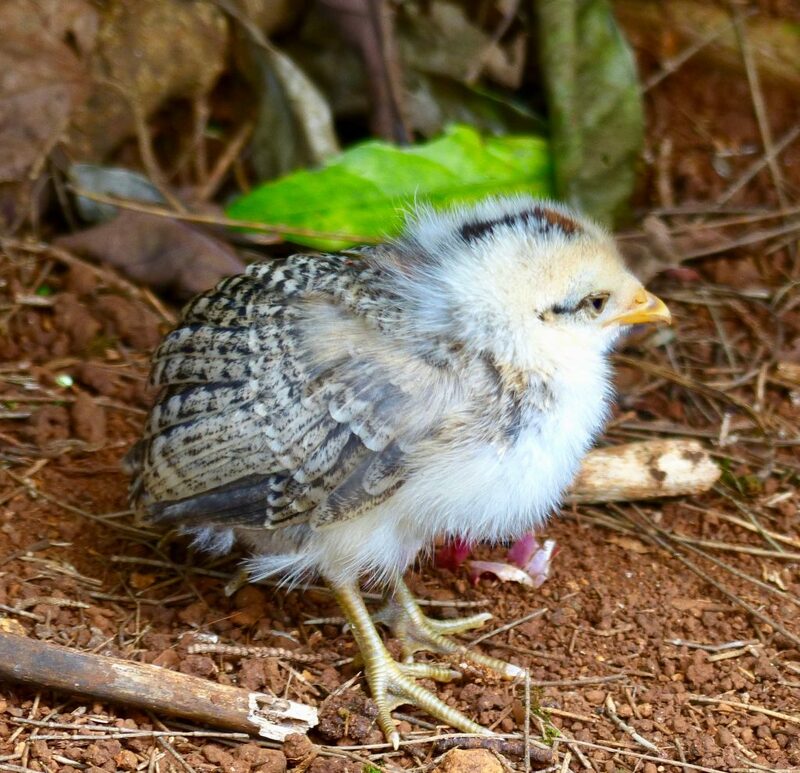 What an Adorable Baby Chick! In the afternoon, we headed into town on foot from the pier. Luke told us that Chinatown was only a mile away from the ship. His estimate was way off. An hour later, we finally got there, and it was a big disappointment. Many storefronts were empty, and the energy was languid and depressing. There were thick bars on most shop windows, never a good sign. Cops had a strong presence. Iconic old buildings from the early 1900’s were crumbling. 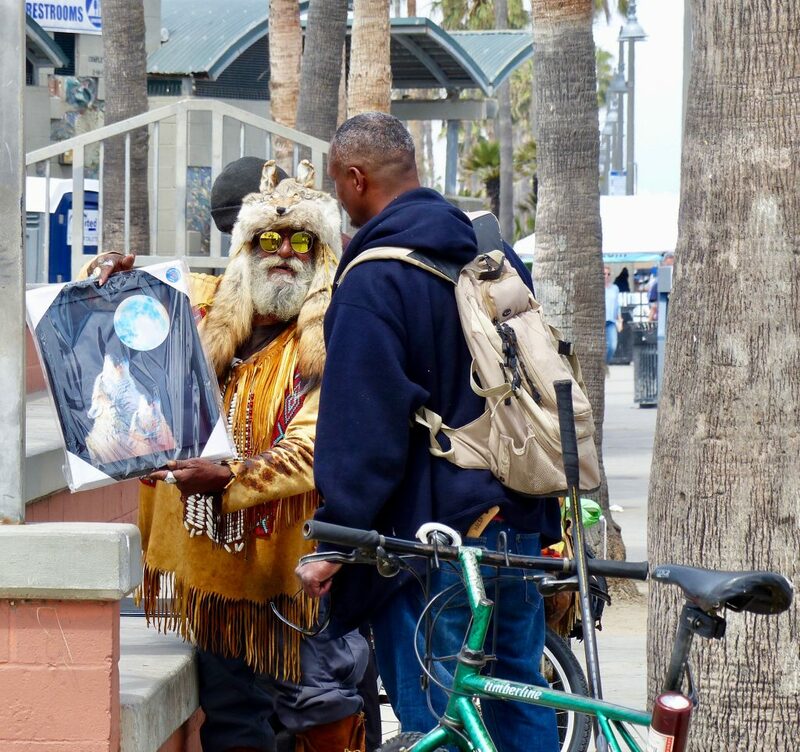 Homeless people dotted most street corners and some were raving about injustices, real or imagined. A few looked menacing. I was looking forward to a good Chinese meal, but we didn’t find anyplace that looked sanitary enough to eat in. We were starving, and ended up at McDonald’s (don’t judge!) out of desperation. Tiffany’s, Sax Fifth Avenue, and Brooks Brothers is only two miles from here. Perhaps they could put up some money for urban renewal. It was very sad to see Chinatown in such decrepit shape. Especially since 50% of the population here is Asian. We left Honolulu at sunset. Next stop, Hilo, Hawaii (aka “The Big Island”). 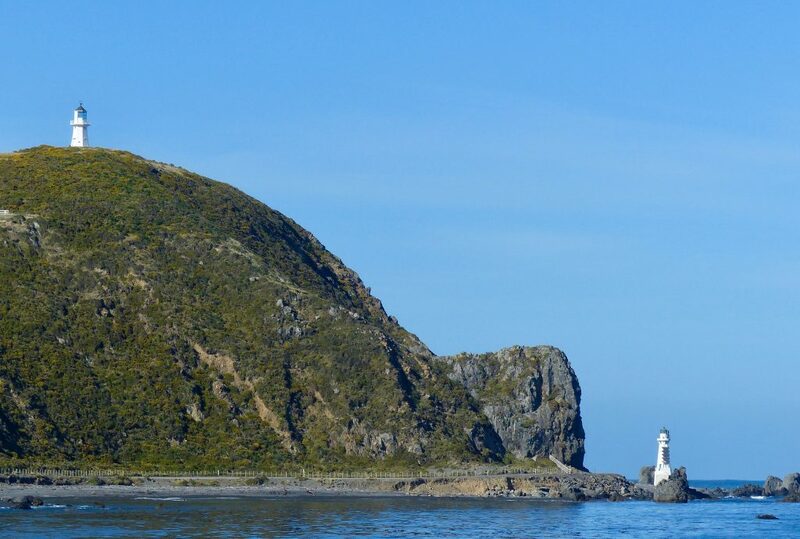 After leaving Wellington, we cruised along the entire east coast of the north island before waving goodbye to New Zealand and starting our journey back east. 4 days in the eerily tranquil Pacific on the way to Samoa is just what I needed to catch up on my writing. It’s a challenge concentrating on gigantic wave days, as my brain and stomach slosh freely in their respective cavities. I am very grateful for the hiatus Mother Nature bestowed on us. She’s probably resting up for the next showstopper. I hope so. 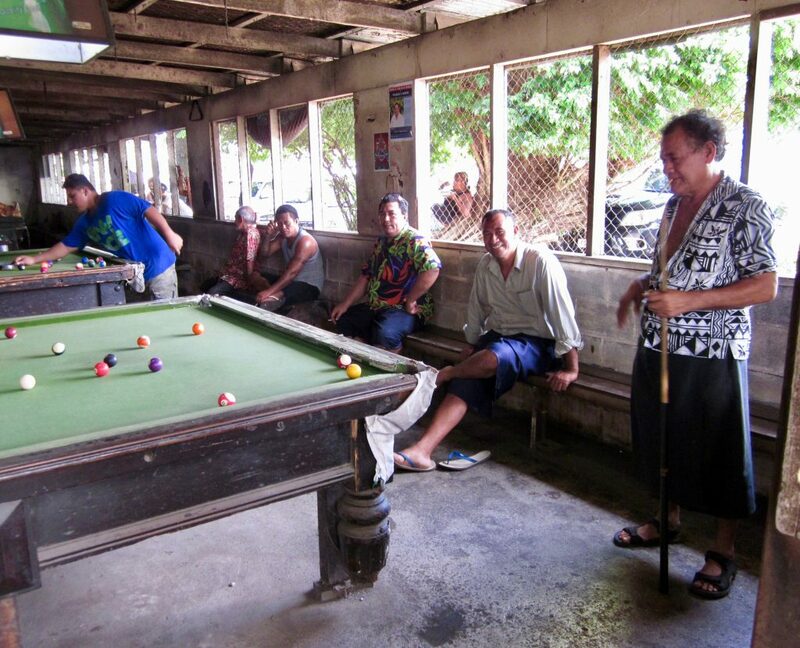 The Samoan group of islands are 2,300 miles SSW of Honolulu, 2,700 miles NE of Sydney and 1,800 NE of Auckland. They are only 14 degrees south of the Equator, so you know what that means by now, right? Super hot and sticky. Yuck. 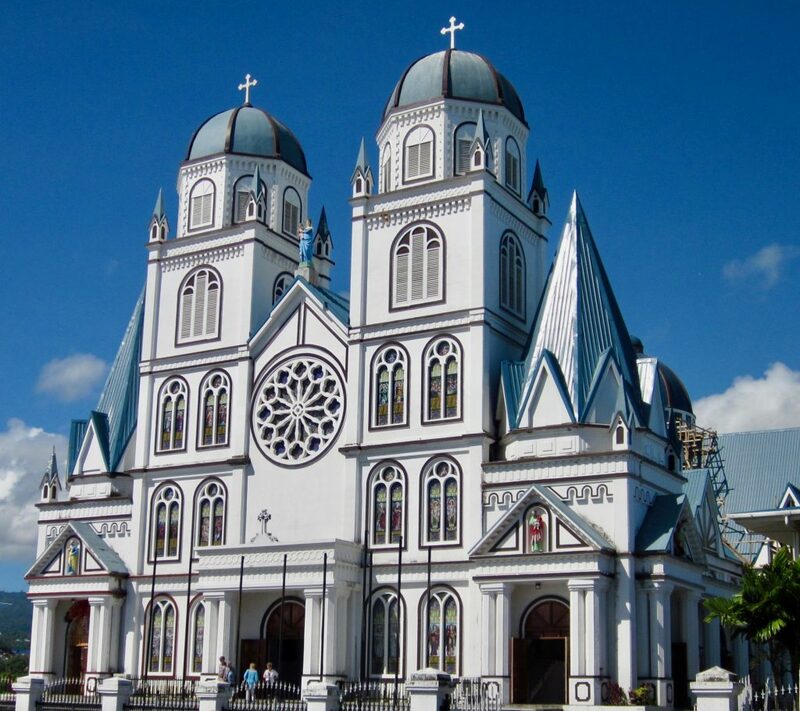 On the 24th we arrived in Apia, the capital of Samoa, on the main island of Upolu which is 44 miles long and 10 miles wide. This group of 6 islands used to be called “Western Samoa”, but they dropped “Western” from the name in 1997. Samoa was granted independence from New Zealand in 1962. The population is 194,000. 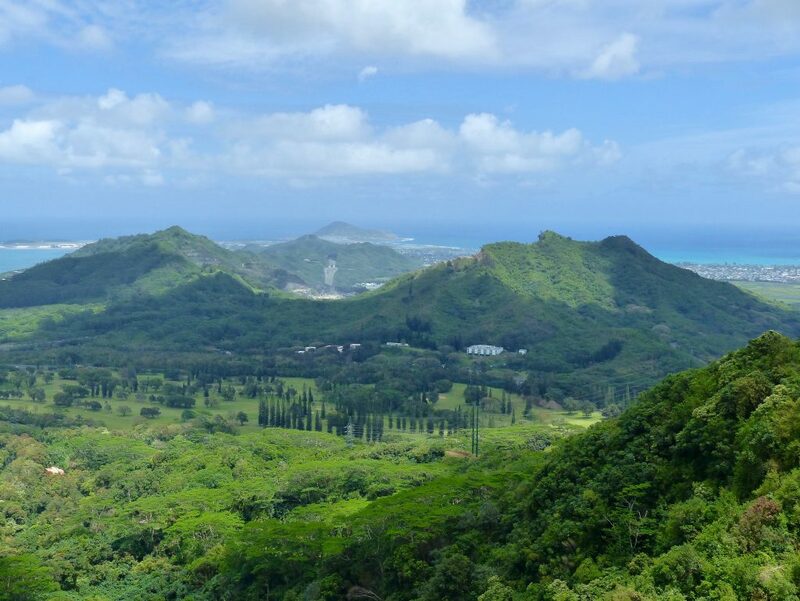 Most of the inhabitants live on Upolu. Of course, the Polynesians were here for thousands of years before colonization by the Europeans started in the 1825. Soon after, Samoa because a haven for runaway sailors and escaped convicts. It was a very unhealthy place full of nakedness, free love, and rampant disease, just like Tahiti. And, just like Tahiti, the missionaries soon arrived to “straighten them out”. 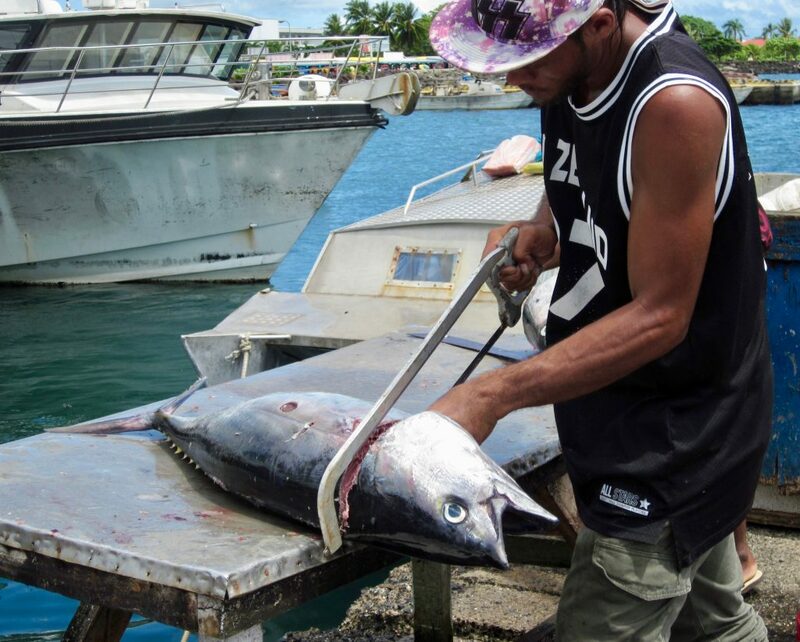 Now, most Samoans follow Christian traditions. 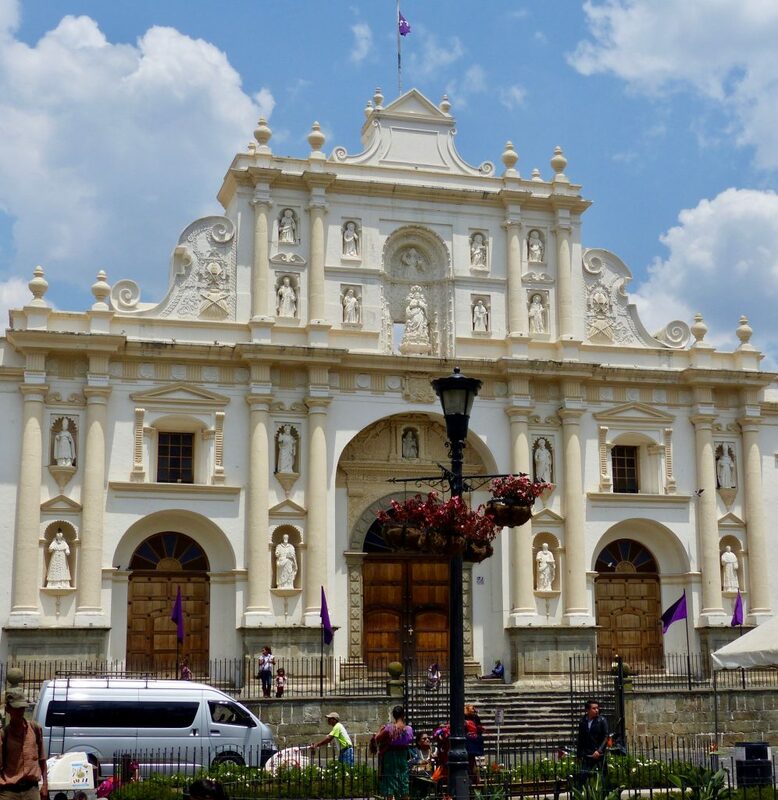 There are a myriad of churches here, but the Immaculate Conception of Mary Cathedral pictured below stands out in the downtown area. Check out the gorgeous wood ceiling. It was 96 degrees by 10 am, and I thought I might burst into flames as we left the church (because of the heat, not sins) and crossed the street to reach the Samoan Cultural Center. We collapsed on plastic chairs under the thatched roof of a cabana, grateful for the shade. A speaker was on stage describing the process for making tapa; a papery cloth derived from mulberry tree bark. The bark is stripped from the branch, then pounded with a wooden mallet to flatten. Next, it is scraped vigorously with a clam shell to thin and stretch the material. After it dries, individual pieces are glued together using tapioca root and water. Only two colors were used for paint. The red-brown hue came from local mud and the black is ash from the mulberry branches that was burnt after the bark was striped. 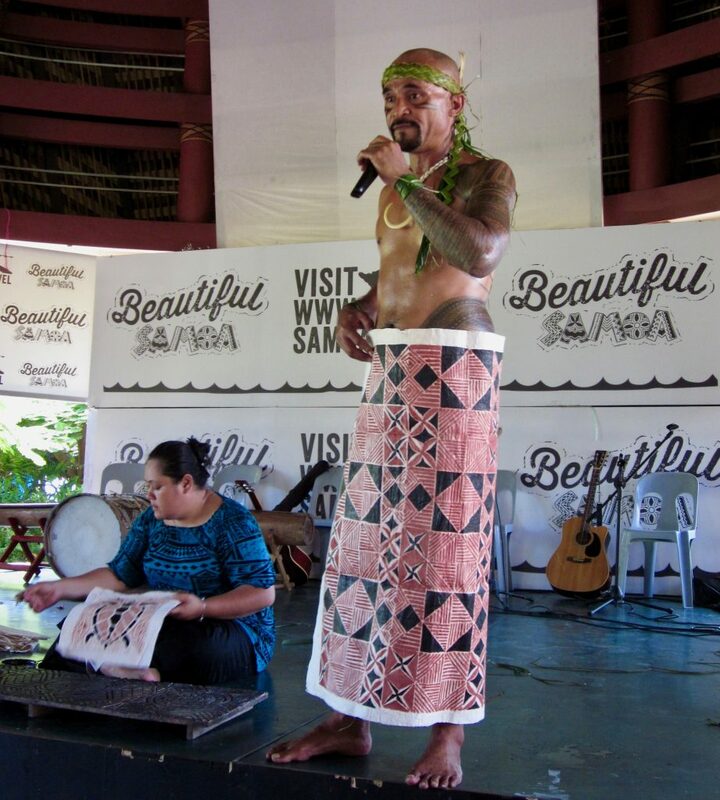 The traditional garment made from tapa is called a called a Lava Lava, and it’s worn around the waist. It was used during special occasions, like weddings and funerals, when a grass or leaf skirt was not considered formal enough. It cannot get wet or be folded without ripping after it dries, so they are not worn to run to the supermarket. I assume that sitting down was not possible either. Here is an example of the finished product. Next, we learned about the traditional male tattoo design, called the pe’a. Did you know that “tattoo” originates from the Samoan word tatau? The same design tools used 2,000 years ago, are still used today. The skill is often passed down from father to son. Combs of various sizes, made from sharpened boar’s teeth, are fastened together with a piece of turtle shell and attached to a wooden handle. A 2 foot long mallet, made from the central rib of a coconut palm leaf is used to hammer in the designs. The black dye is made from the soot collected from burnt tree nuts. The inked area is massive, from the knee to above the navel. When a Lava Lava is worn, the tattoo shows above it. There are large sections of solid ink, including around the groin. And, the process really really hurts. A lot. Check out the picture below. In the old days, every young man was tattooed as a rite of passage, and the risk of death by infection was huge. Now, only about 5% of men do it, and it is considered an act of bravery. This is where it pays to be skinny. Thin guys are under the needles for about a month, at 4 hours a day. Fat men, two months or more. The belly button is the last part to be done, and it is shear torture. If a man starts the process, but gives up, he is labeled a coward. The unfinished tattoo is a “mark of shame”. But it doesn’t end there. His entire family is shunned as well. Now, if a man in the USA chooses a tattoo of a 6 masted schooner, and it hurts to much when the hull is being chiseled, he can always turn it into a dingy without being snubbed. That’s not an option in Samoa. We also learned that at the end of December 2011, Samoa jumped forward by one day, omitting December 30th from their calendar. 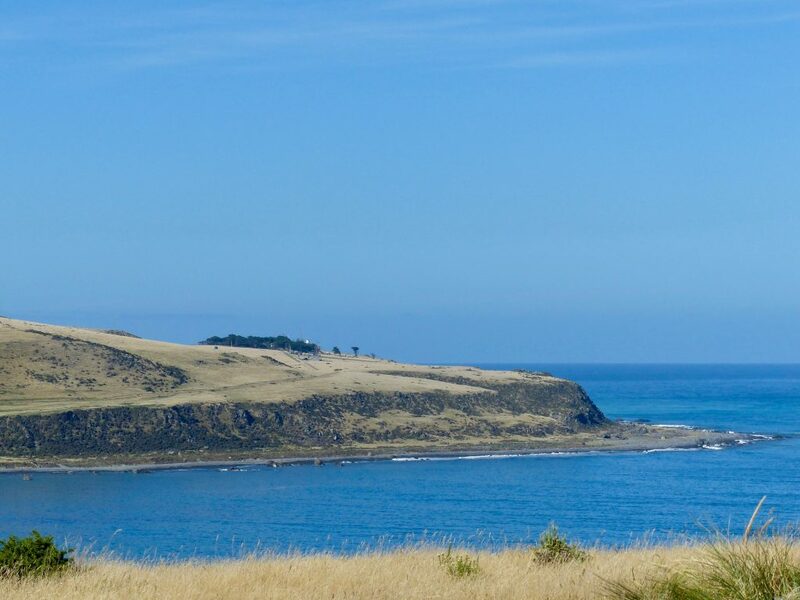 The nation moved to the west of the International Date Line, so that business dealings with Australia and New Zealand could be conducted more easily. Before this change, Samoa was 21 hours behind Sydney. After the change, they were 3 hours ahead. The previous time zone was implement in 1892, because business with Californians was paramount then. Not anymore. From the Cultural Center, we went to check out the fishmongers. Most had packed it in for the day. The remaining diehards lethargically fanned the decomposing fish with palm fronds to keep the flies off. Some looked ripe for salmonella with cloudy eyes and a funky smell. It didn’t bother the shoppers though, who were unperturbed by the lack of refrigeration. 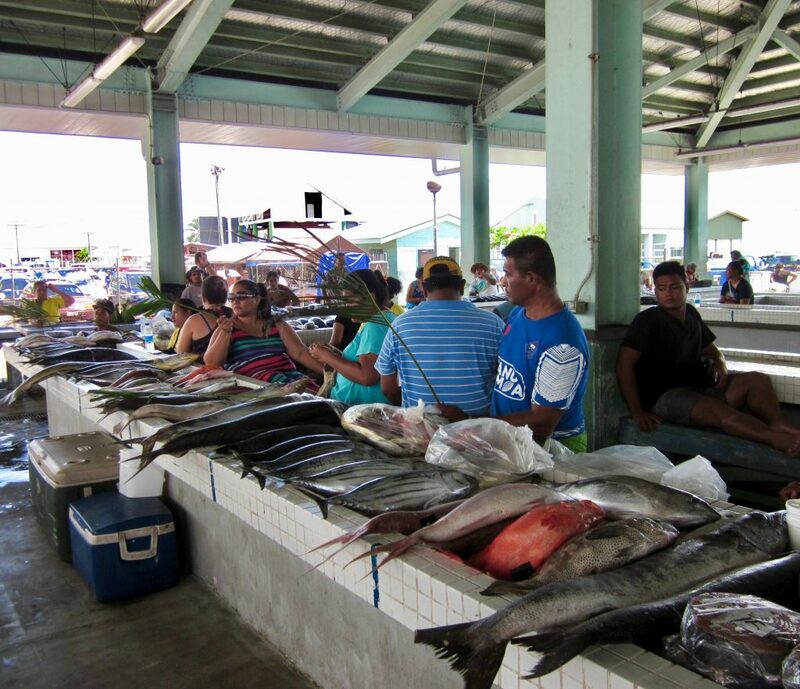 Behind the fish market, we strolled among the commercial docks looking for fisherman to chat up. We didn’t see any, but ran into these characters who insisted on posing with a Yellow Fin Tuna head. Too funny! 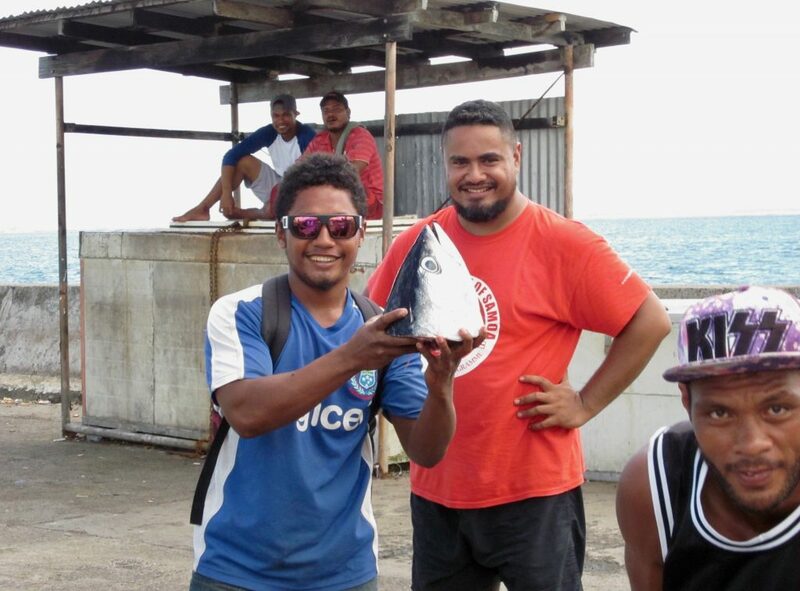 Funny Guys with Tuna Head! The eye candy continued at the bus station. Every public bus is painted in vibrant designs and colors. And, there are competitions to see who can play music the loudest when leaving the station. The driver owns the bus, and each outlying village has at least one, depending on size. 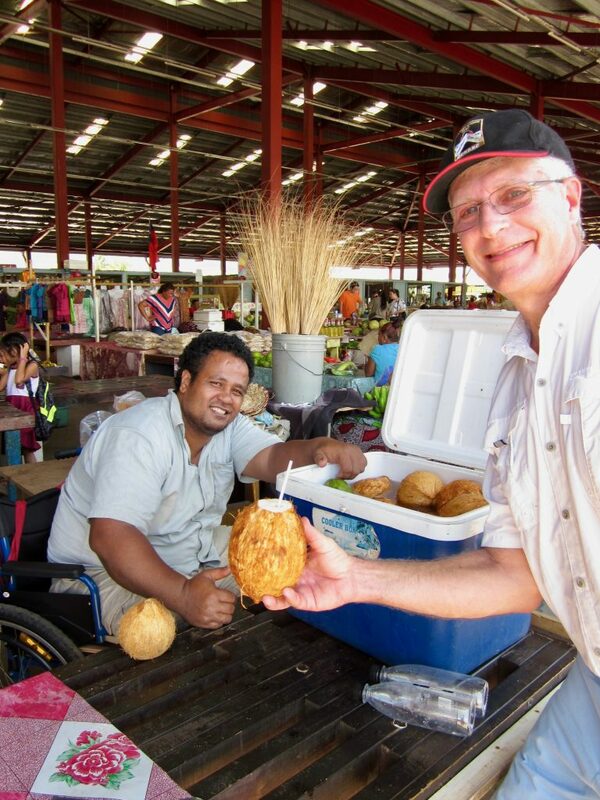 They shuttle workers and shoppers in and out of Apia throughout the day. The buses are usually packed beyond capacity, and, here’s a cultural shocker for those of us who value personal space… if you have a seat, don’t be surprised if someone sits on your lap! How would that go over in the USA? After we left the buses, we saw men milling around inside a low metal roofed building with chicken wire for windows, so we strolled over to investigate. It was a pool hall. A man at the padlocked entrance waved us over, and invited us in. So of course, we went. The padlock seemed a bit unnecessary during the day, but it was an “exclusive” private club, so there you go. There were about 20 tables, all in various stages of decay. Most of the wooden legs were warped and splintered. The bumpers were covered in duct tape. But none of that mattered to the guys. They were serious players, and this was their oasis. Check out the fancy corner ball pocket in the photo below. By now, we were zapped by the heat, and after a quick stop at the outdoor market for a fresh coconut water, we headed back to the ship. We lasted for 6 whole hours! I was amazed! We had a wonderful sampling of local life, culture, and traditions. Fresh Coconut Water is Very Refreshing! 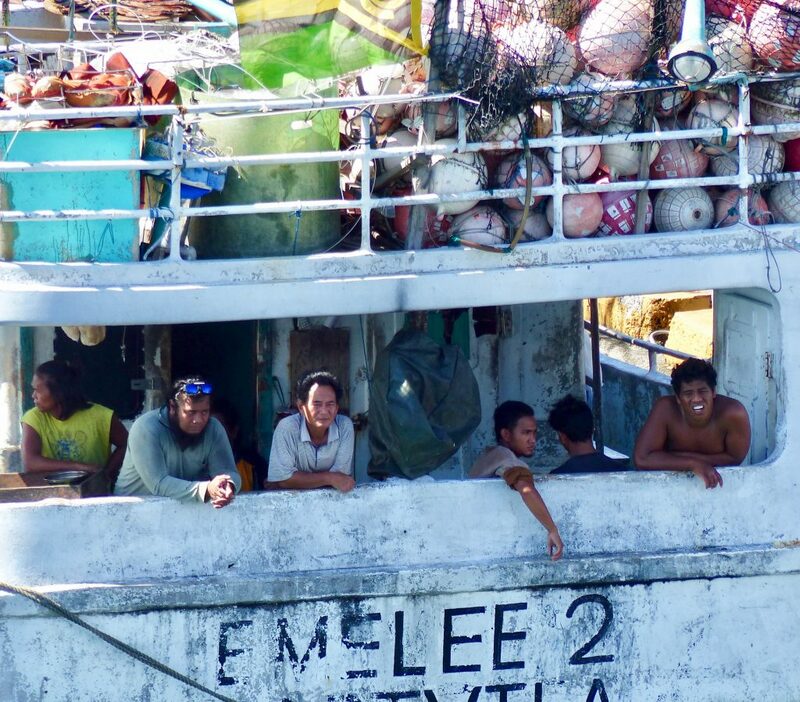 Back on board, I snapped a photo of this motley crew hanging out on the back of a beat up fishing boat. Check out the sparkling white teeth on the guy, far right. I’d like to know what toothpaste he’s using. Check out the White Teeth – Guy on the Right. 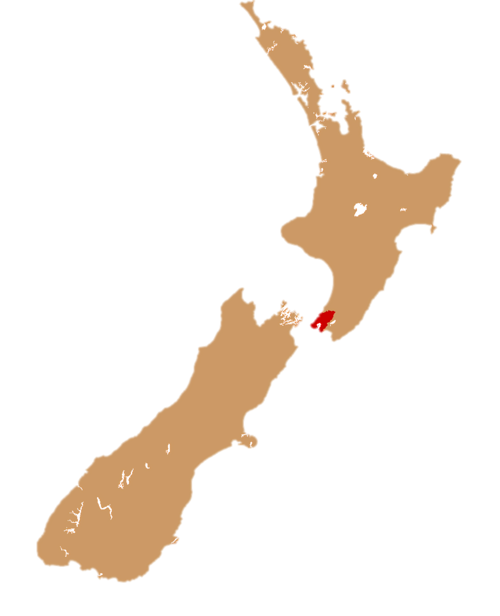 Wellington was founded in 1839. The capital was moved here from Auckland in 1865, due to it’s centralized location. The population is 405,000. It has been named the “world’s windiest city”, for two reasons. First, it is firmly anchored in the Roaring Forties, which are strong westerly winds found in the Southern Hemisphere, between the latitudes of 40-50 degrees. The intense west-to-east air currents are caused by air being displaced from the equator towards the South Pole, and the earth’s rotation. There is nothing to break the wind here. Australia is the closest landmass to the west, at 1,200 miles away. 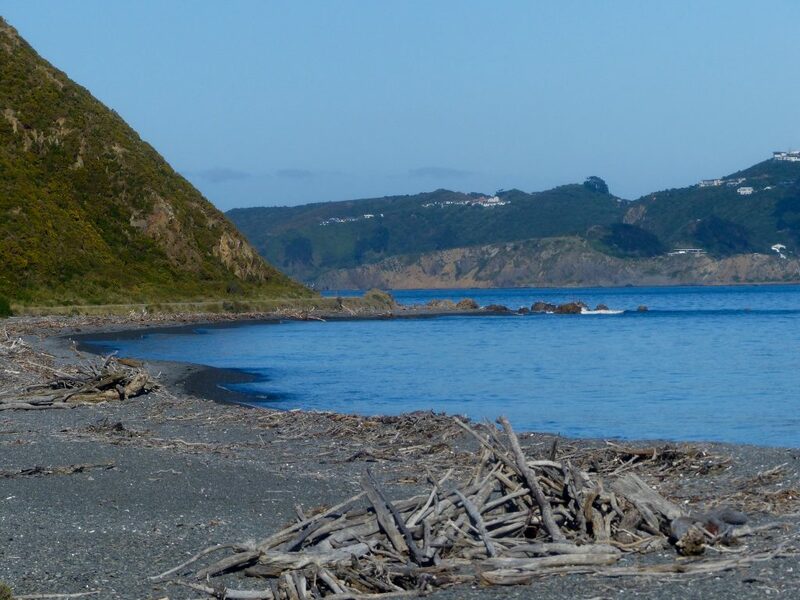 Second, the already high winds often reach gale force because they are funneled through the narrow body of water called the Cook Straight, which separates the north and south islands of New Zealand. But, get this. Mother Nature did not produce a single a puff of wind, all day. I was irked. I wanted to experience the legendary shrieking howl of the westerlies. The ones known to catapult ships into the jagged volcanic rocks that lurk in the harbor. But. No. Instead, we got a day that Wellingtonians fantasize about. Zero wind. 72 Degrees. Dazzling cloudless sky. What are the odds? 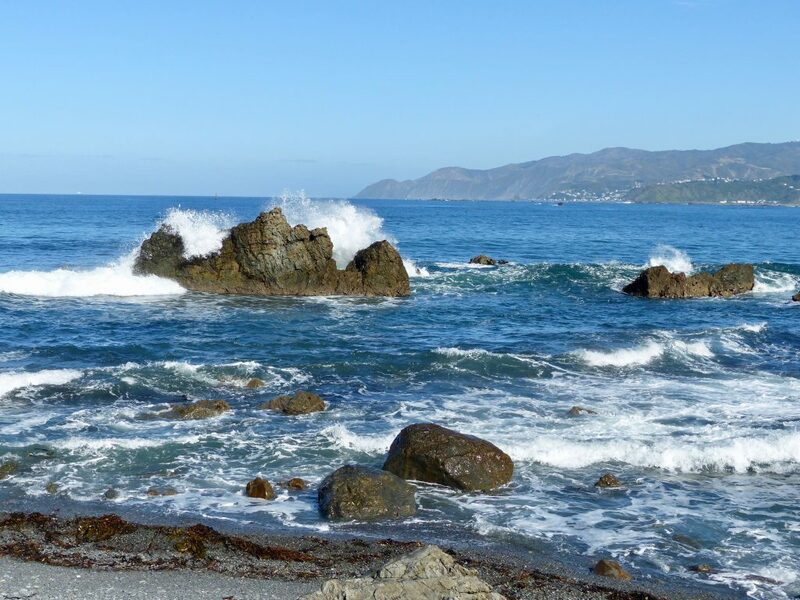 We had pre-booked a tour called “The Storm Coast”, which would take us to the easternmost point of Wellington Harbor along a very treacherous stretch of coastline known for shipwrecks. The last 3 miles of dirt road had huge chunks missing. Our guide told us that waves usually break against the windows of the bus, and he tried mightily to paint that dramatic picture for us. That’s a tough job today, but the views were splendid, indeed. At the end of the rutted road, is Pencarrow Station. 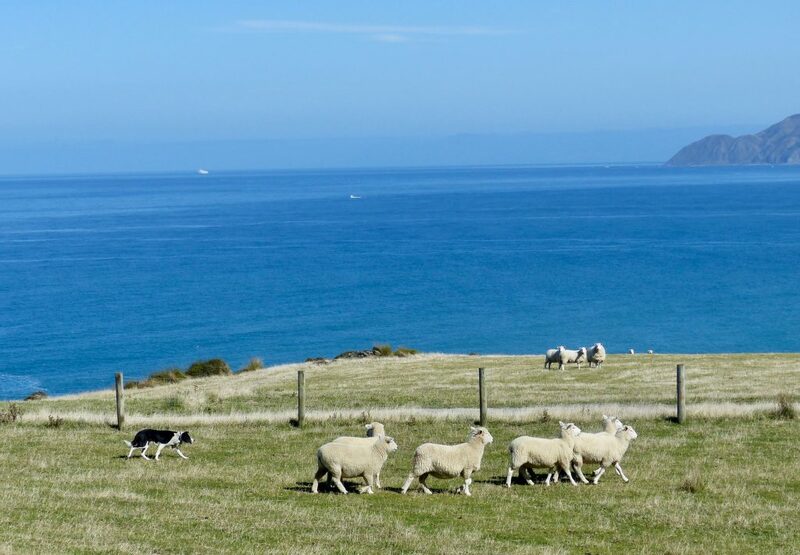 A 3,000 acre sheep farm. 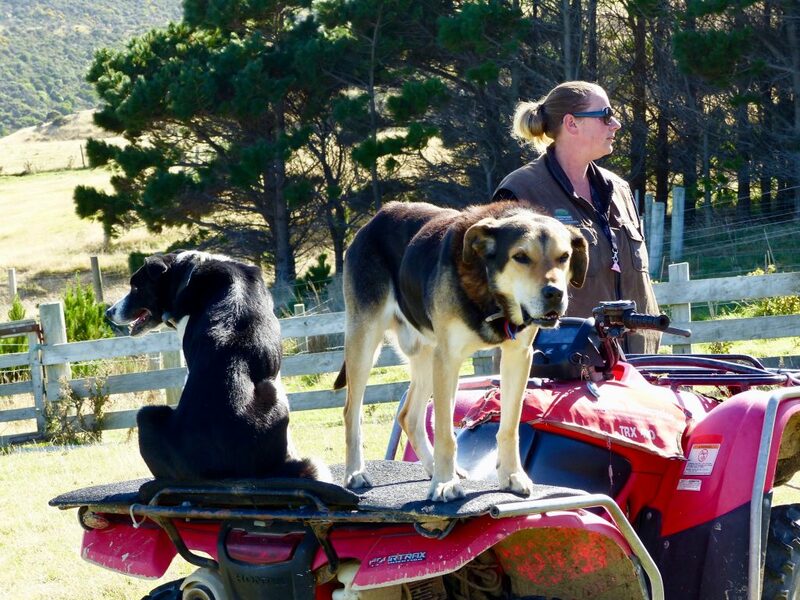 We had morning tea here, before watching a herding demonstration by a ragtag pair of sheepdogs. Okay, now I’m happy it’s not windy and raining. I admit it, I’m fickle. The views were extraordinary. Back in town, we were dropped off on the waterfront. 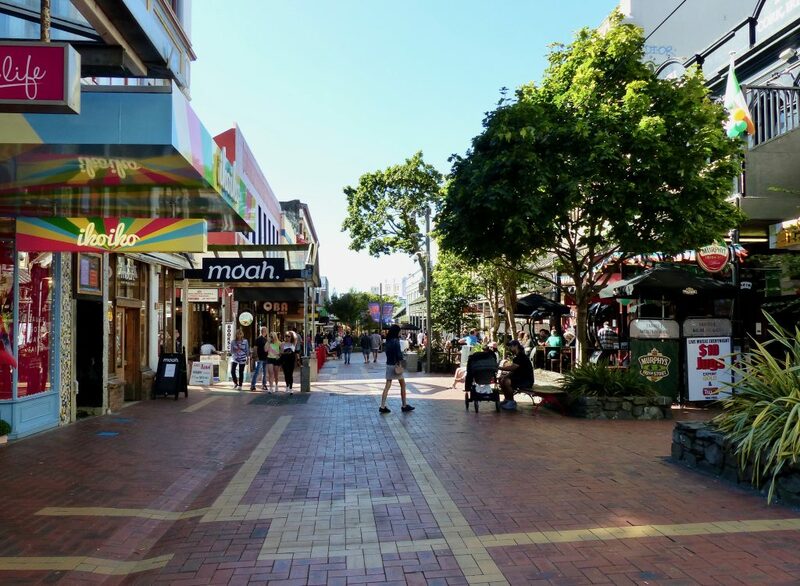 It is Saturday, and because of the bizarre weather, every single Wellingtonian was out relishing it. The promenade lining the harbor was packed. 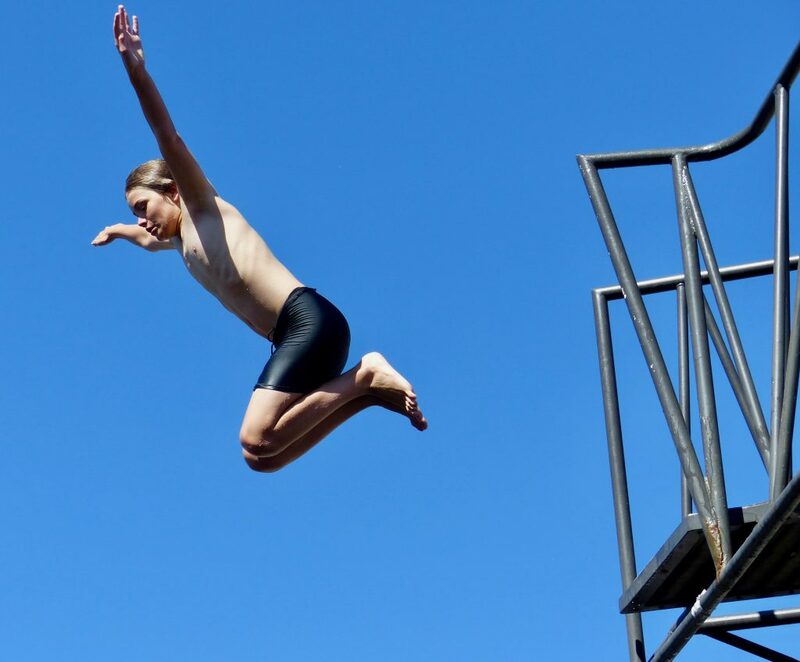 As we strolled along, we noticed a 20 foot high diving platform with a hefty queue of teenage kids. It was so odd, right in the city! 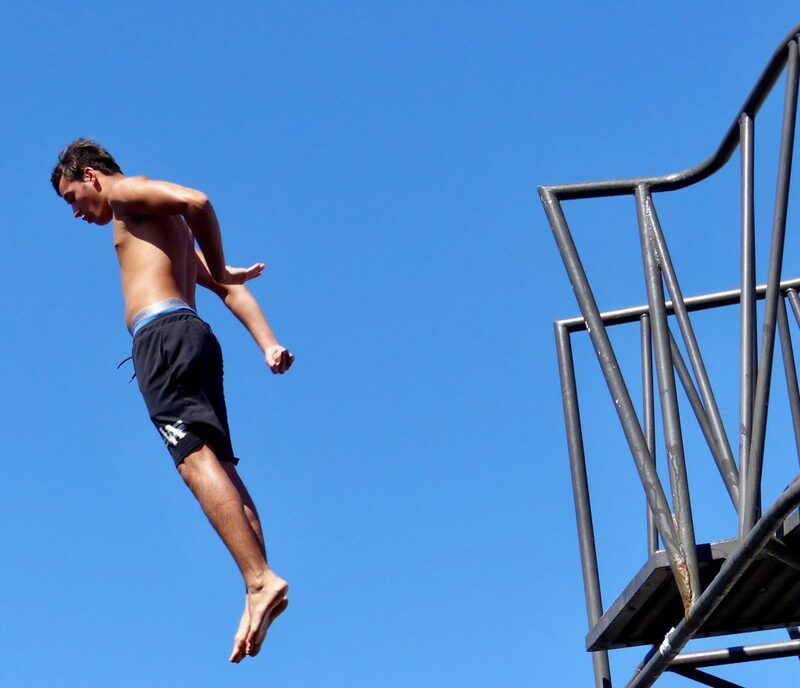 Most of the jumpers were competing to see how thoroughly they could soak the spectators with their splash. 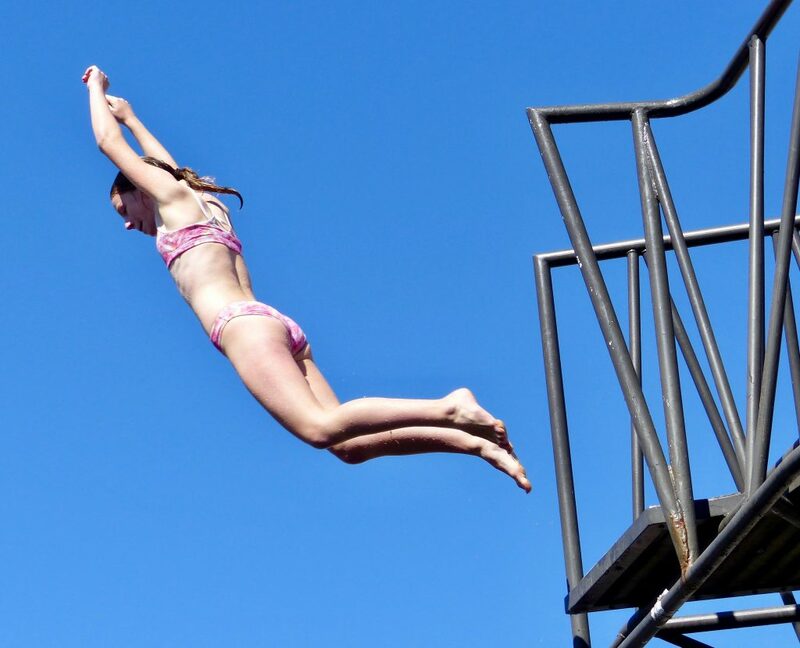 The more serious divers could be future olympians. Keep an eye out for them. We ate lunch in a spirited pub, and the locals at the next table starting chatting us up, when they heard our “strange accent”. 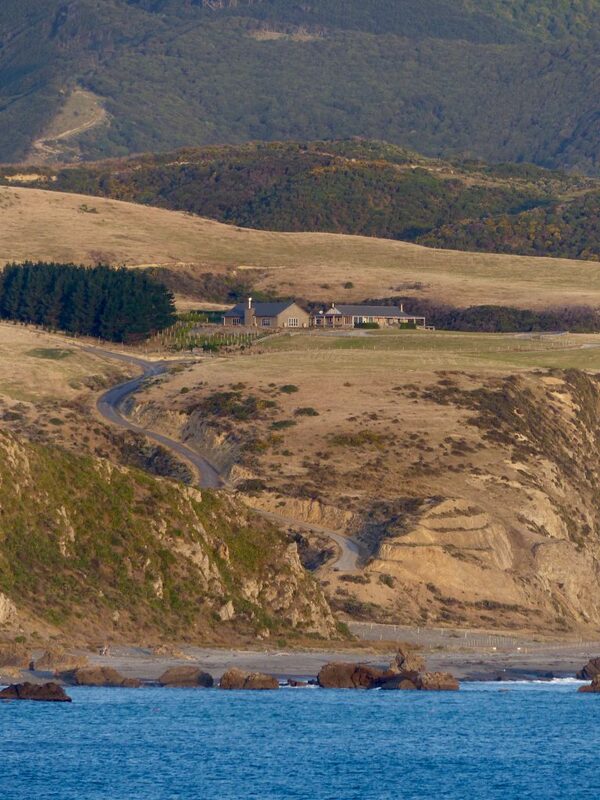 We learned that Wellington was the backdrop for many of the scenes in the Lord of the Rings Trilogy. Very Cool. I will rent the movies when we get home. And, New Zealand was the first nation in the world to grant women the right to vote in 1893. That was 27 years before the USA! After lunch, we happened upon a pedestrian mall lined with trendy shops and bars. There was not one single piece of trash on the ground, and no cigarette butts. Anywhere. Every single place we have visited in New Zealand is sparkling clean. There is a tremendous “pride of place” here that is unparalleled in any other country, included my own. 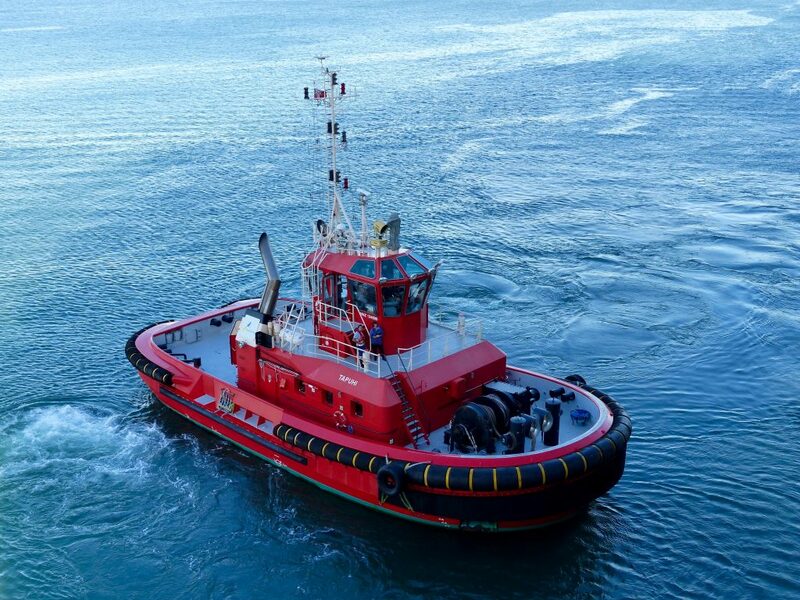 Even the tug and pilot boats that guided us out of the harbor are pristine. Not a flake of rust on either one. As we left the harbor, we spied Pencarrow Station in the distance, just as the wind started to stir. Within 10 minutes, it was howling. Thank you Weather Gods. We had a perfect day. Next stop, Samoa. Stay Tuned. © Cynthia Gray and cynthiagraywrites.com, 2018. Unauthorized use and/or duplication of this material without express and written permission from this site’s author and/or owner is strictly prohibited. Excerpts and links may be used, provided that full and clear credit is given to Cynthia Gray and cynthiagraywrites.com with appropriate and specific direction to the original content.